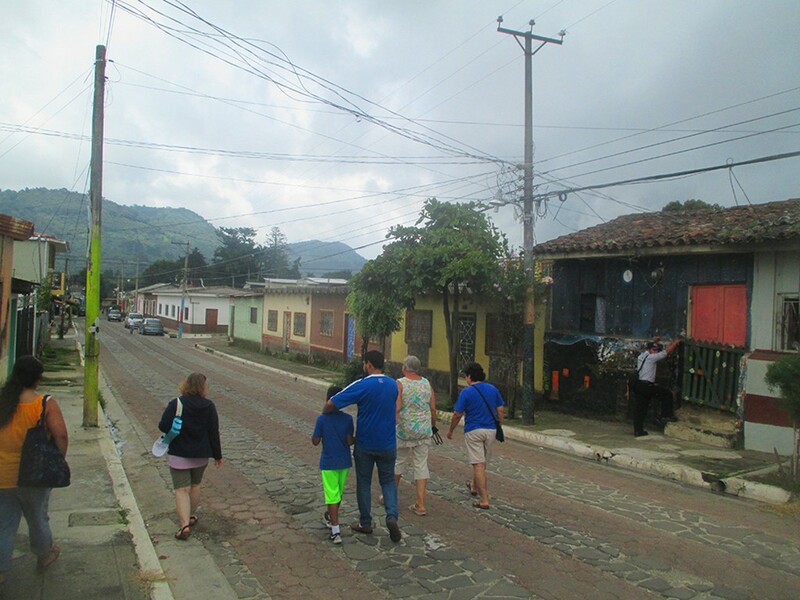 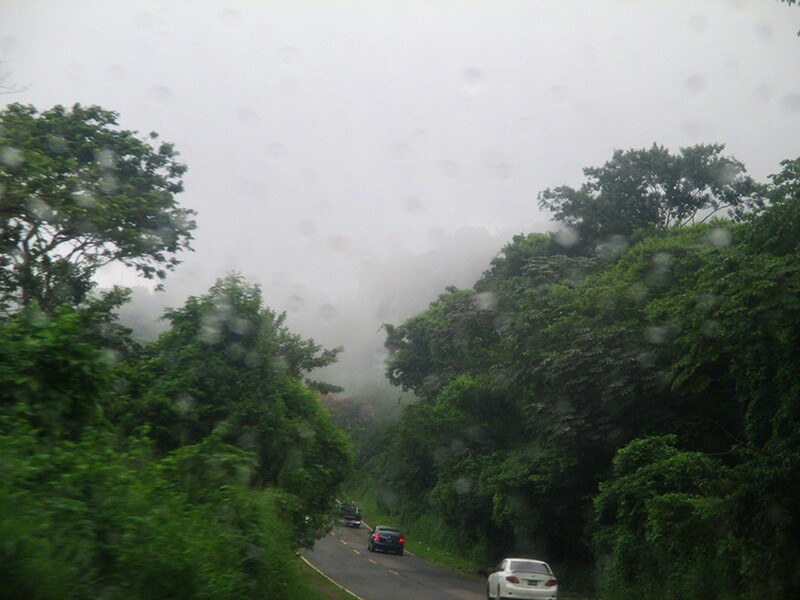 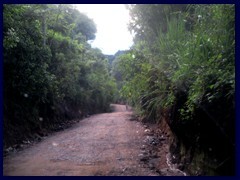 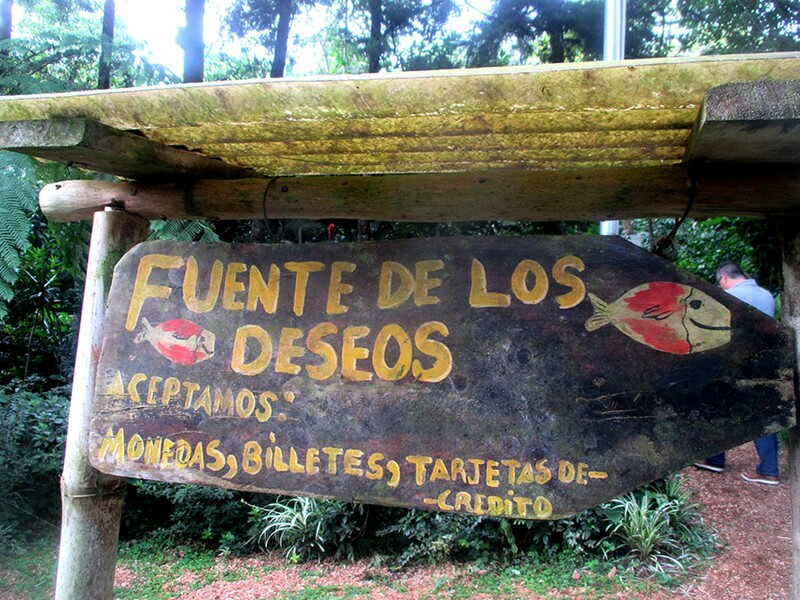 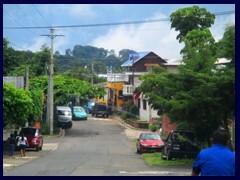 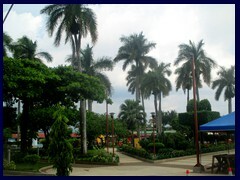 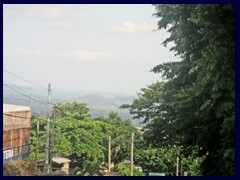 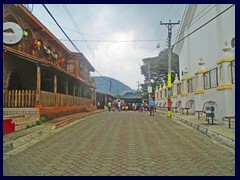 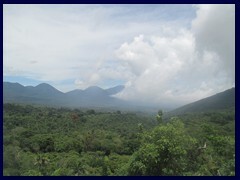 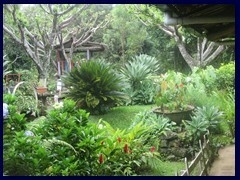 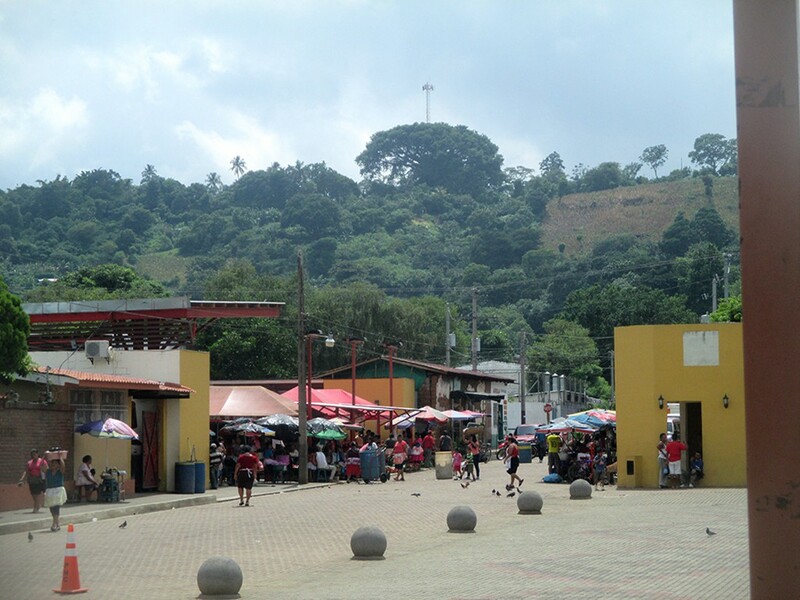 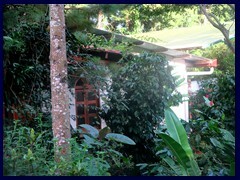 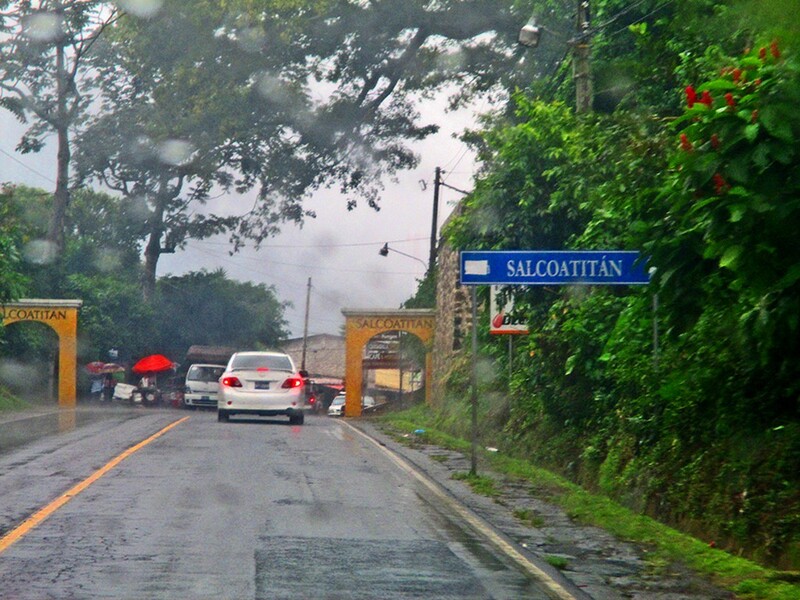 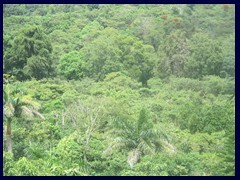 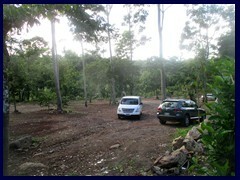 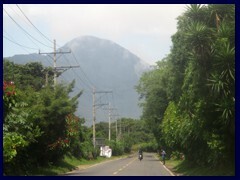 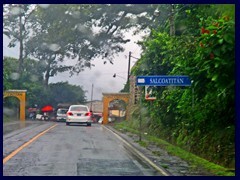 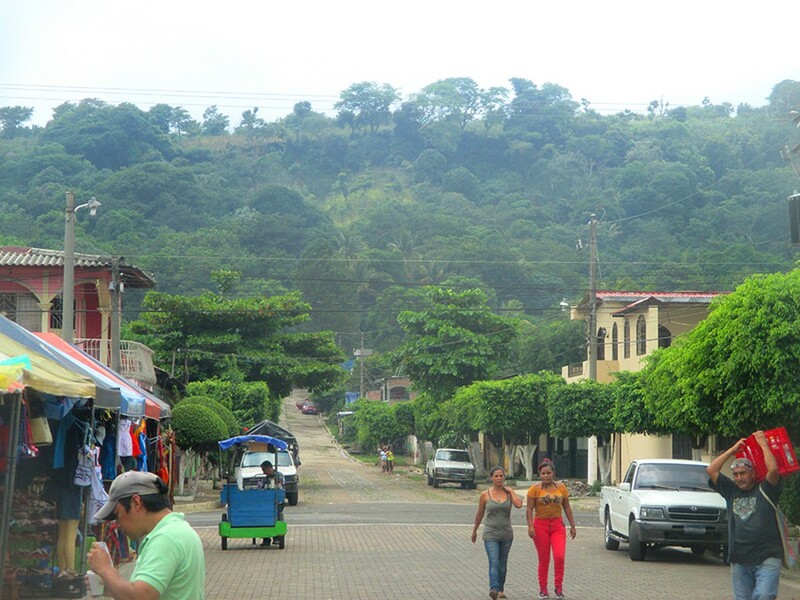 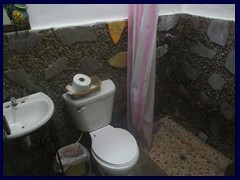 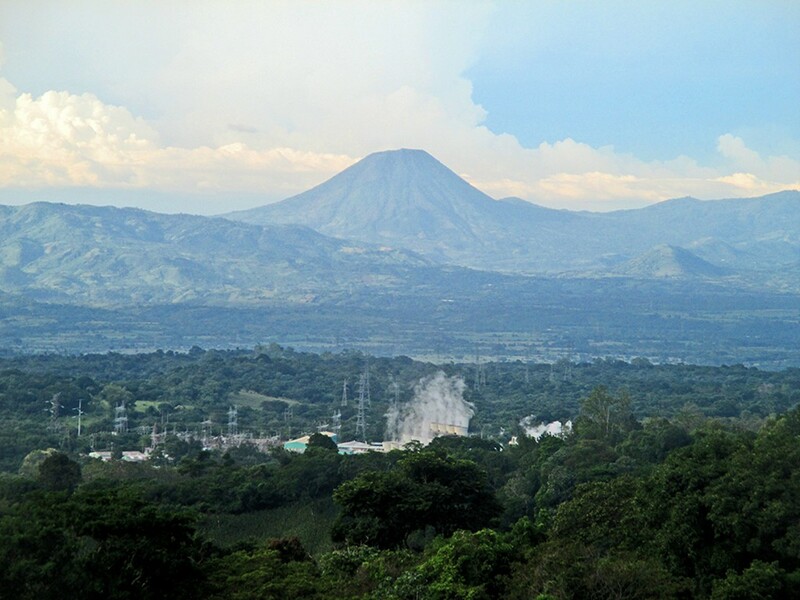 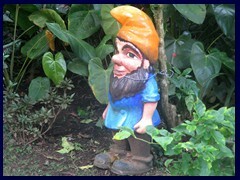 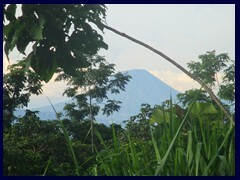 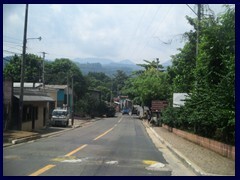 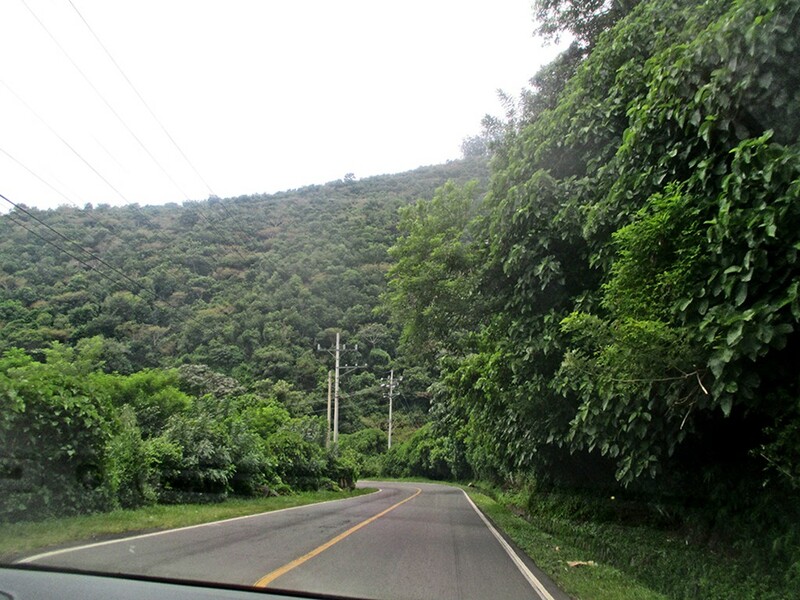 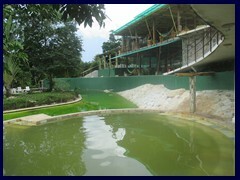 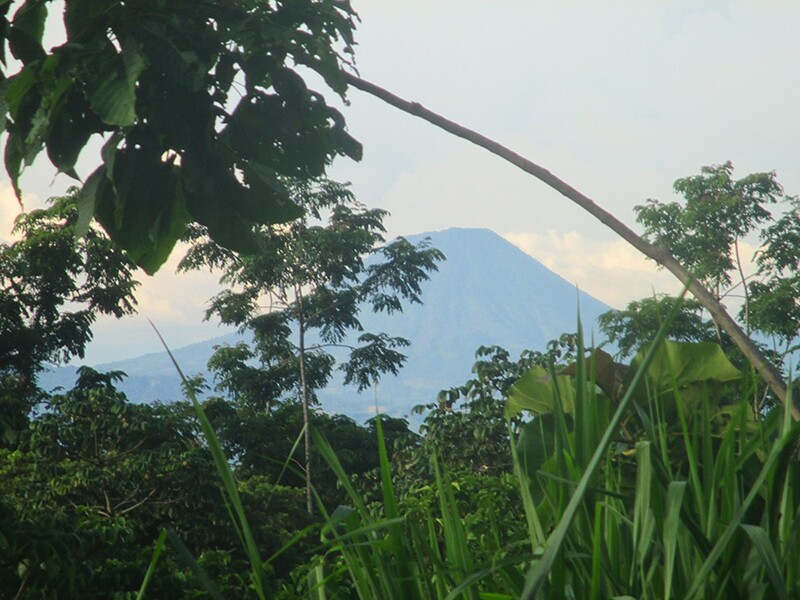 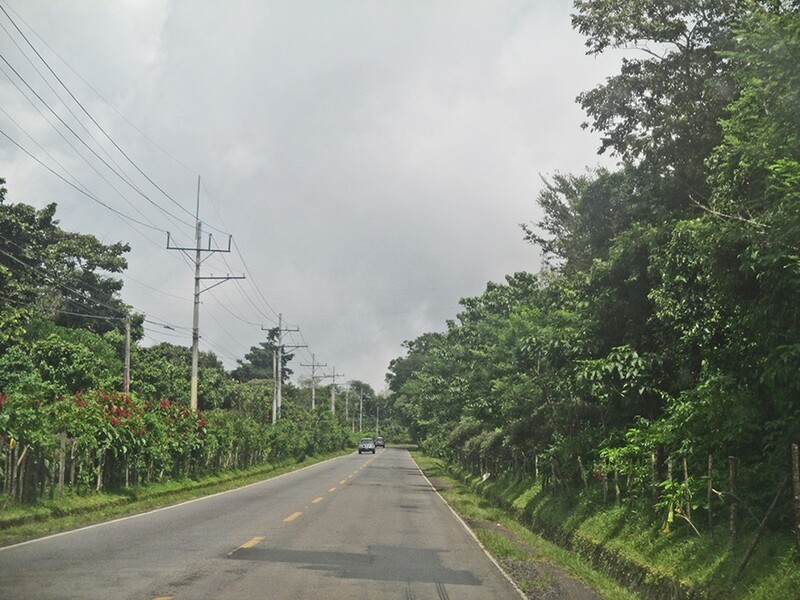 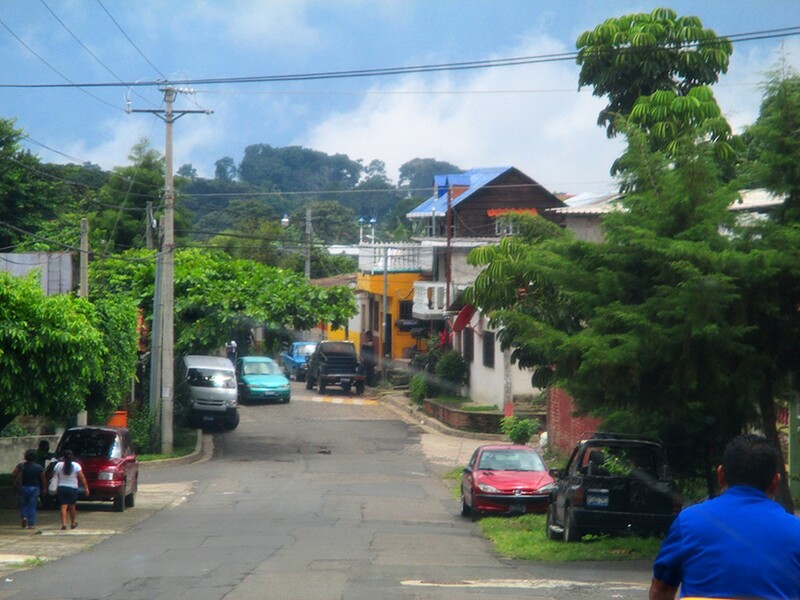 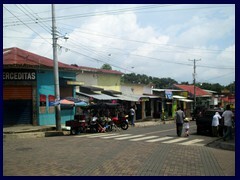 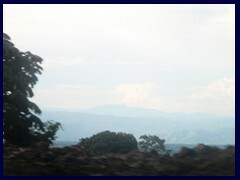 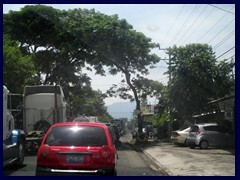 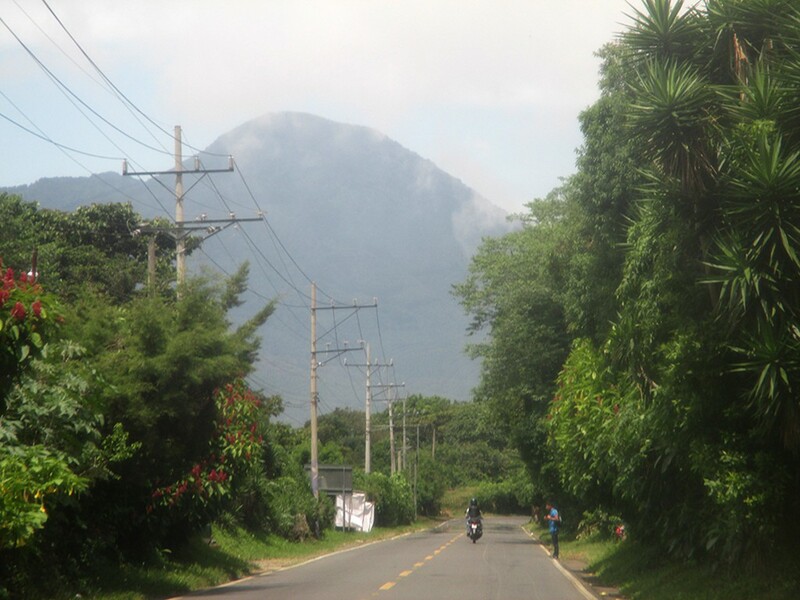 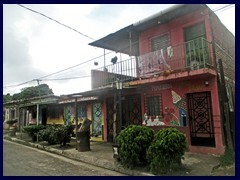 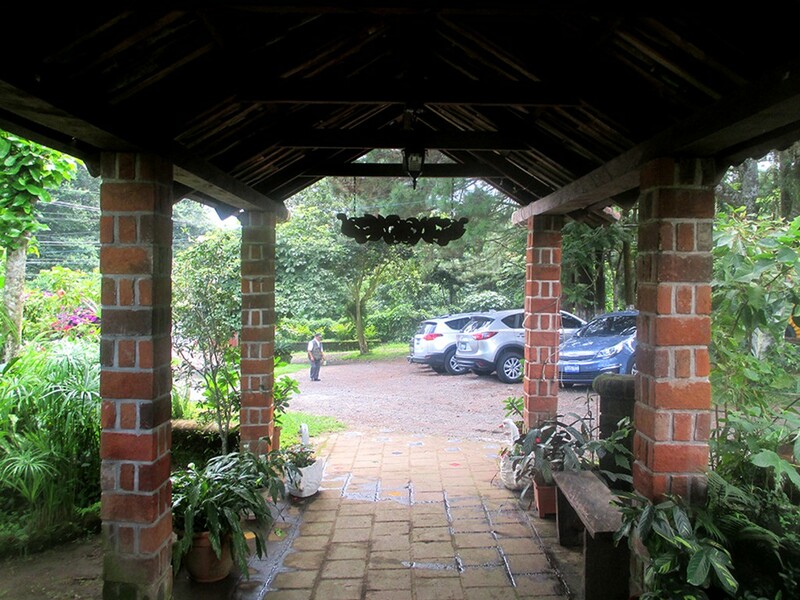 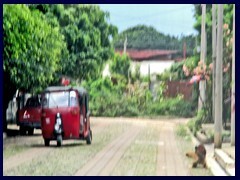 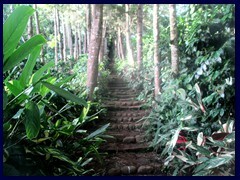 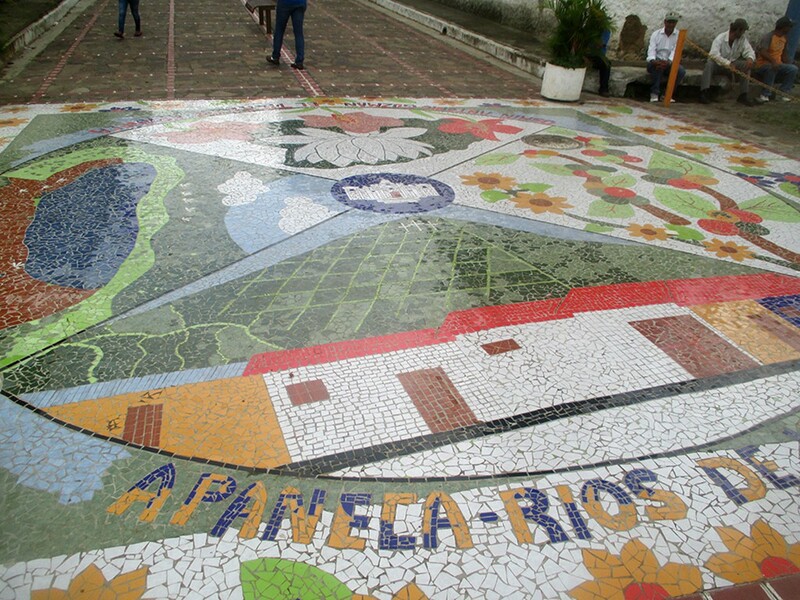 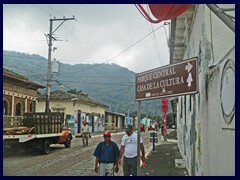 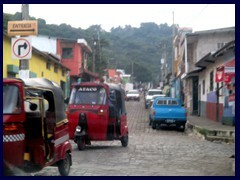 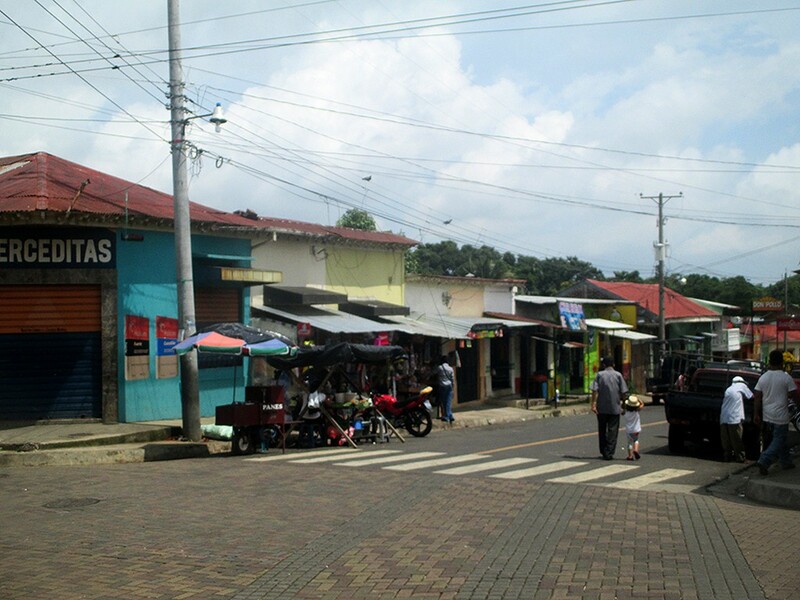 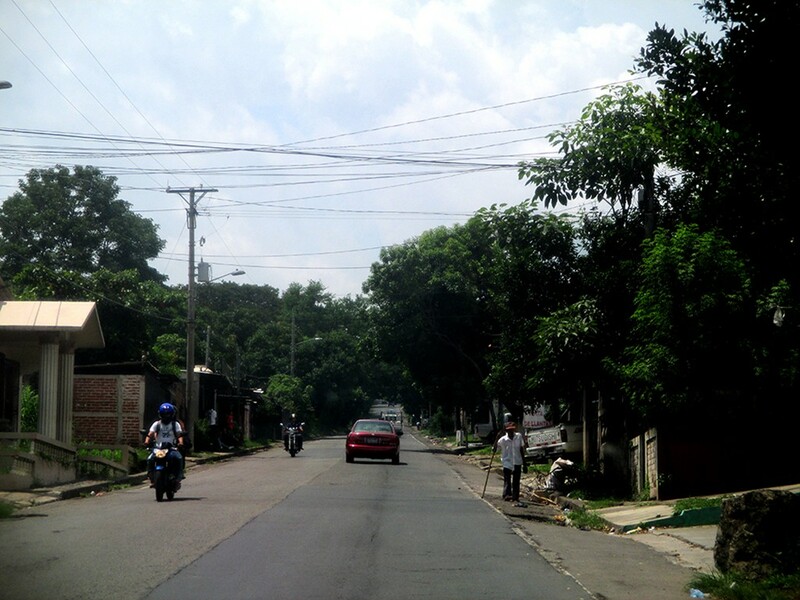 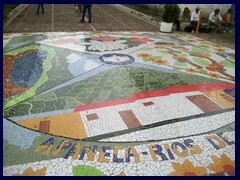 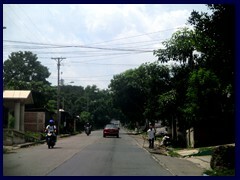 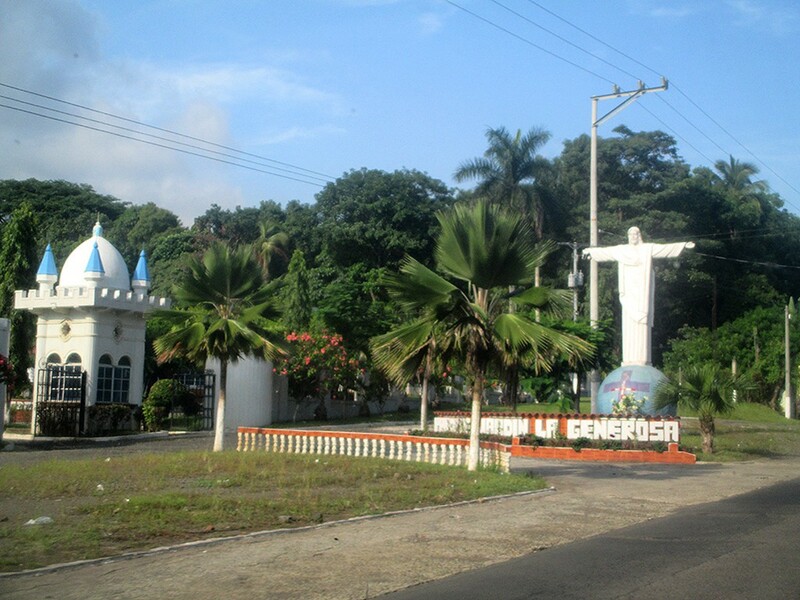 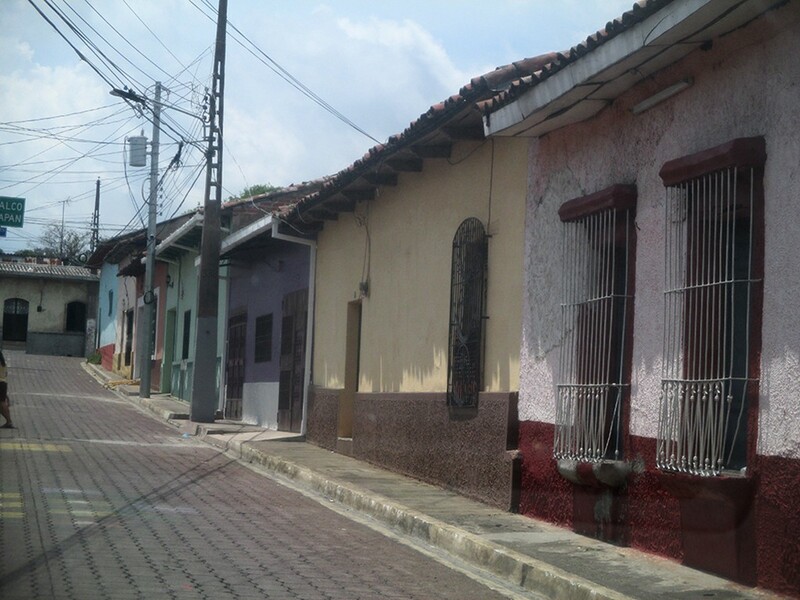 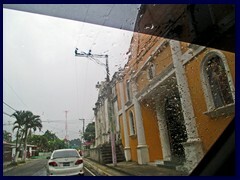 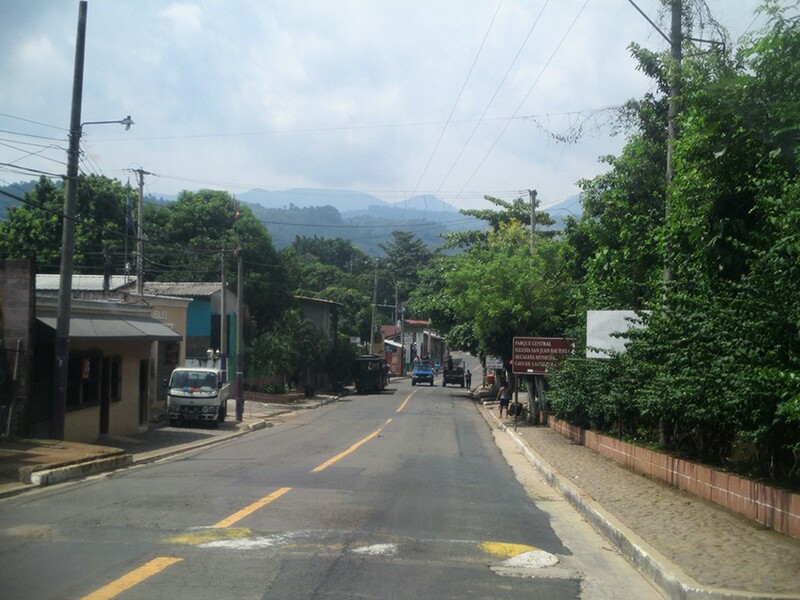 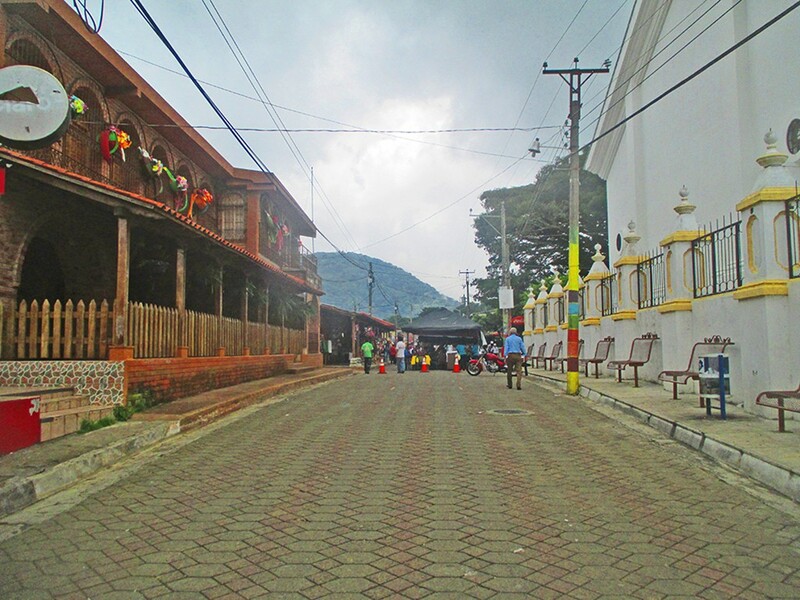 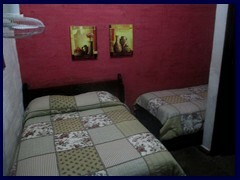 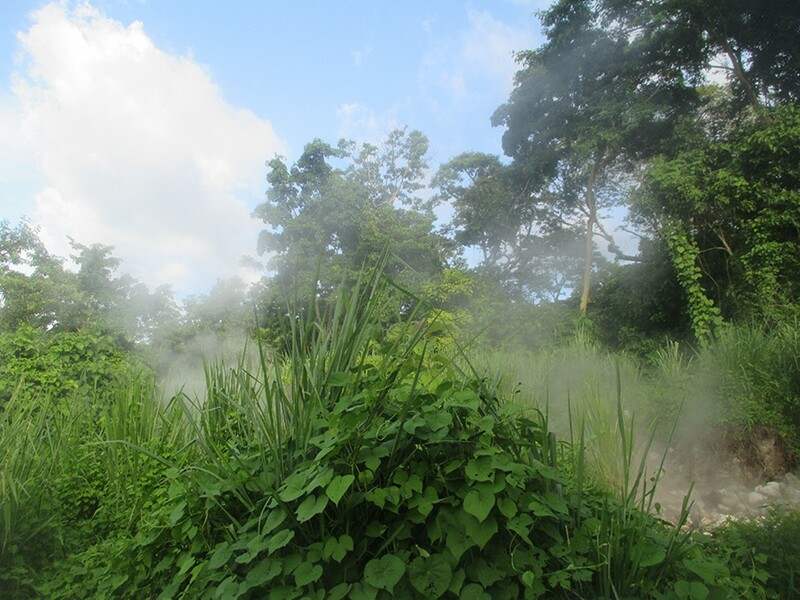 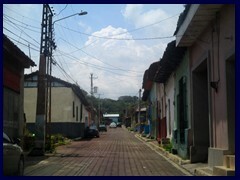 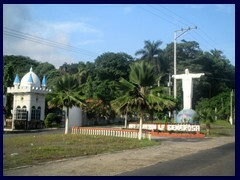 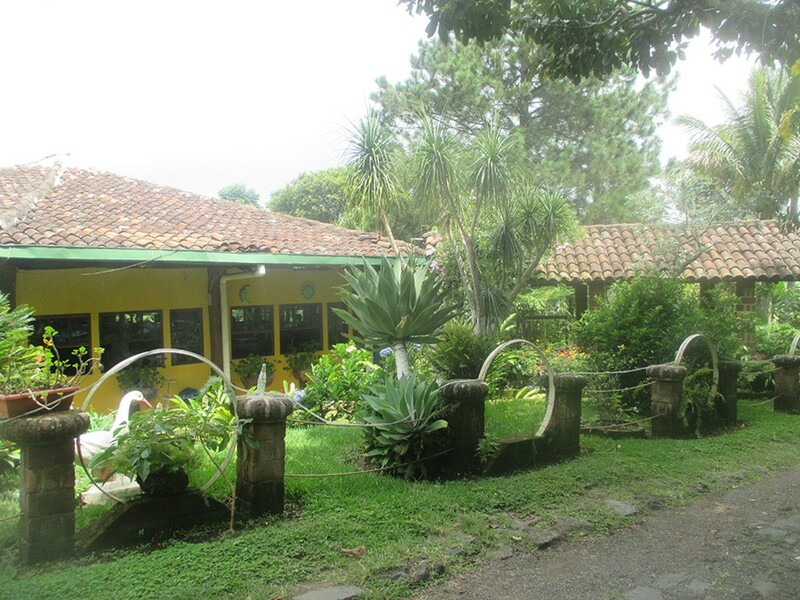 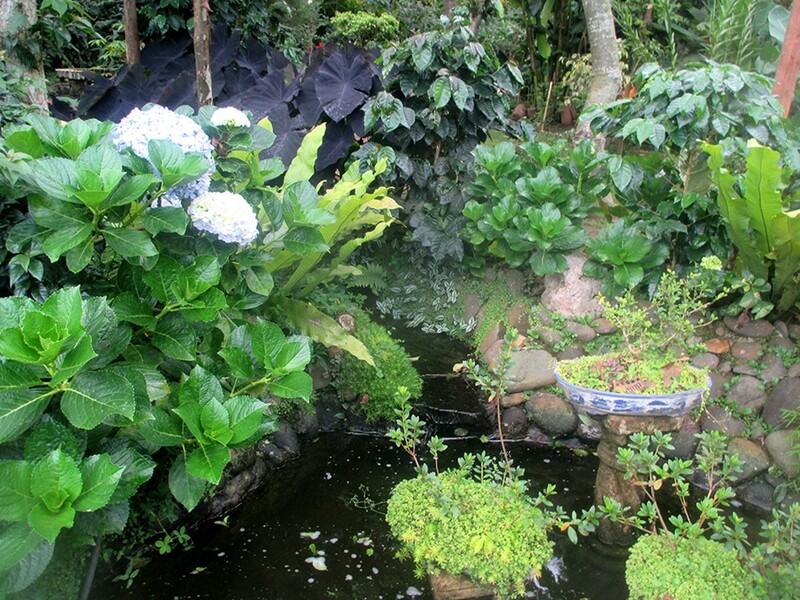 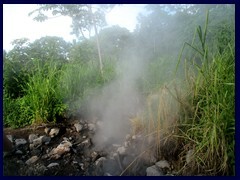 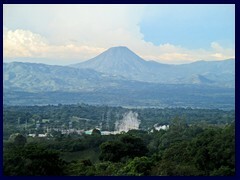 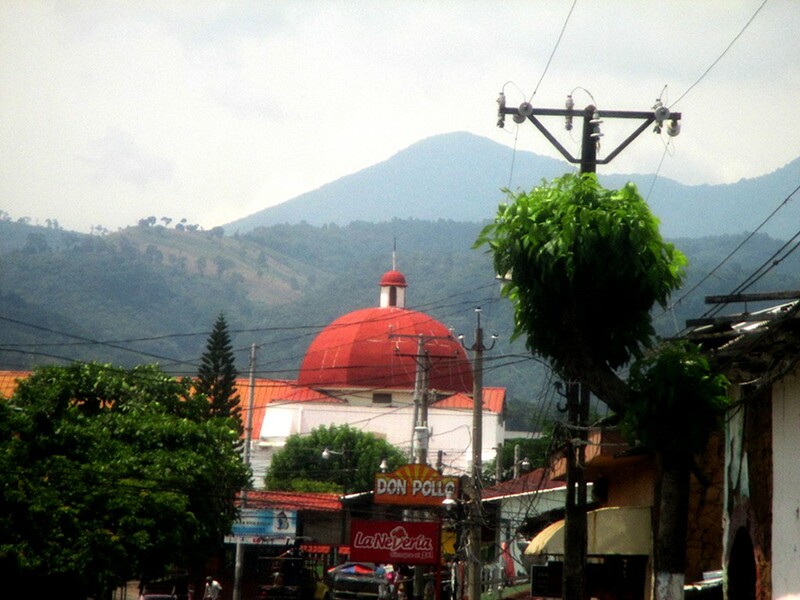 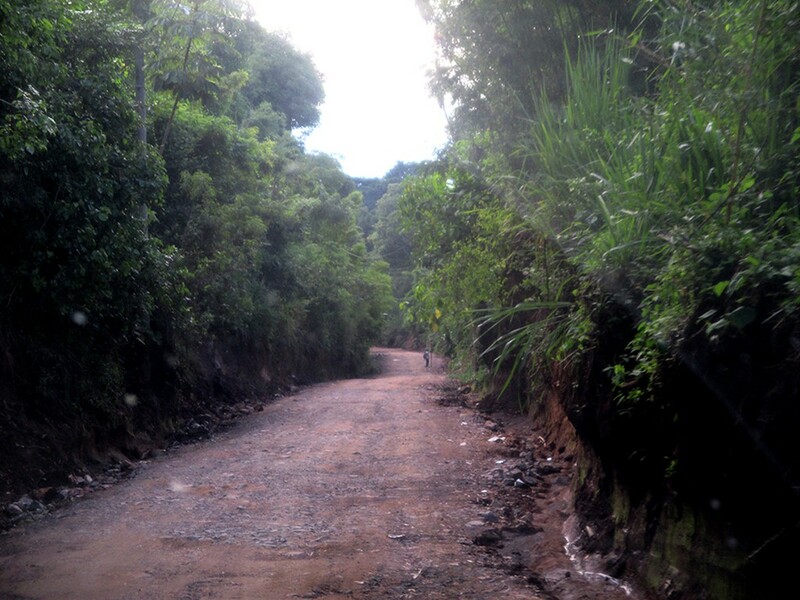 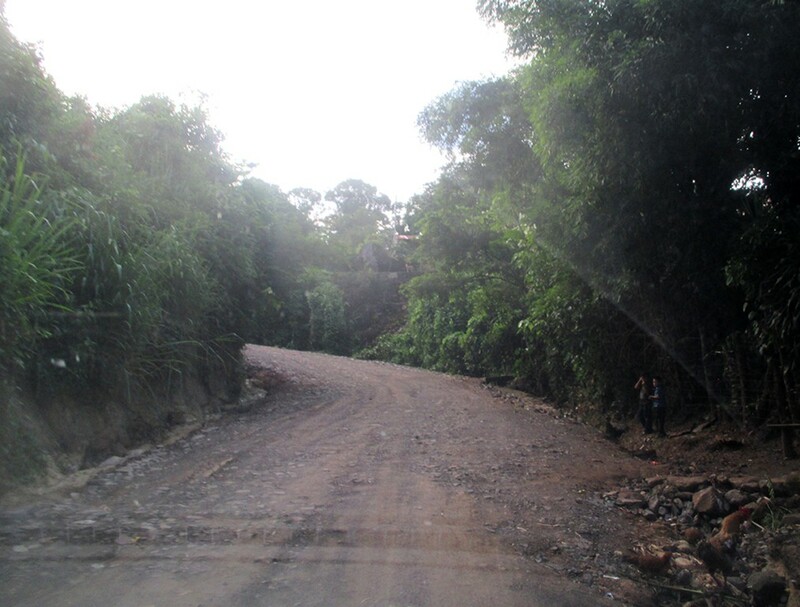 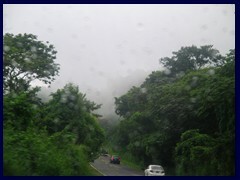 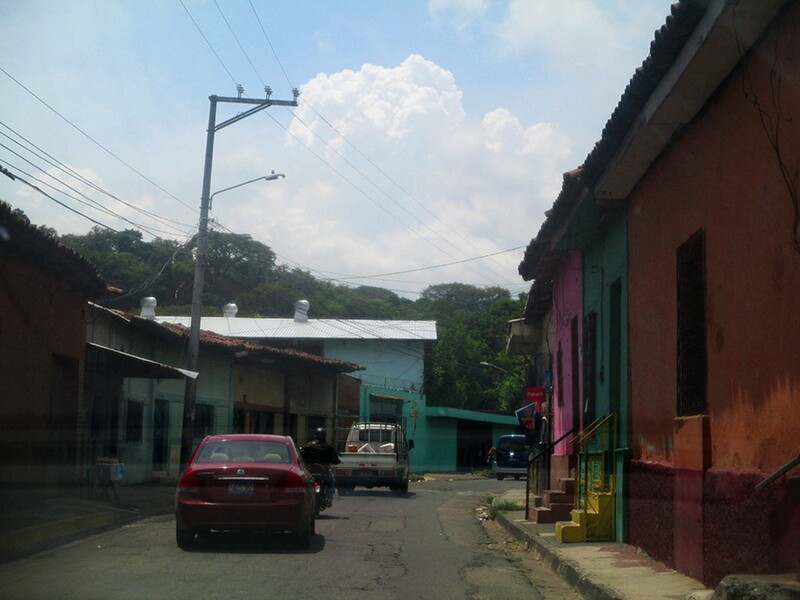 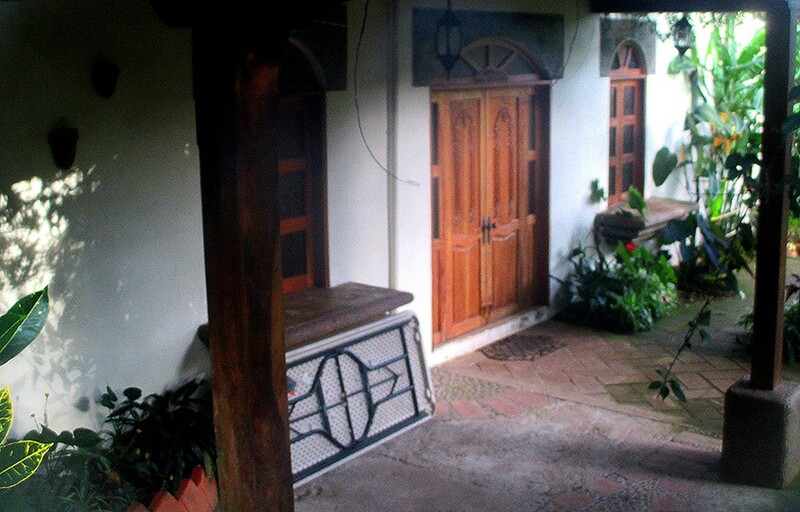 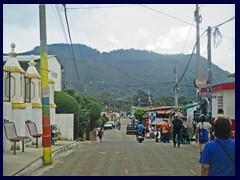 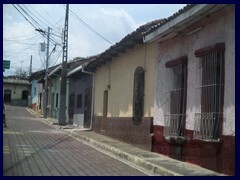 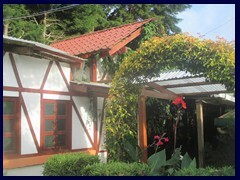 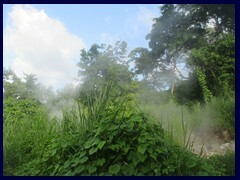 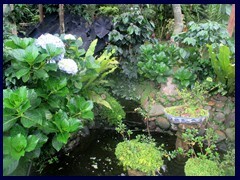 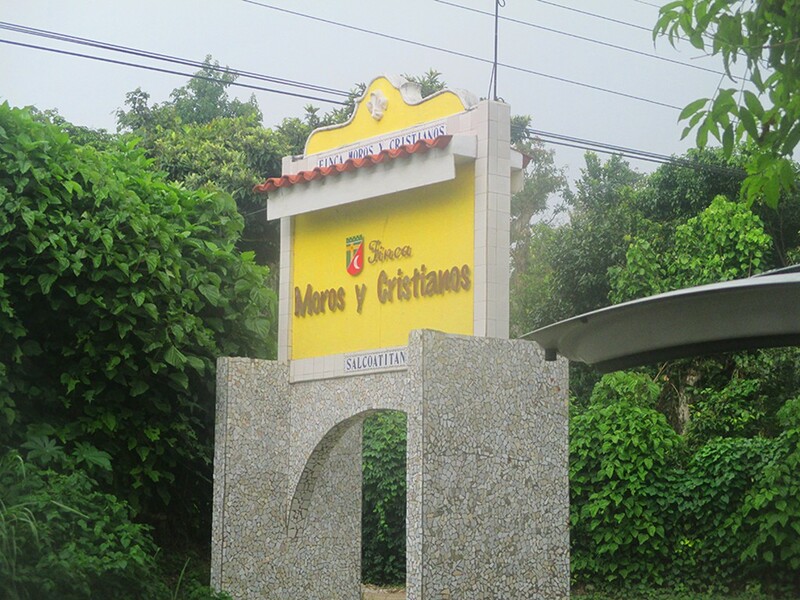 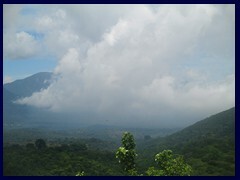 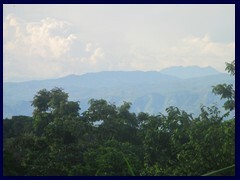 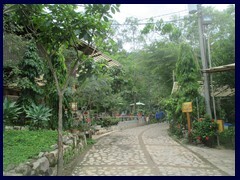 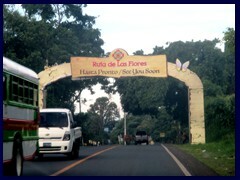 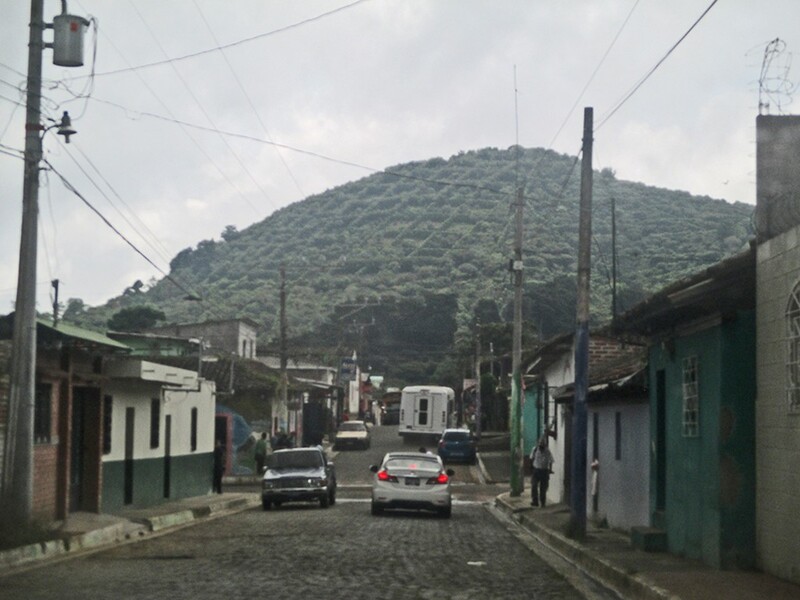 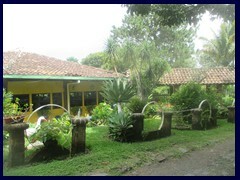 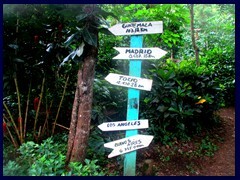 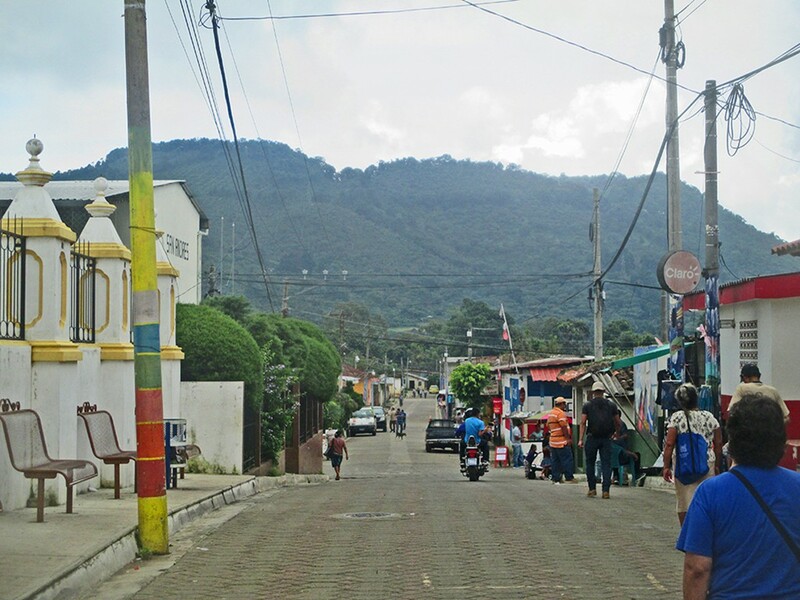 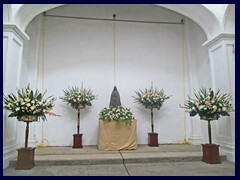 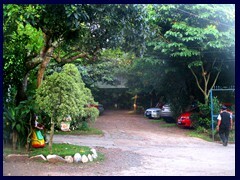 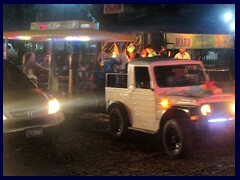 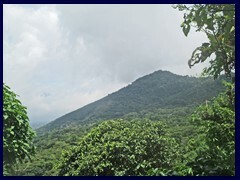 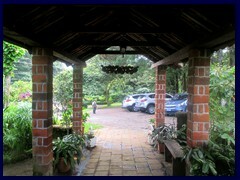 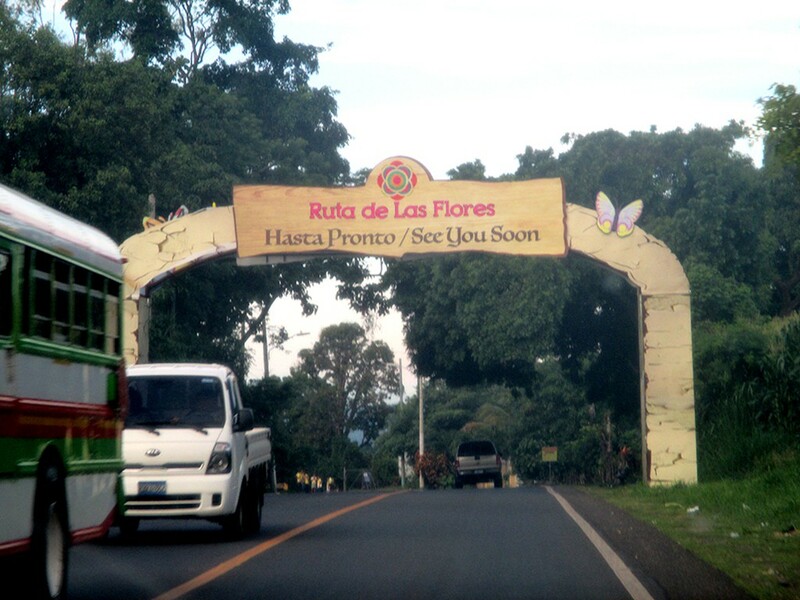 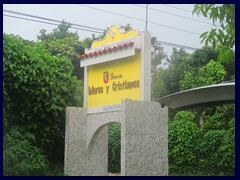 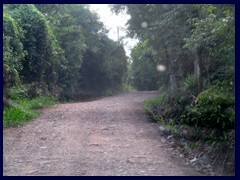 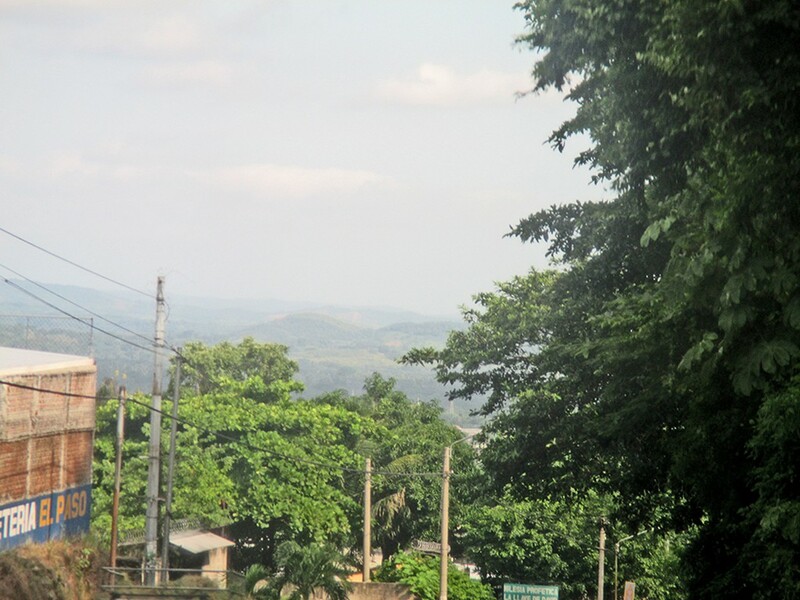 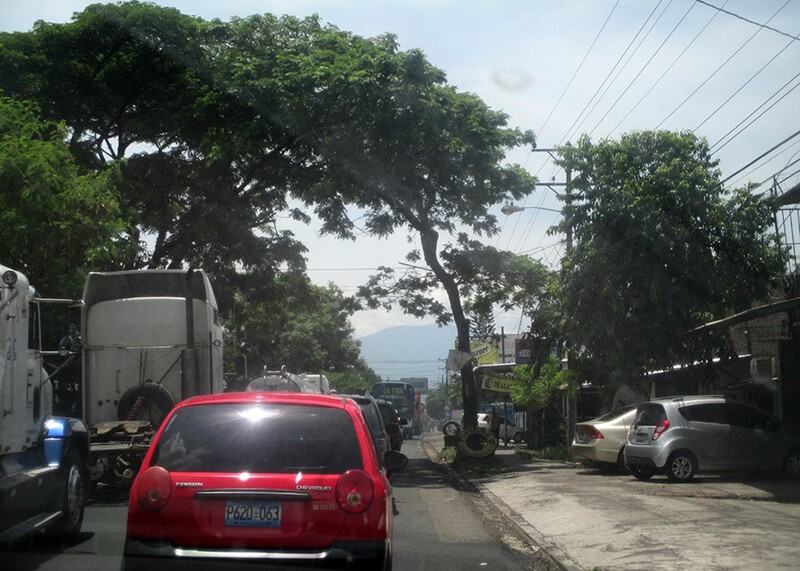 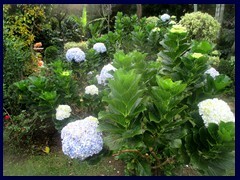 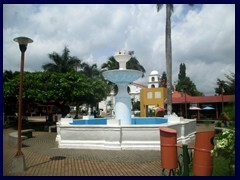 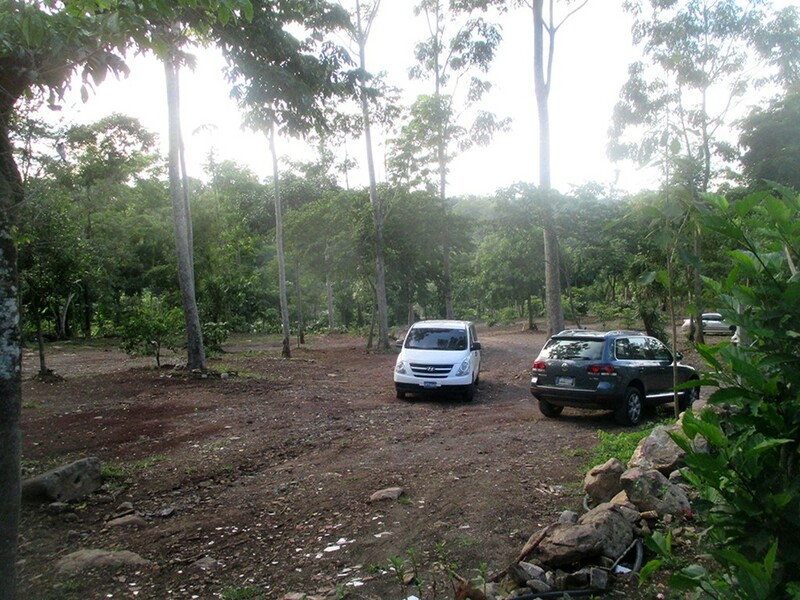 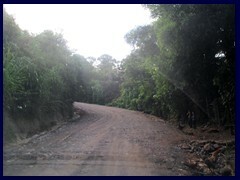 Ruta de las Flores is an road and an area in the Ahuachapan and Sonsonate departments, in the West part of El Salvador. 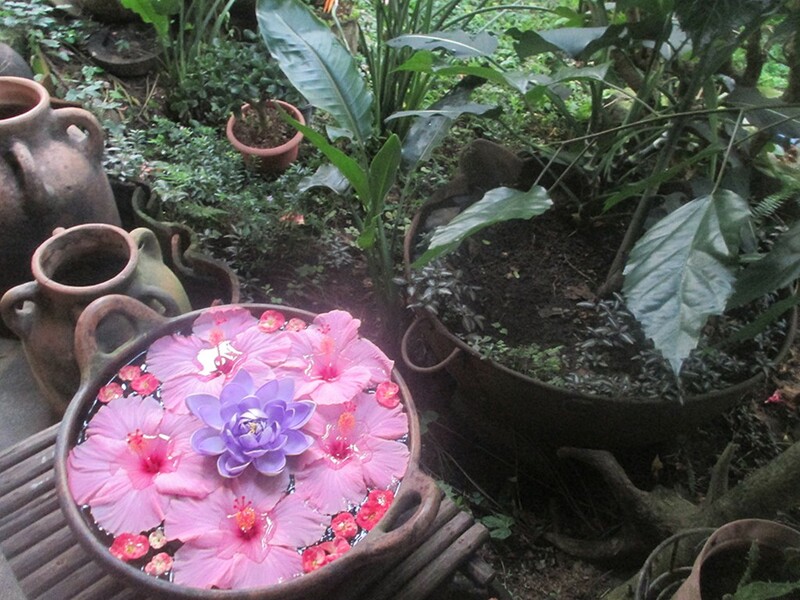 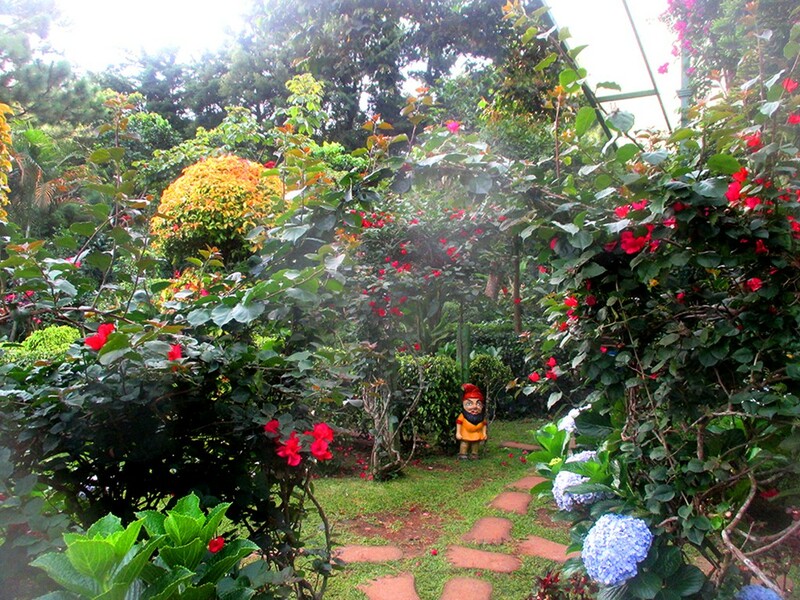 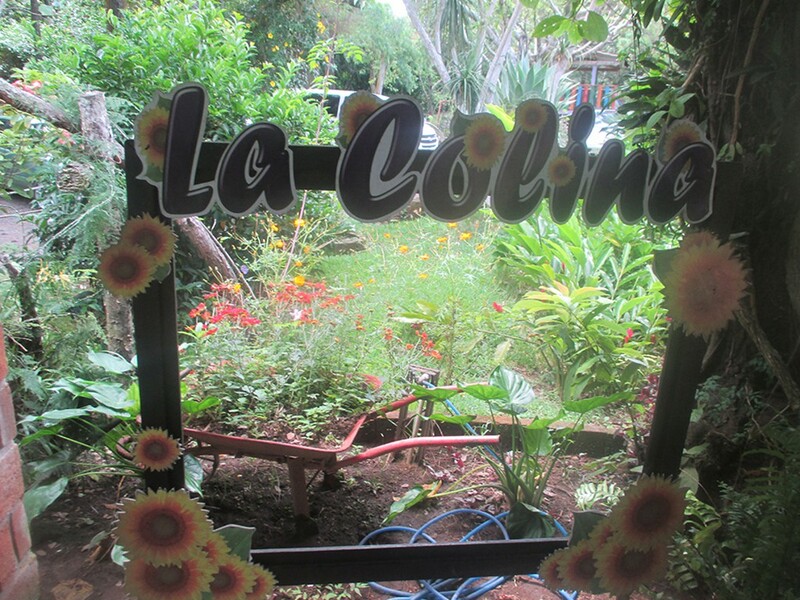 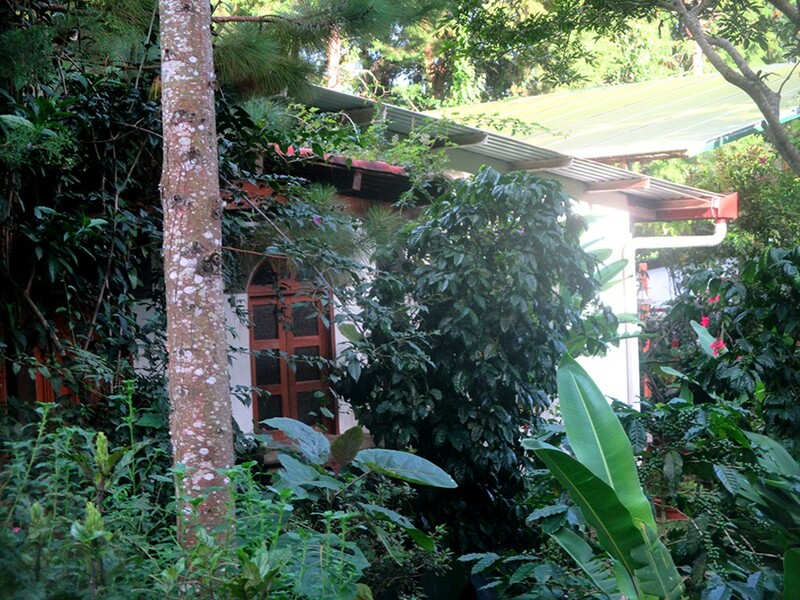 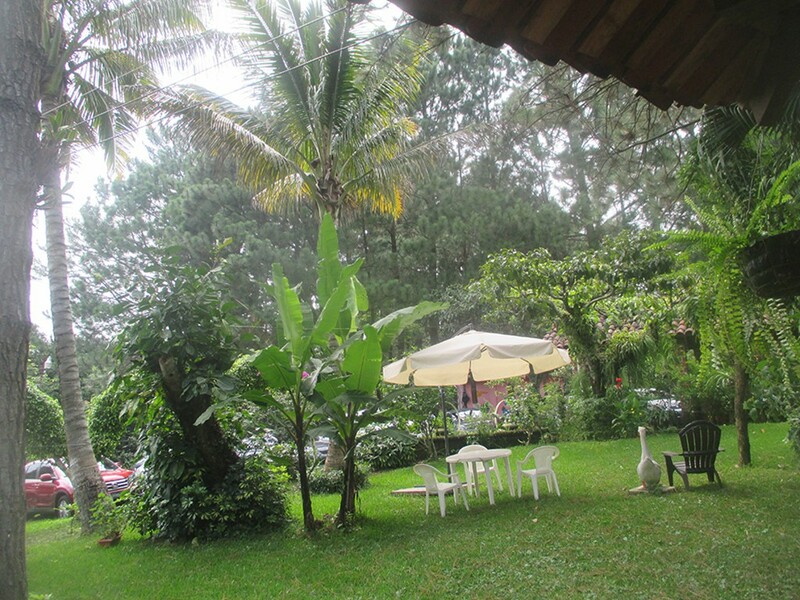 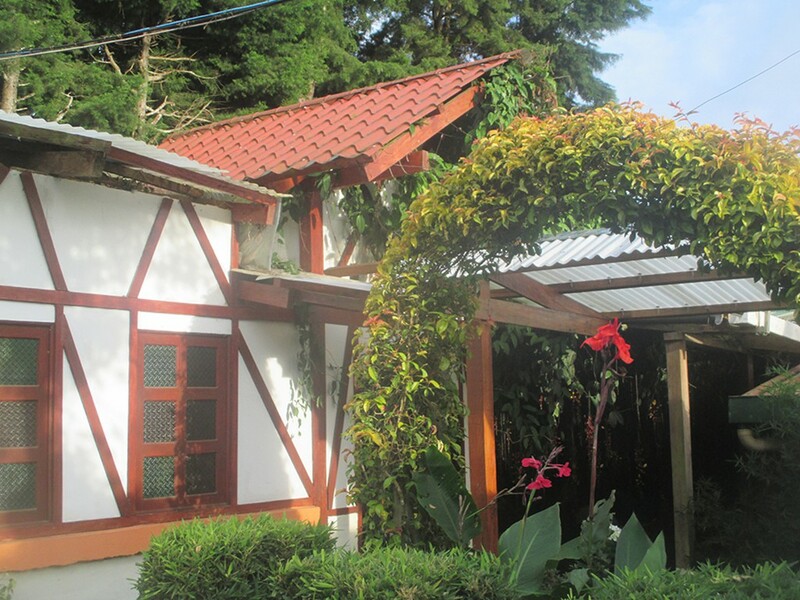 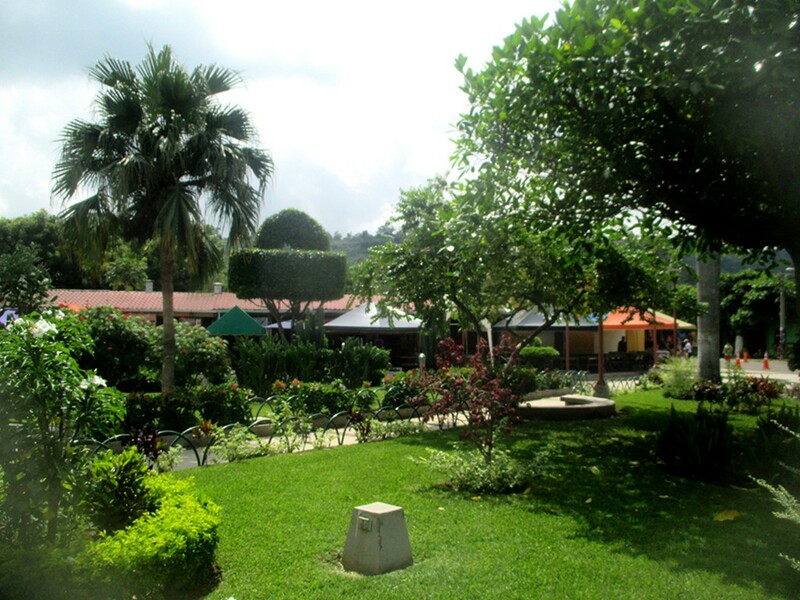 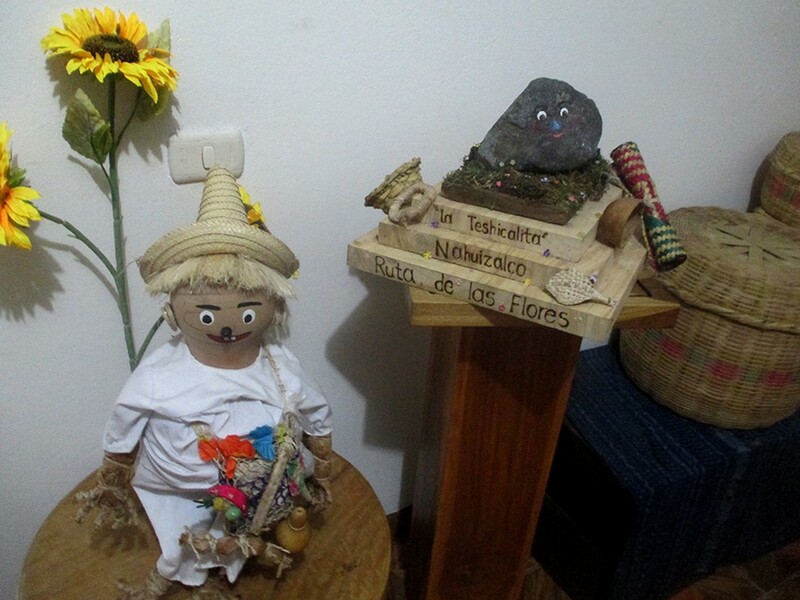 It is know for its flowers, coffee production, former cotton industry, native villages, markets, craft tiendas, pupuserias (small restaurants that serve local food) and picturesque cafés and restaurants that feature their own beautiful gardens. 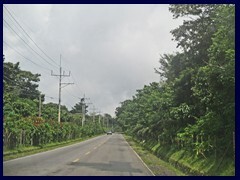 The area is very nice, but the roads are rough. 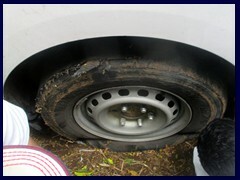 We got a flat tire on our mini van. 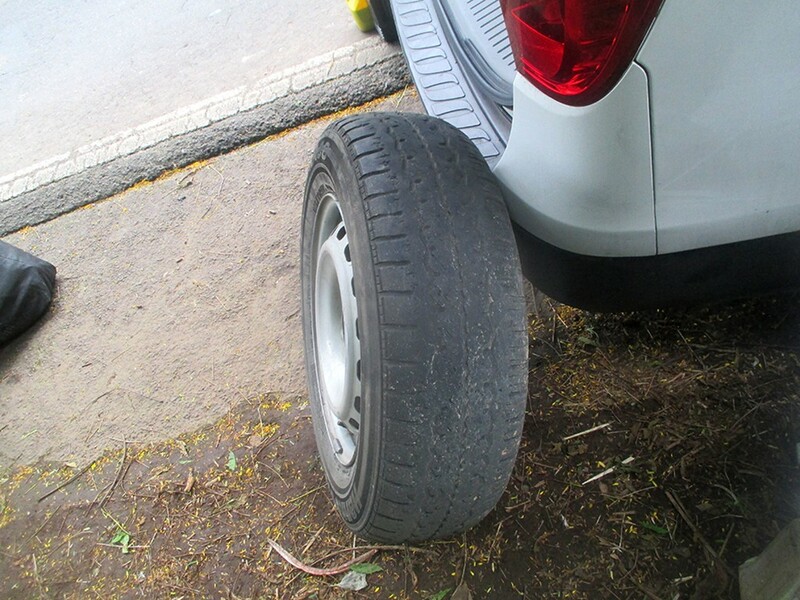 There was very bad equipment in the rental car, but some truck drivers helped us. 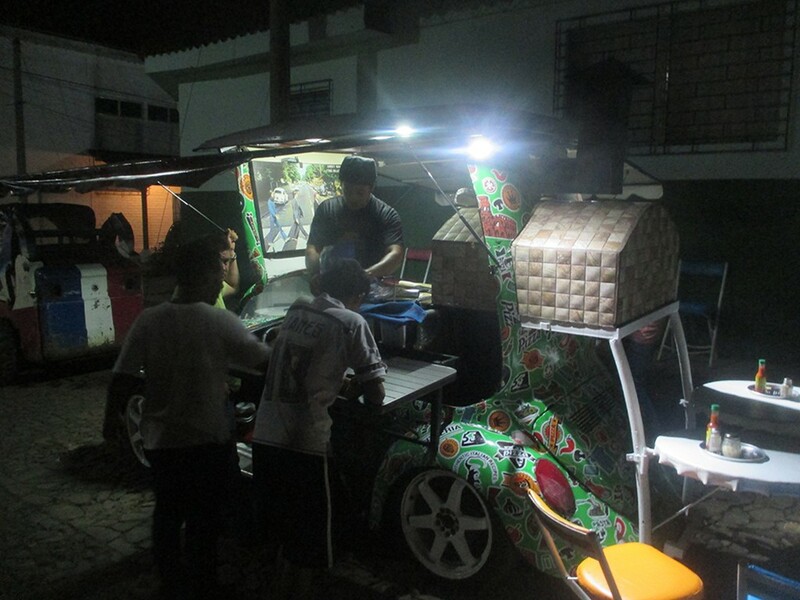 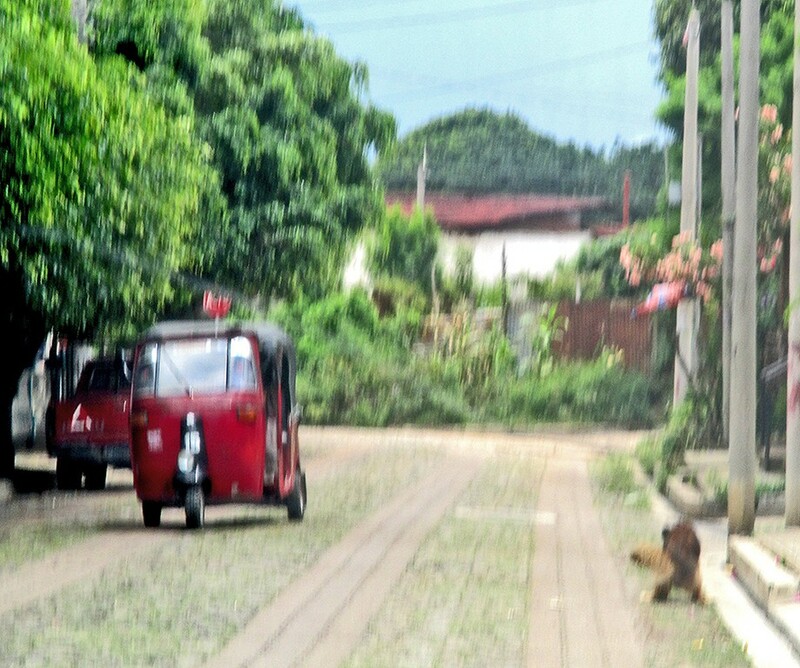 On the countryside you also see the typical charming 3 wheel moped taxis that you also can see in other developing countries, such as Guatemala, India and Sri Lanka. 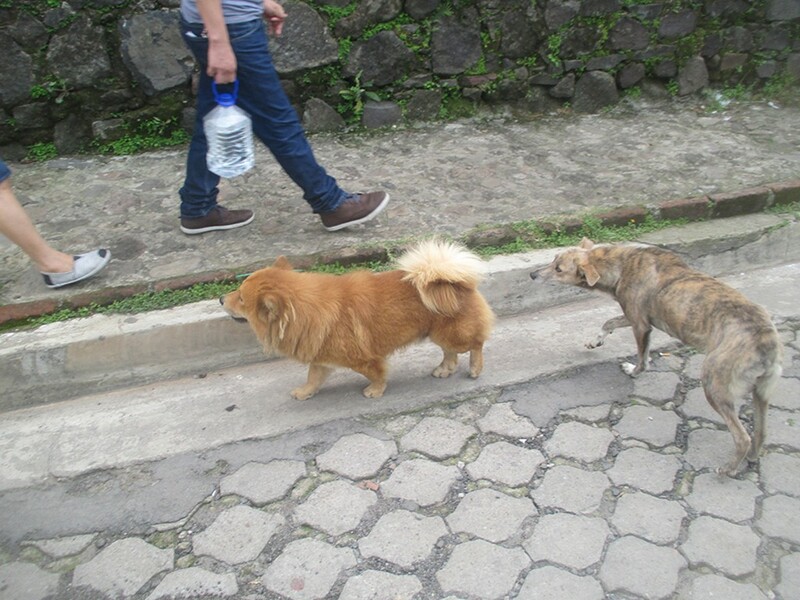 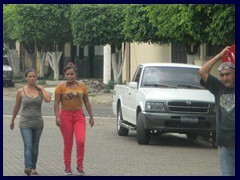 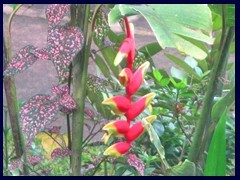 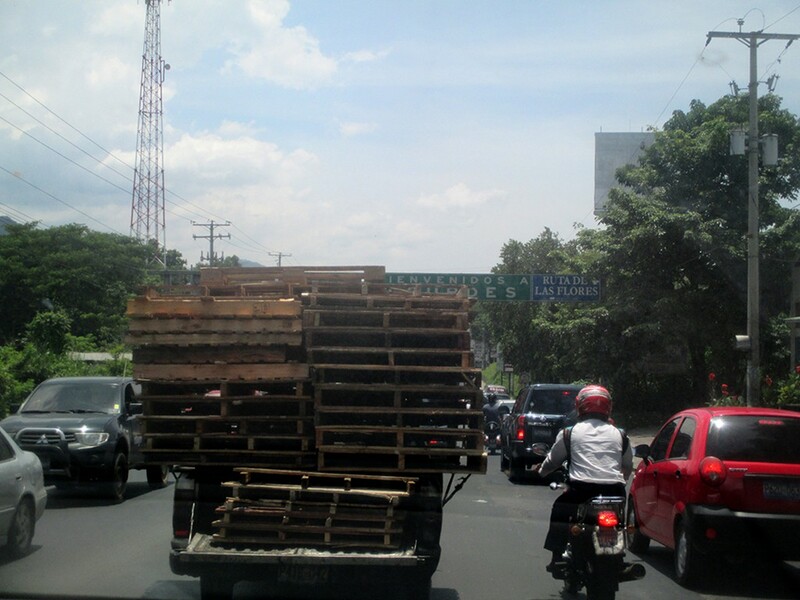 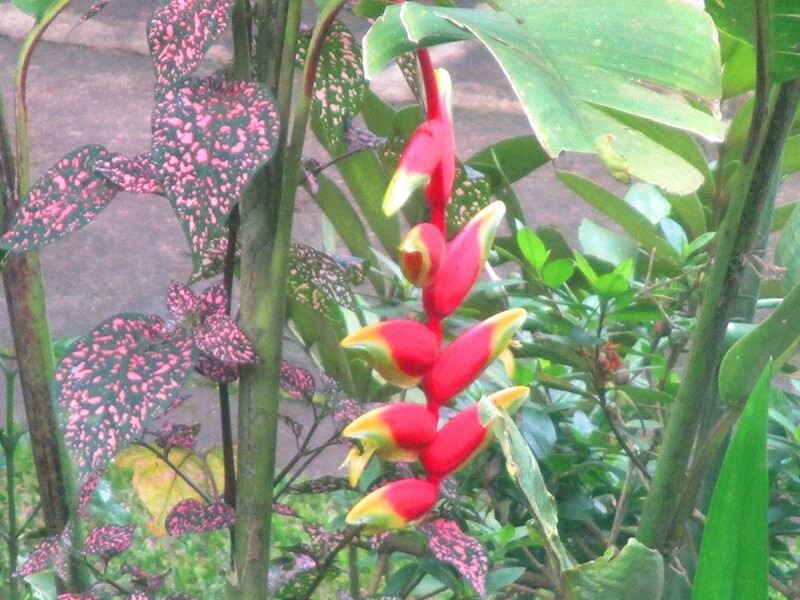 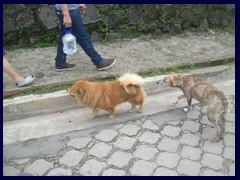 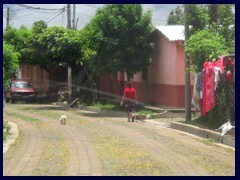 They are red in El Salvador. 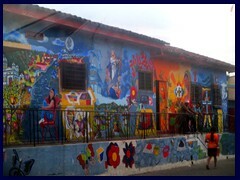 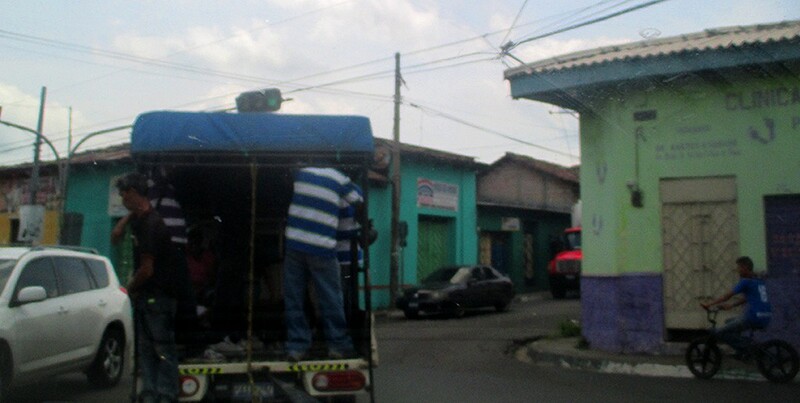 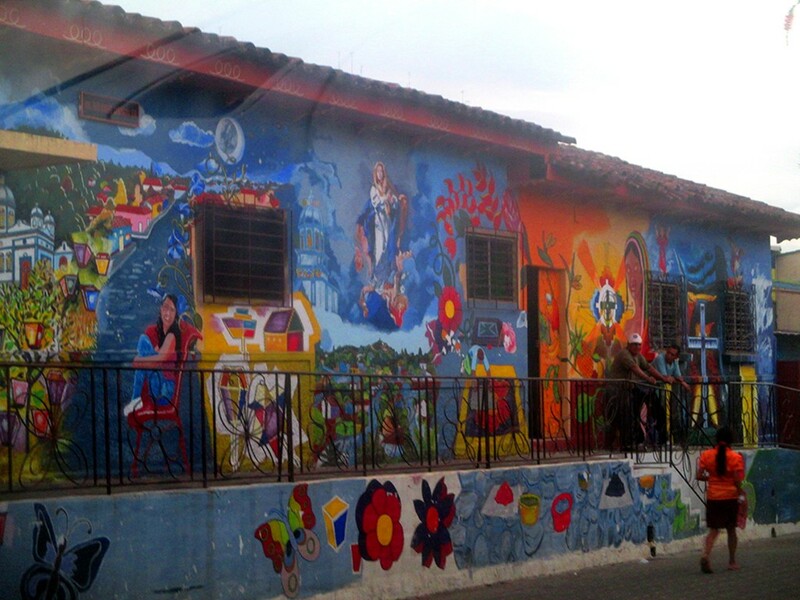 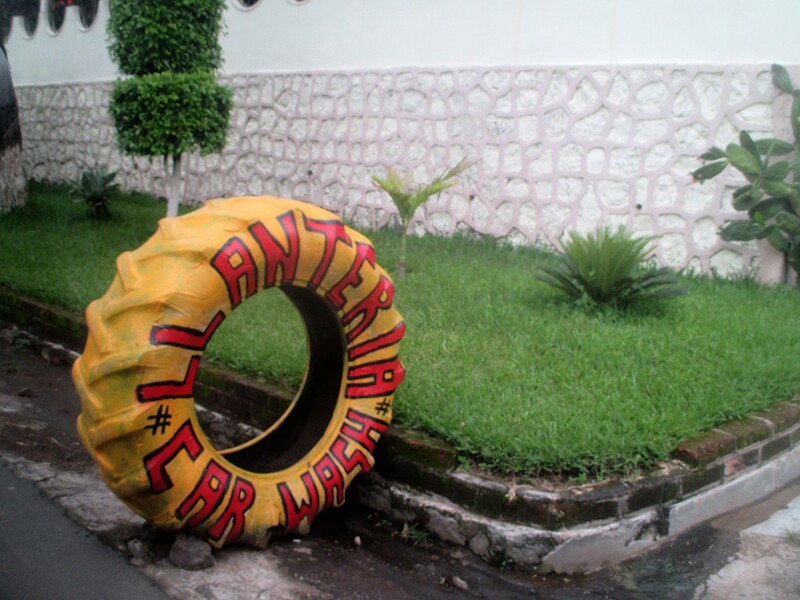 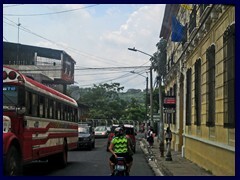 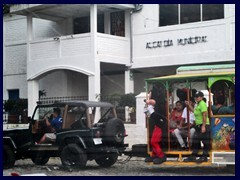 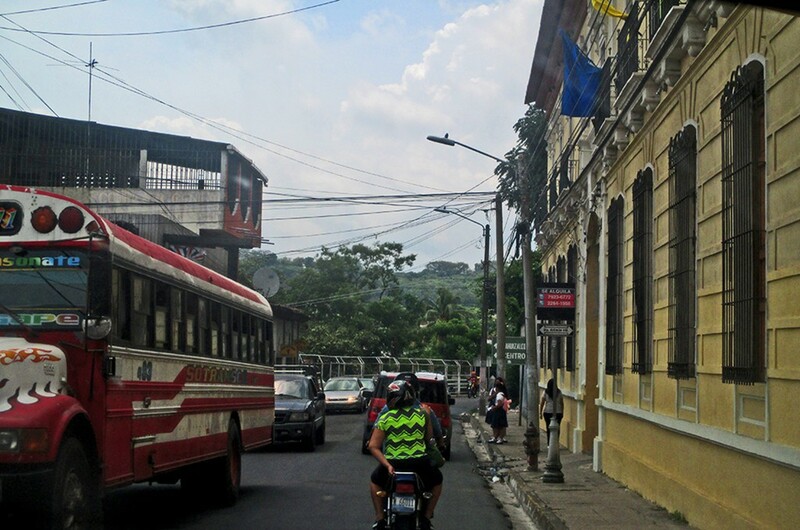 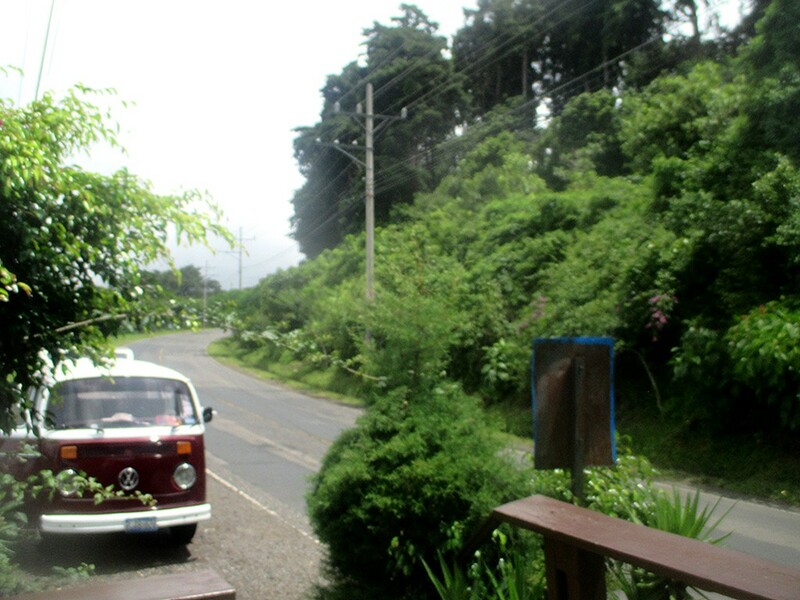 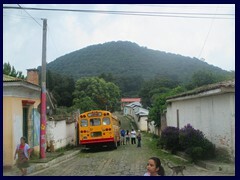 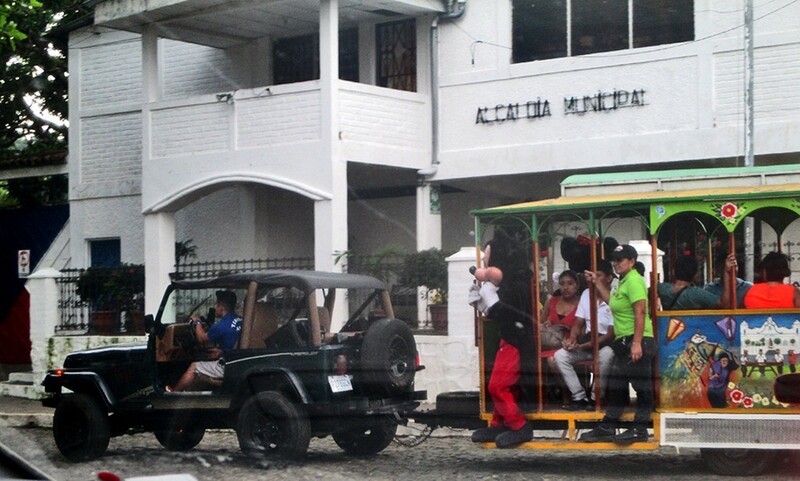 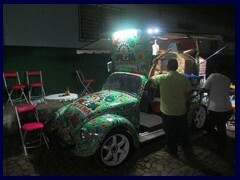 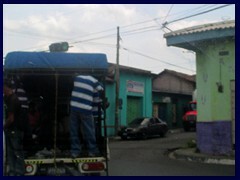 You also see the former American school buses everywhere, transformed to local buses in large parts of Central America. 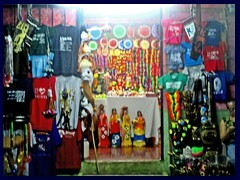 There are many places were you can buy traditional things from the friendly native people. 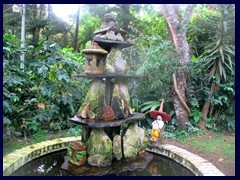 There is a beautiful waterfall in the Ruta las Flores area (in Juayua), that we unfortunately were not aware of during our visit. 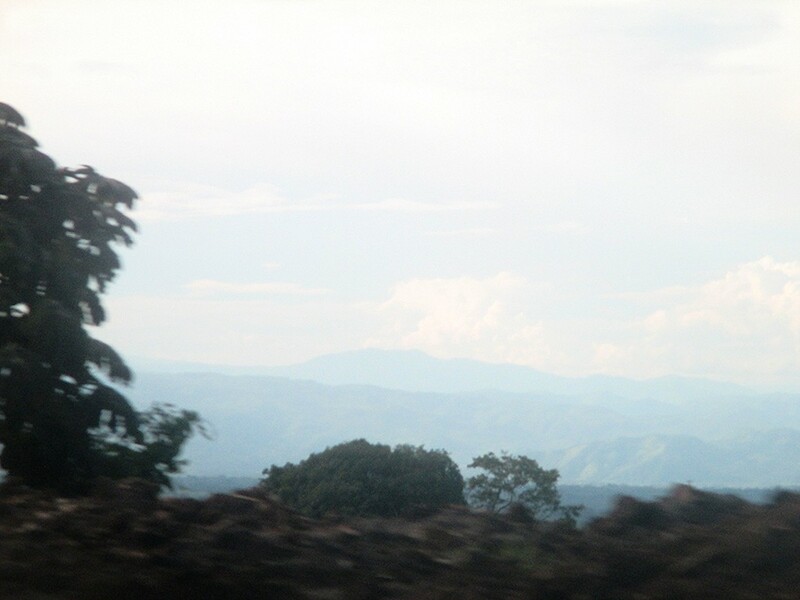 But we stopped at several places that had amazing views over the green mountains! 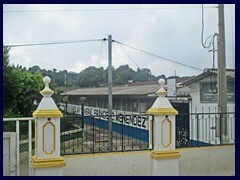 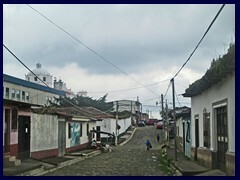 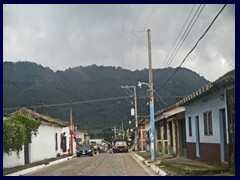 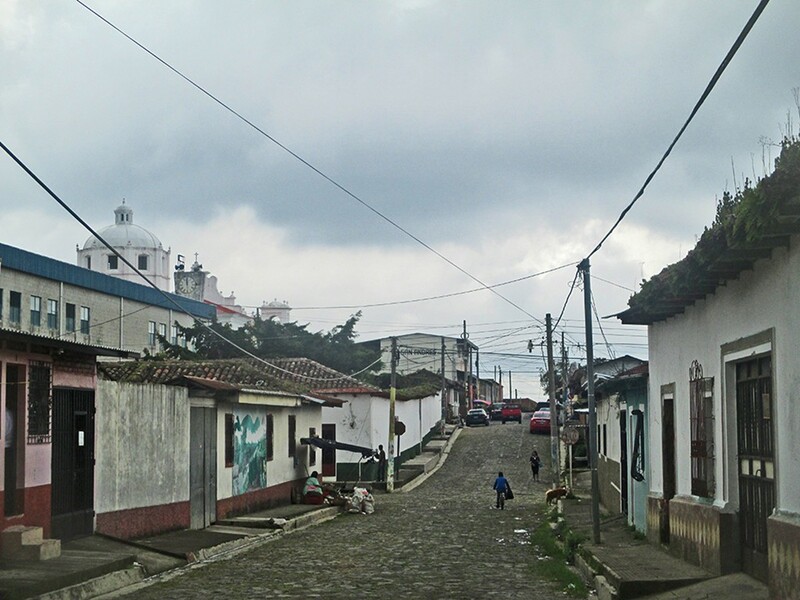 Concepción de Ataco: Population: 18 101. 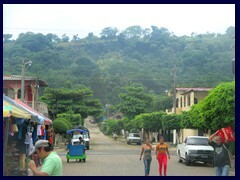 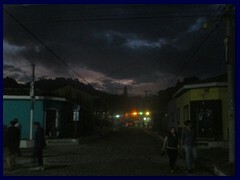 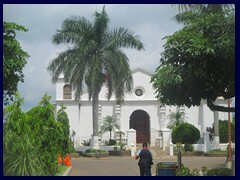 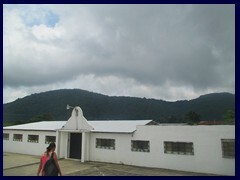 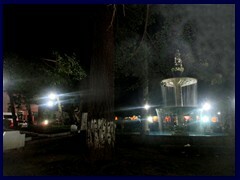 Department: Ahuachapán. 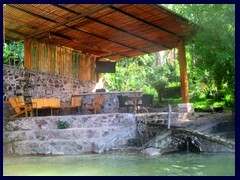 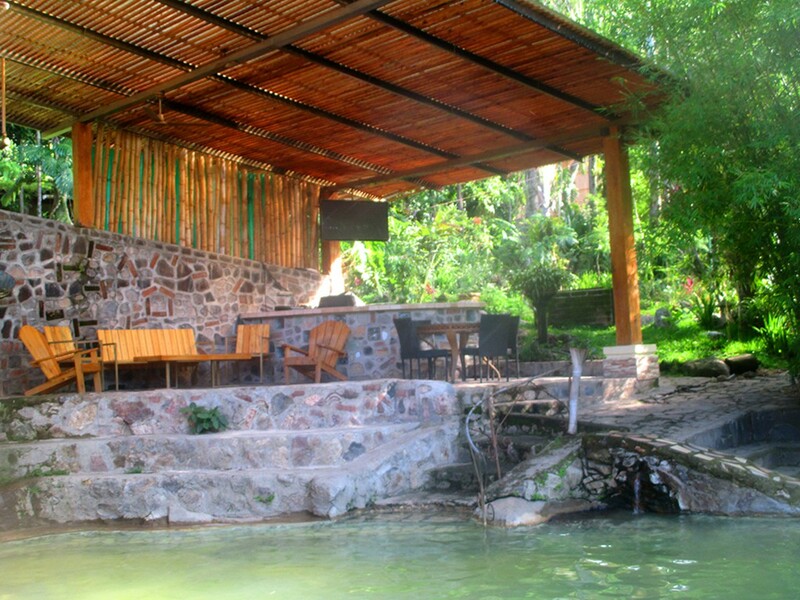 Often called just Ataco, that means "high place of springs" in Nahuatl. 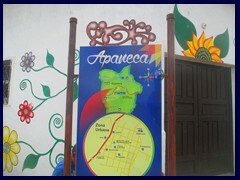 Situated in the Apaneca Mountain Range. 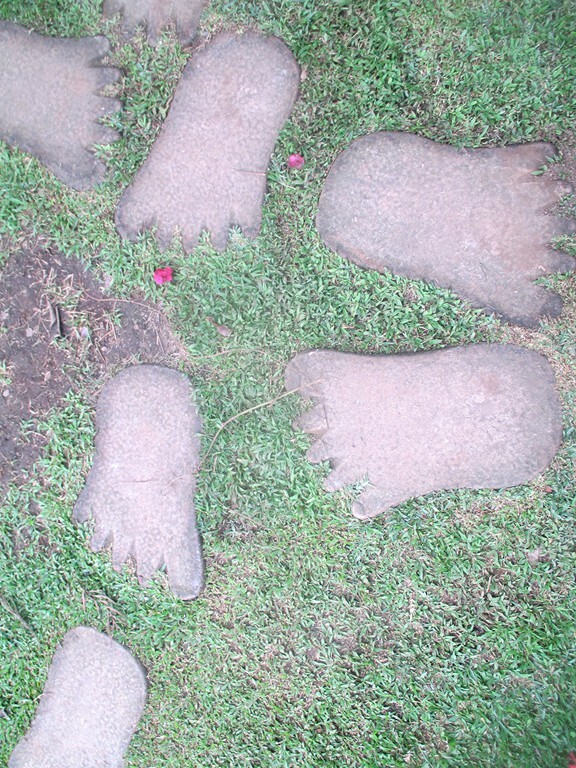 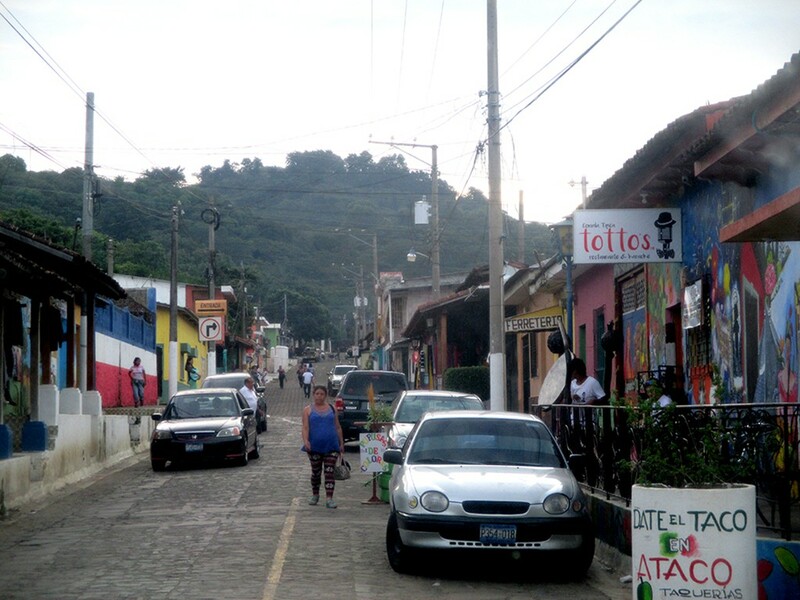 Ataos's population has pre-Columbian origin and was founded by Yaqui Indianl. 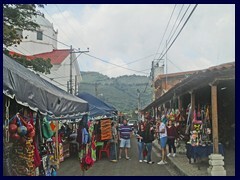 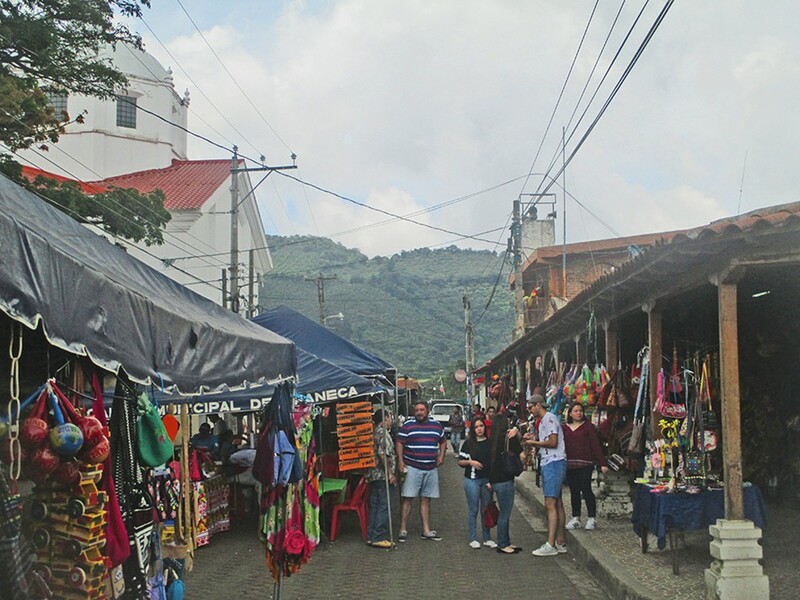 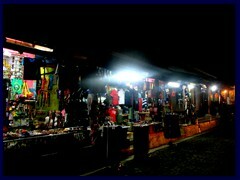 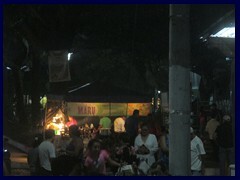 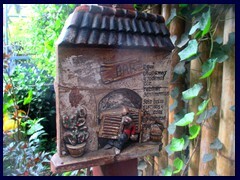 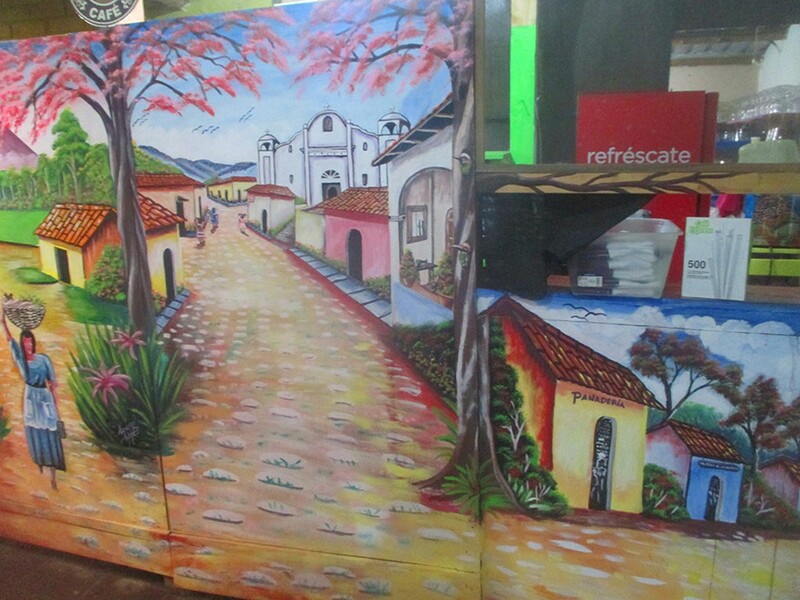 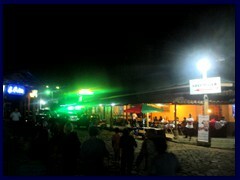 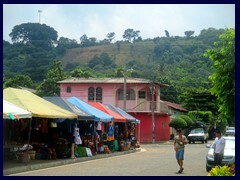 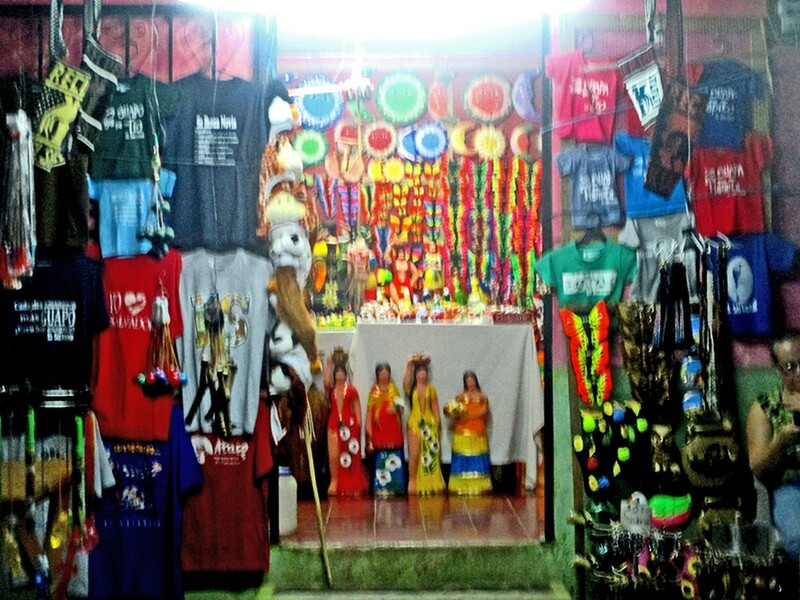 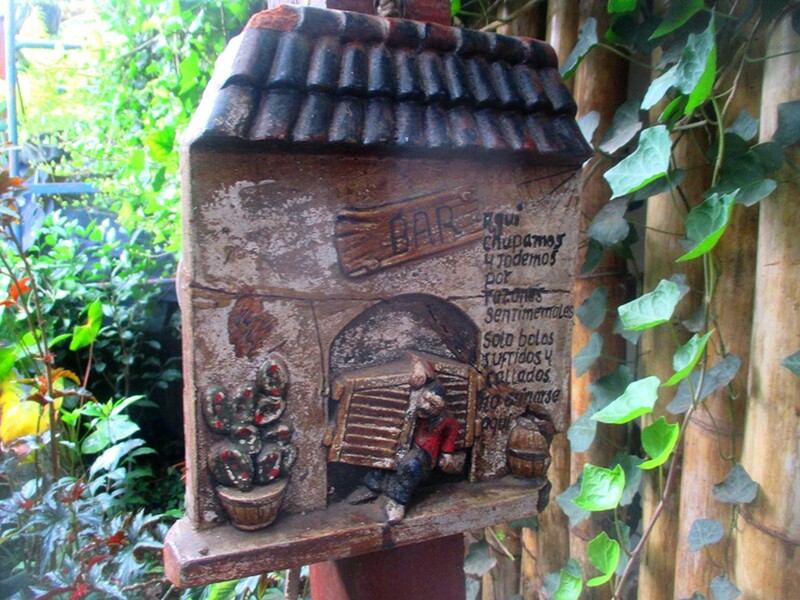 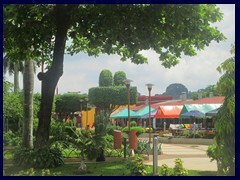 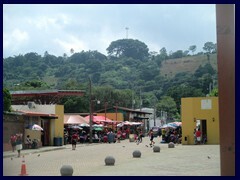 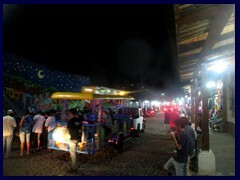 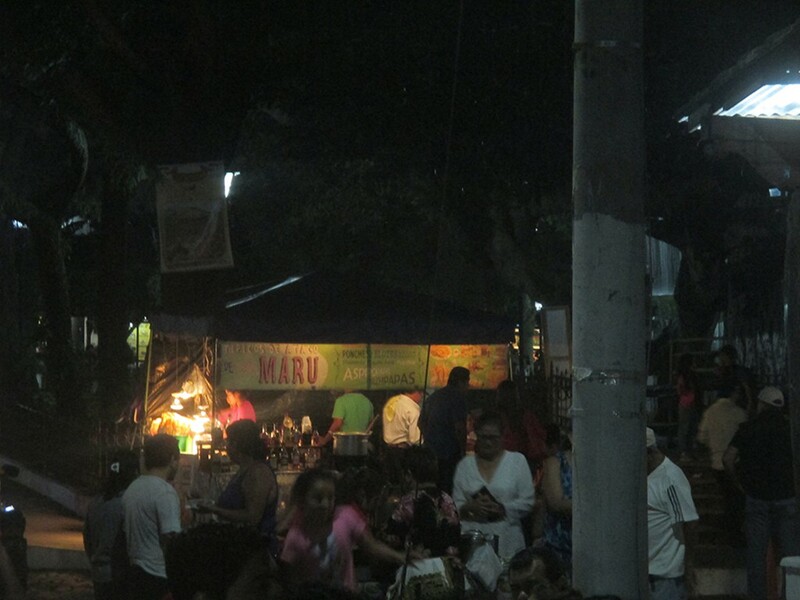 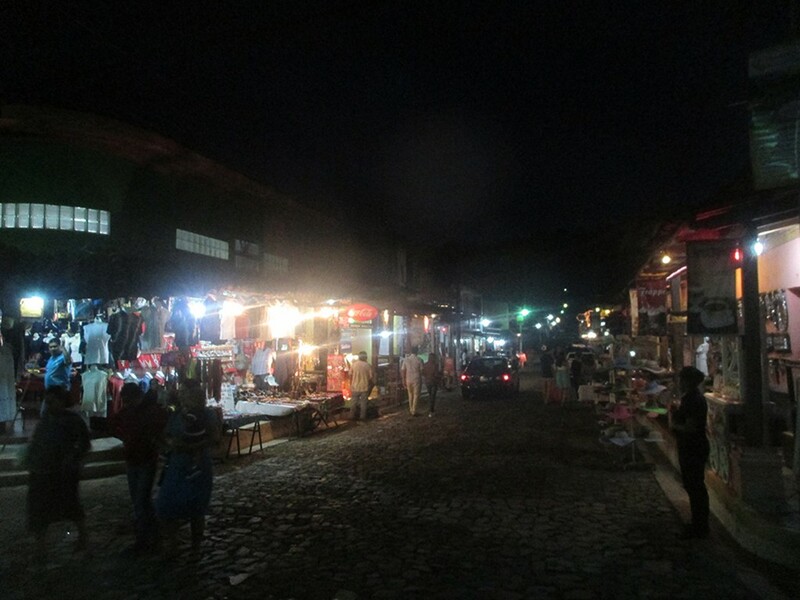 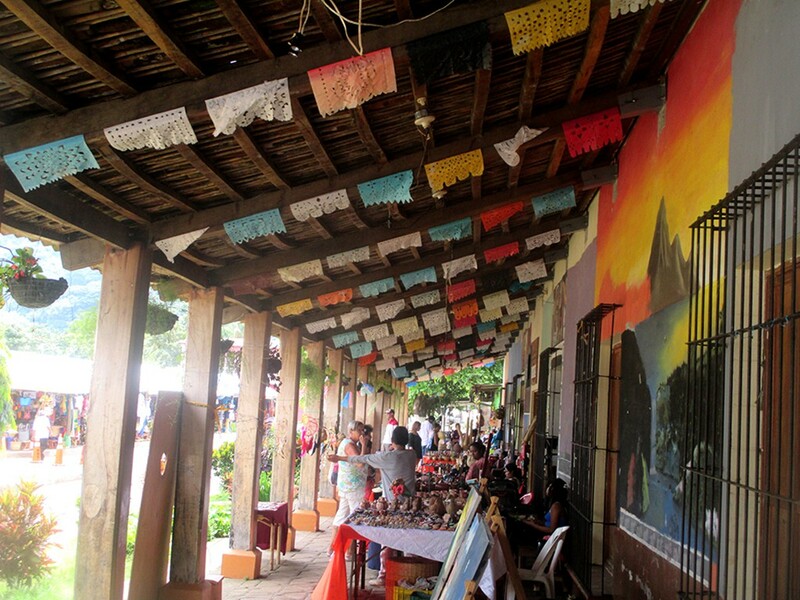 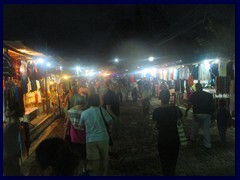 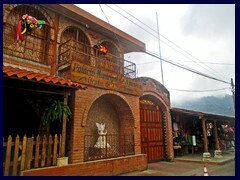 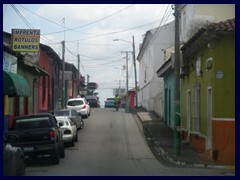 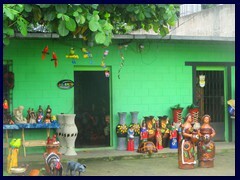 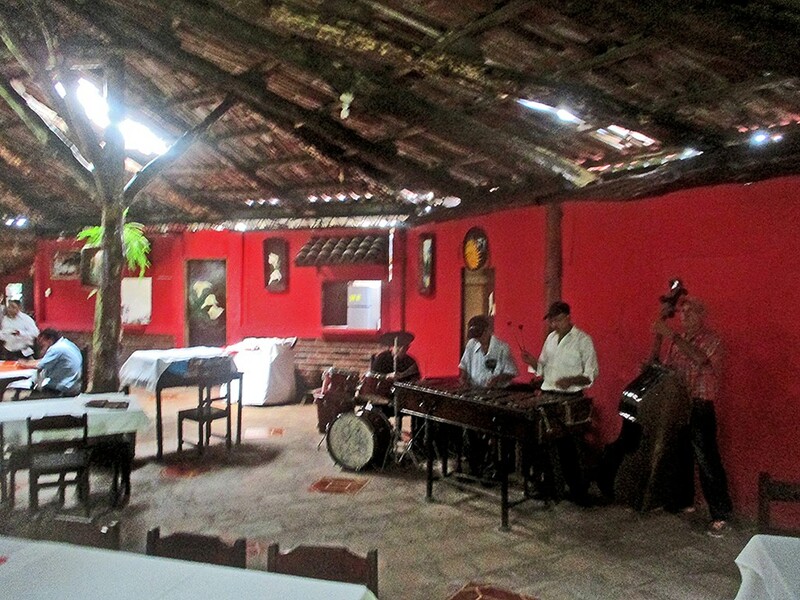 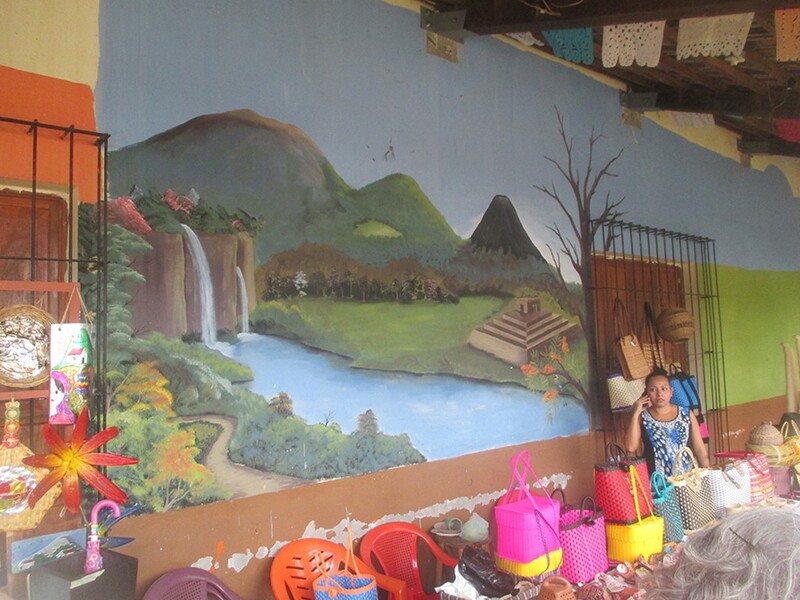 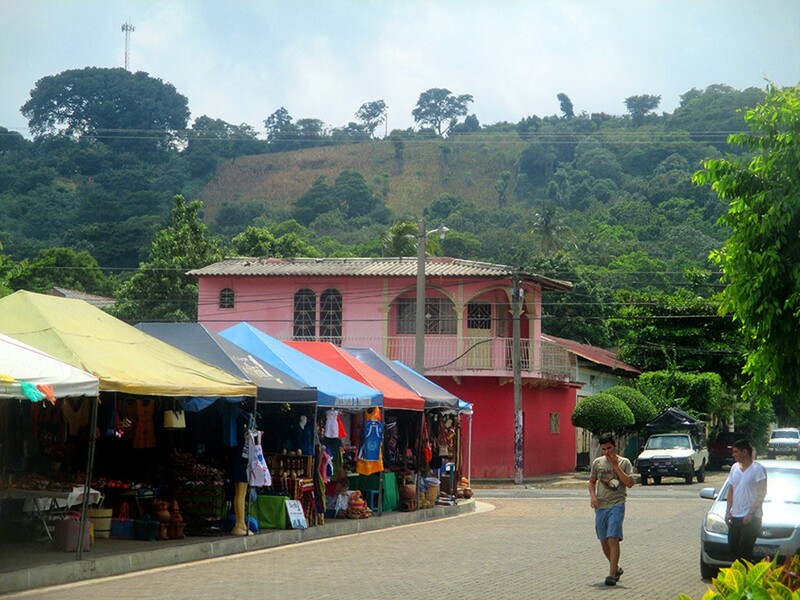 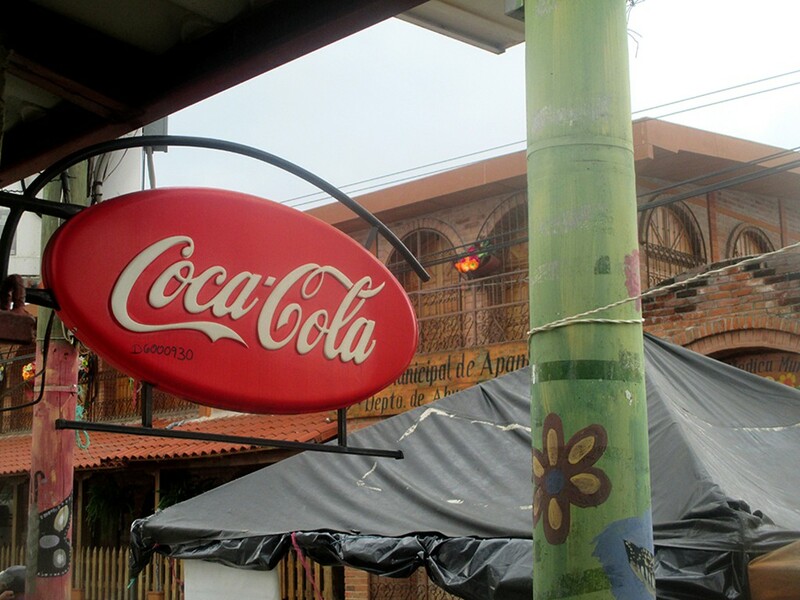 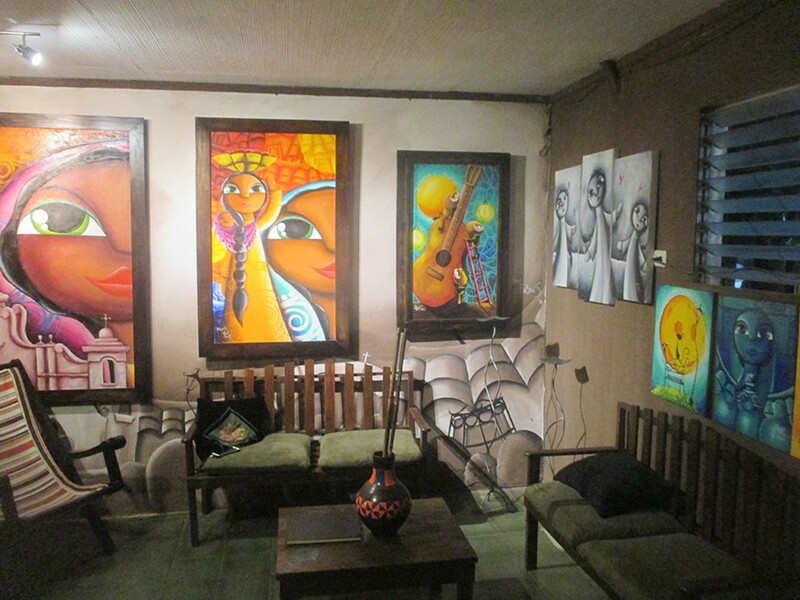 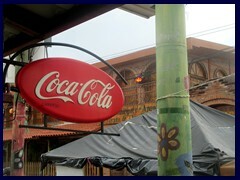 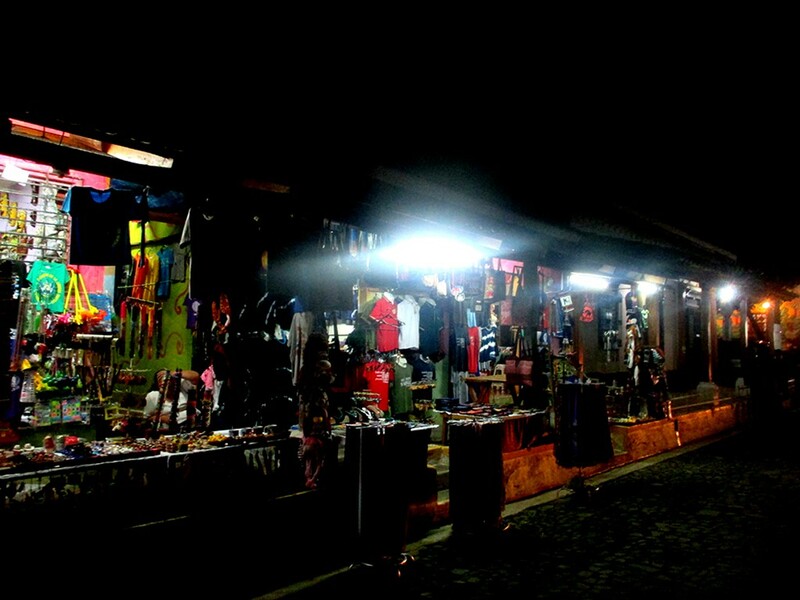 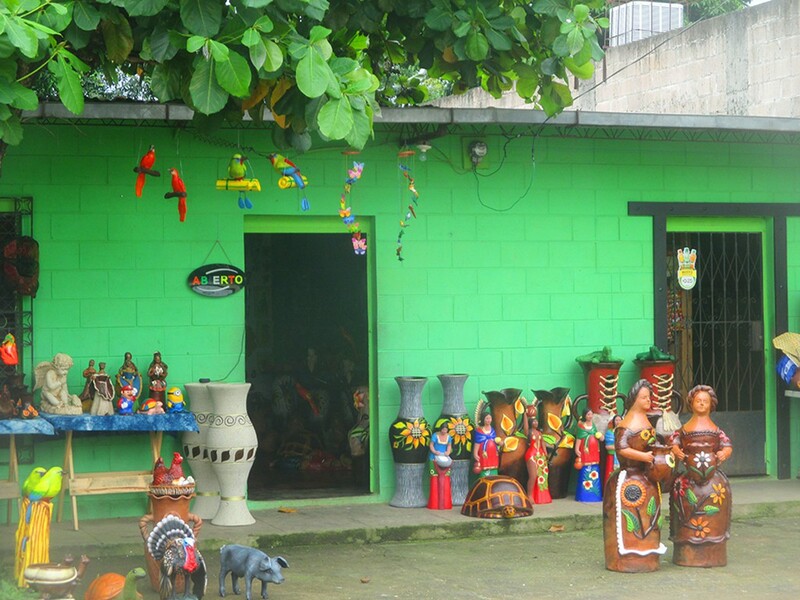 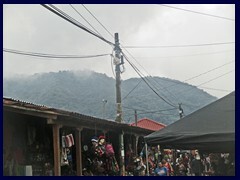 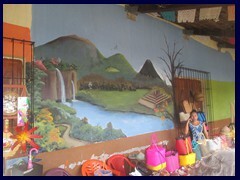 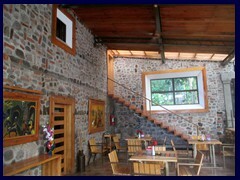 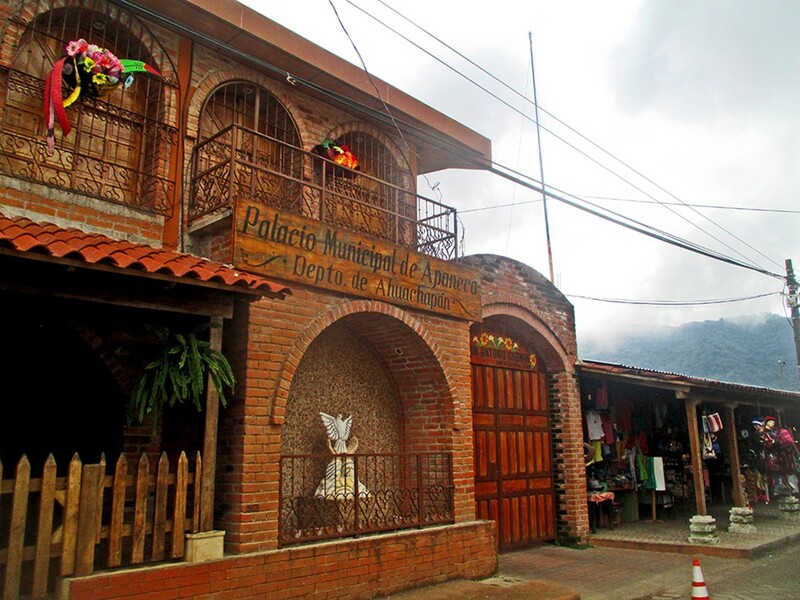 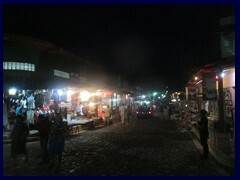 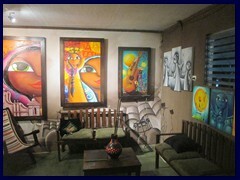 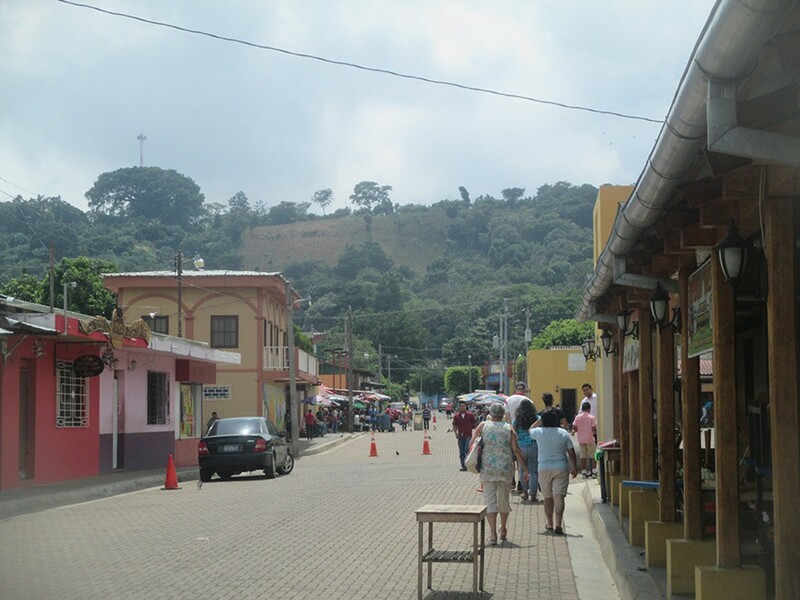 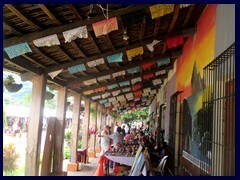 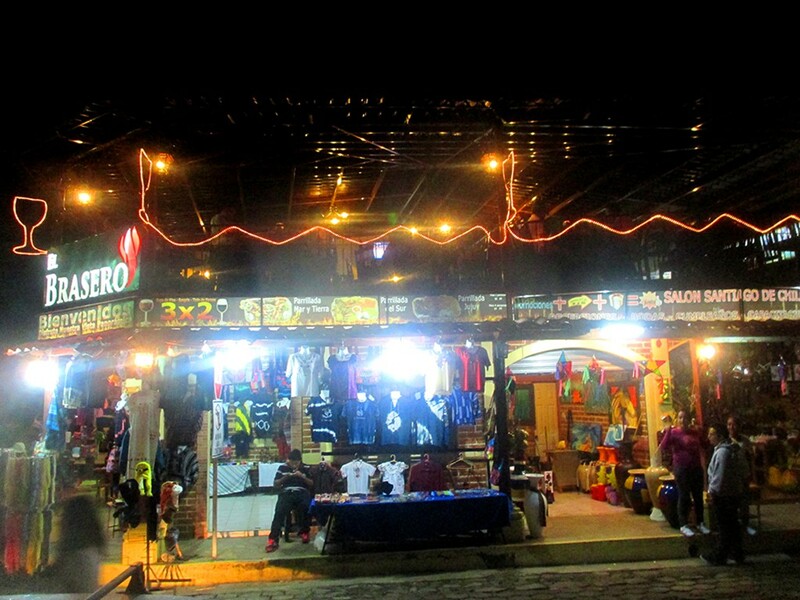 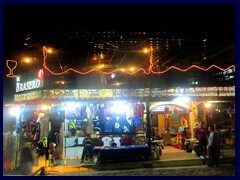 There are many markets selling native souvenirs, craft tiendas and beautiful cafés, in the town. 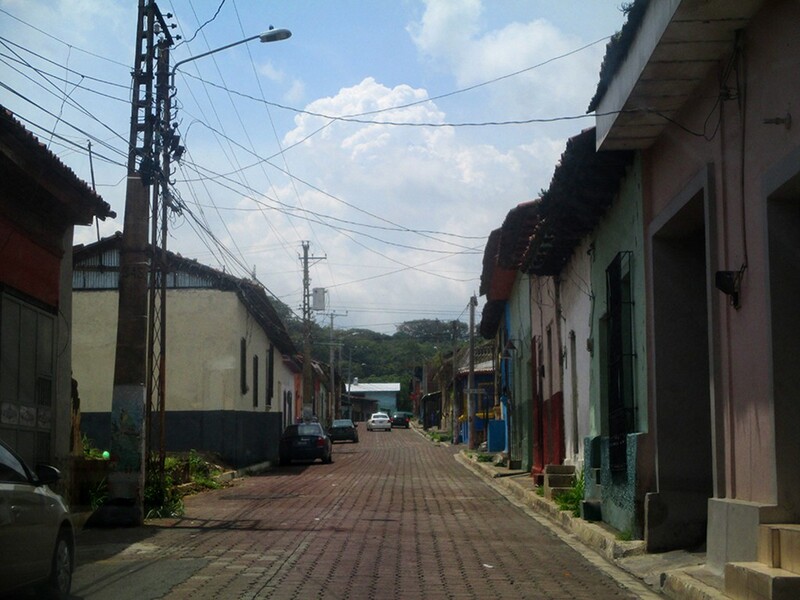 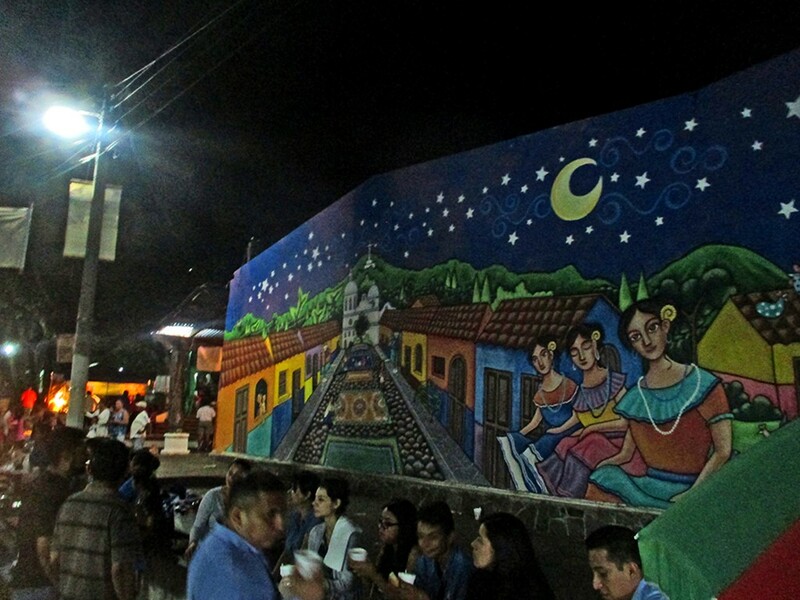 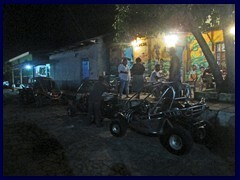 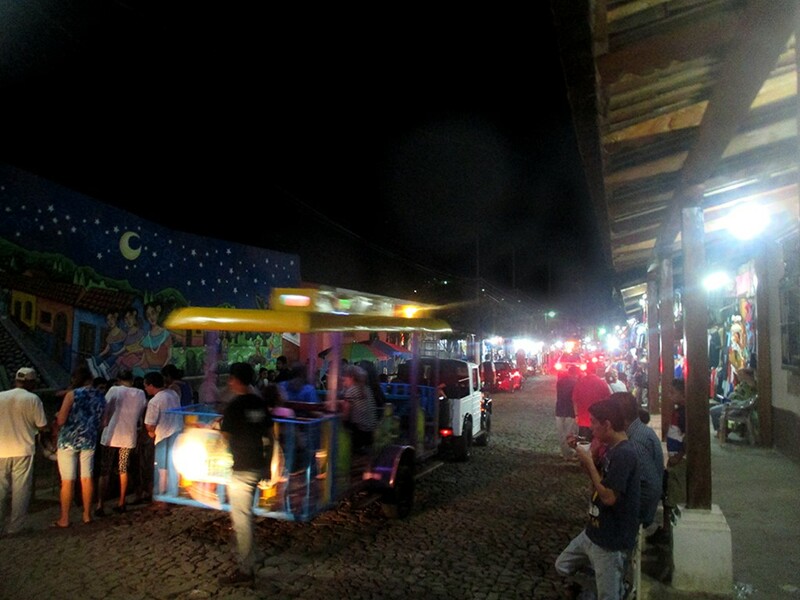 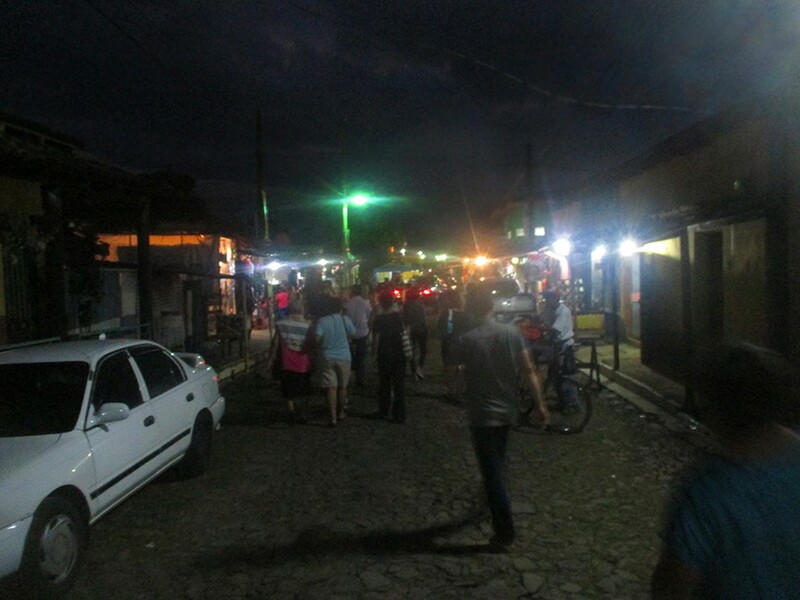 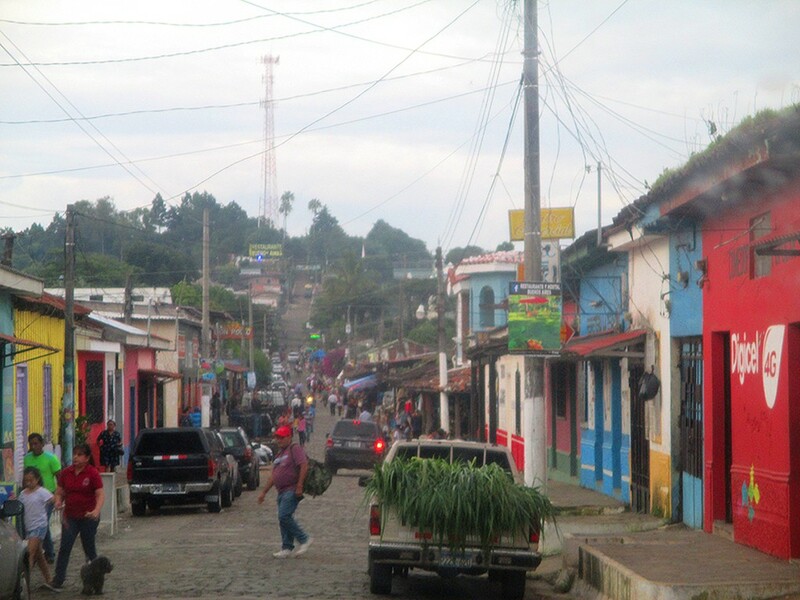 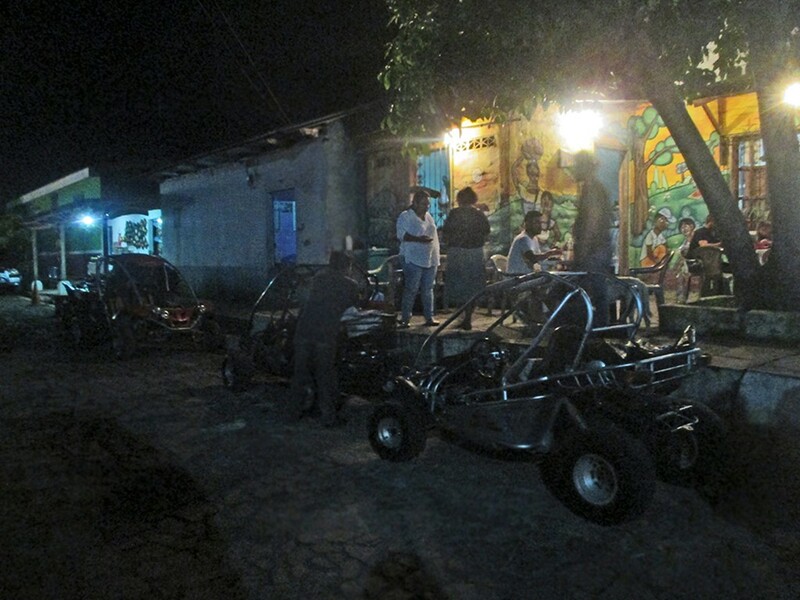 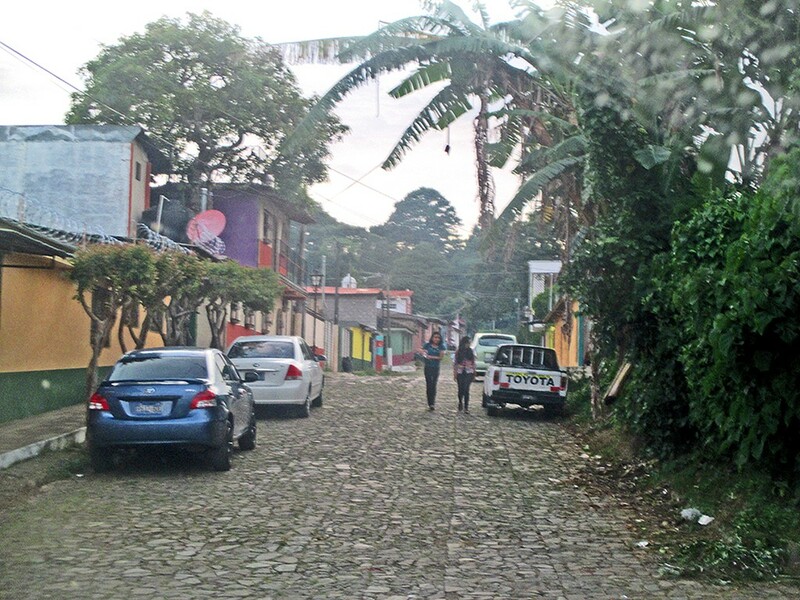 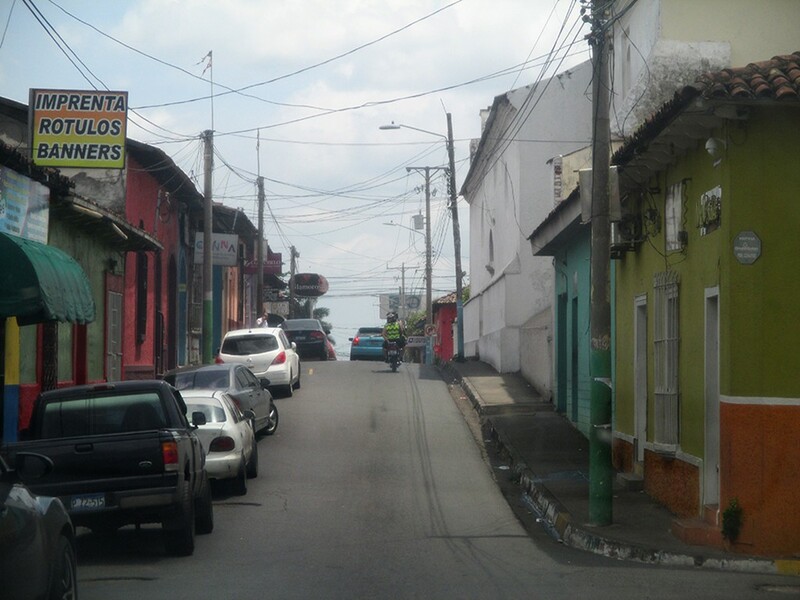 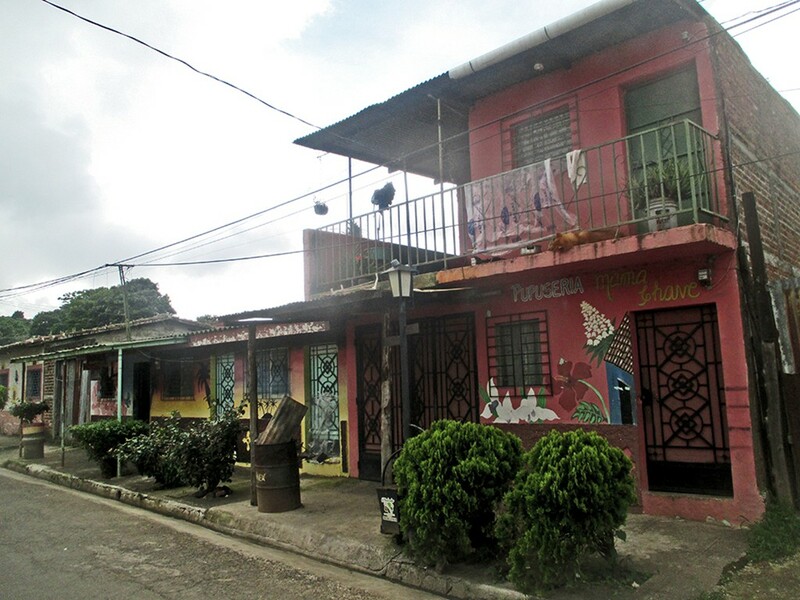 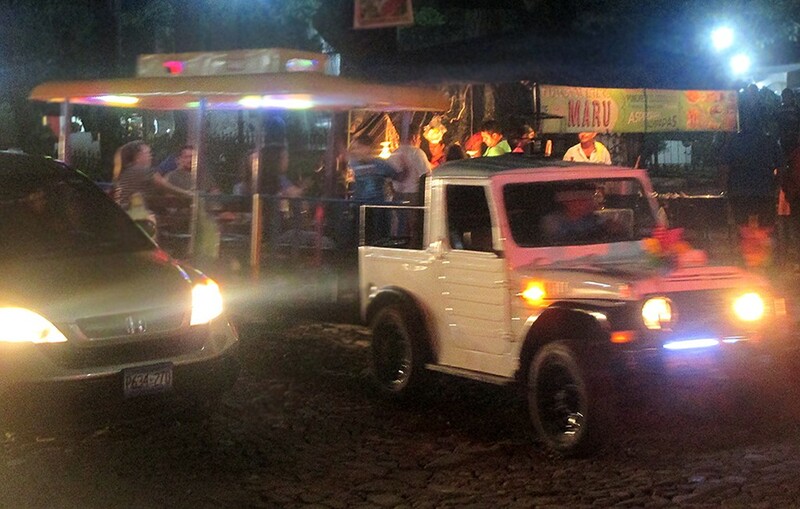 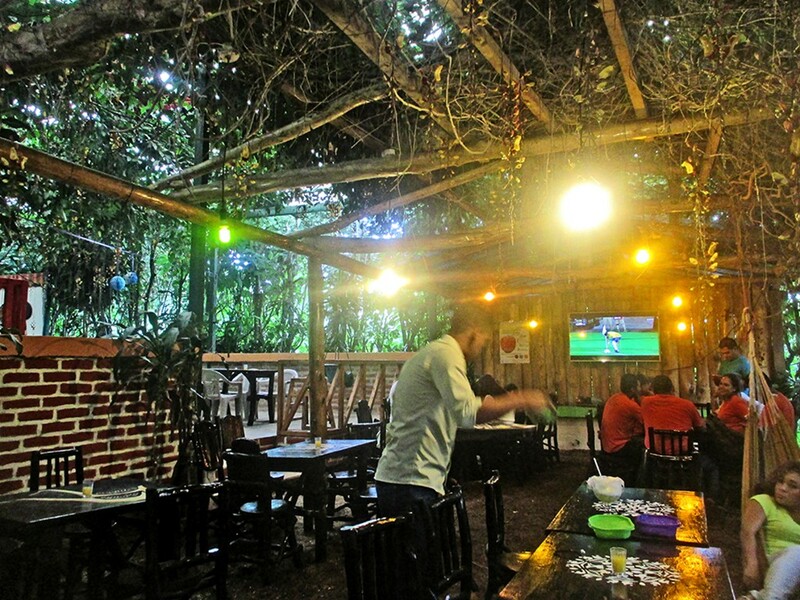 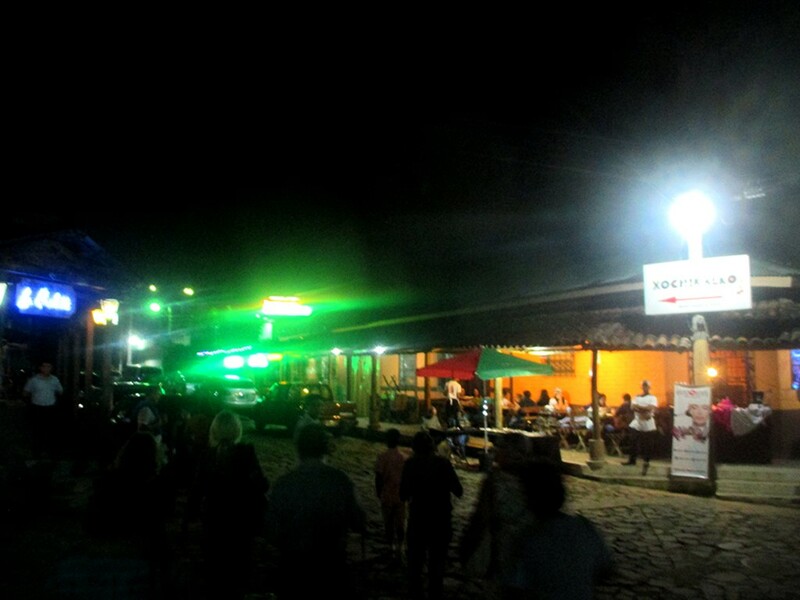 Despite being so small, Ataco is somewhat of a nightlife hub with several night clubs and restaurants, and people strolling around looking for a party. 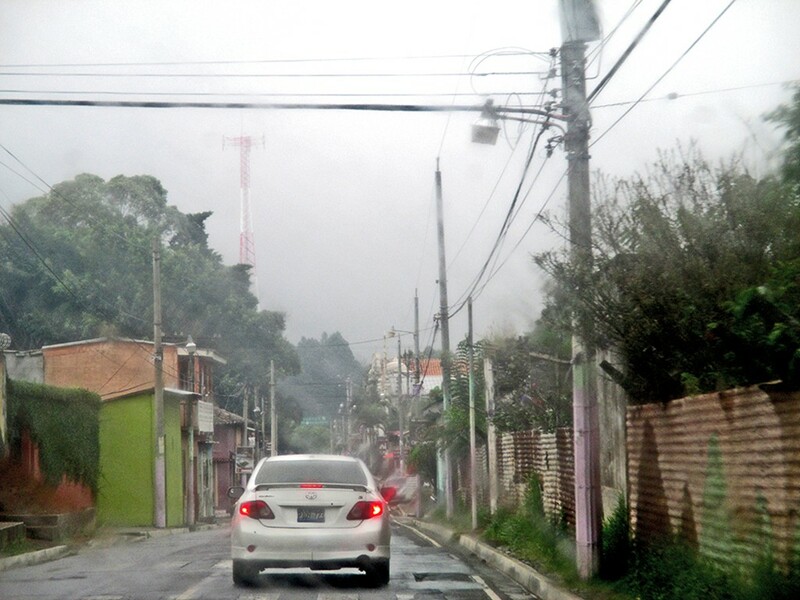 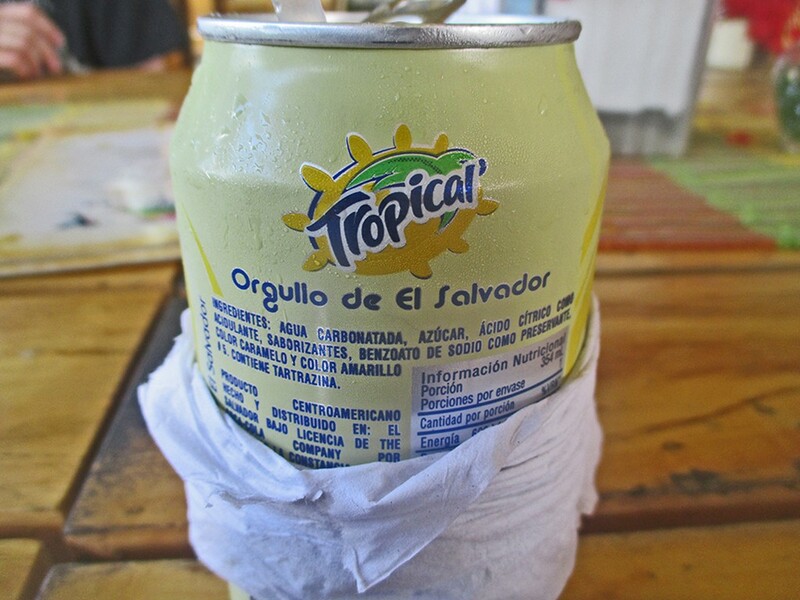 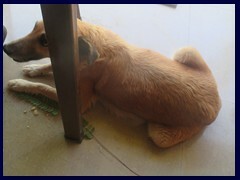 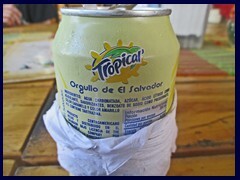 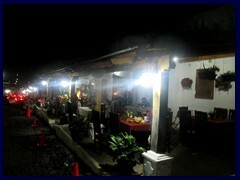 The atmosphere is much more genuine then in for example San Salvador. 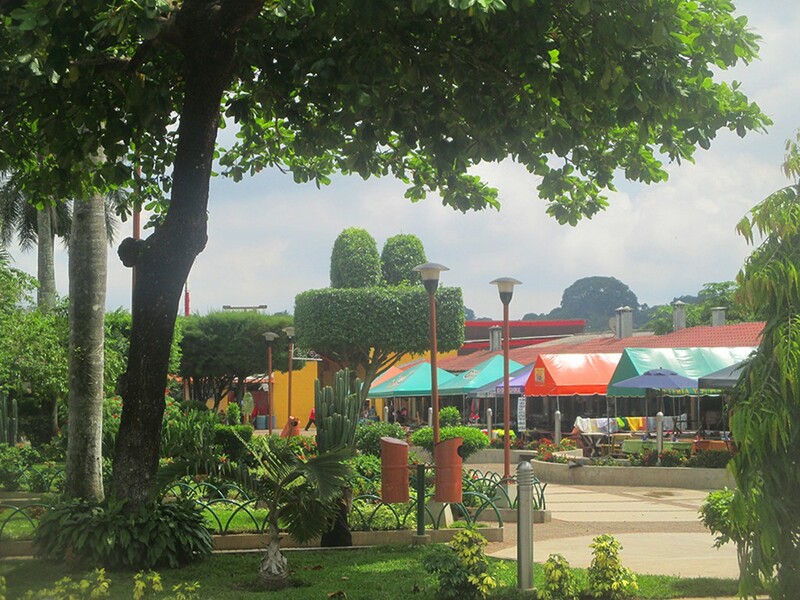 Ataco has the typical El Salvadorian Parque/Plaza in the heart of the town, beautiful with much greenery, a merry-go-around and of course a nice church next to it. 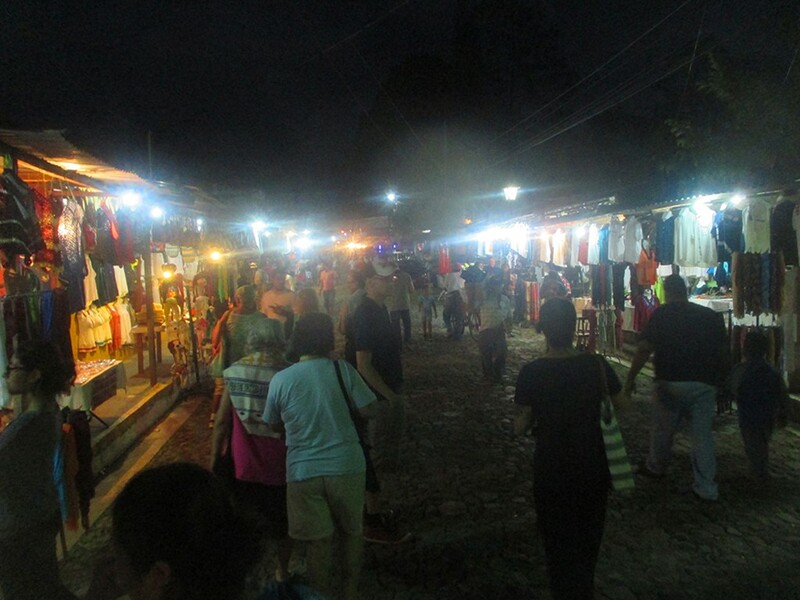 There are many charming features in this town, like a jeep train that drives visitors around, a VW Beetle rebuilt to a food stand and an arcade, Arcadia Municipal where you can buy heavy metal lamps and other odd objectss! 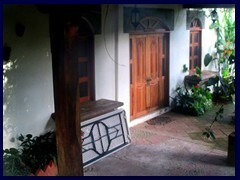 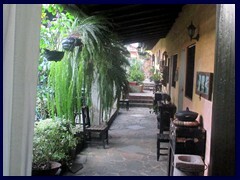 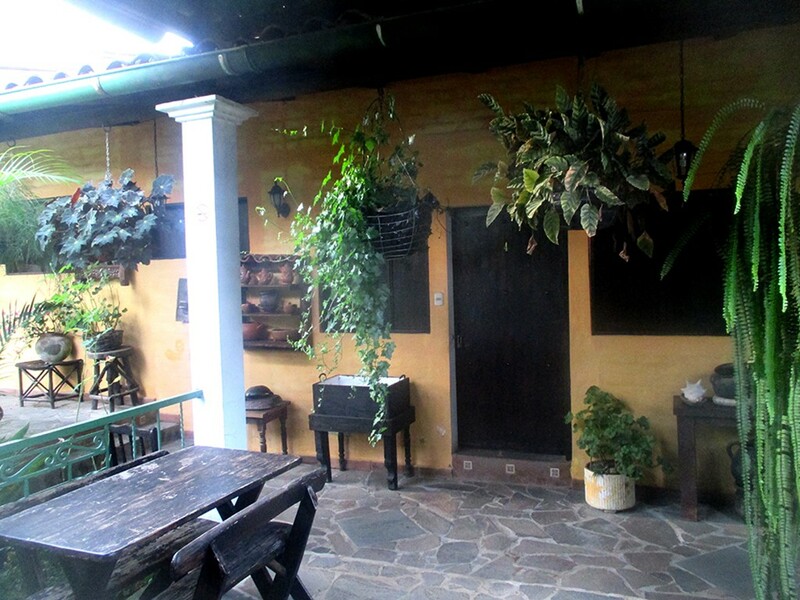 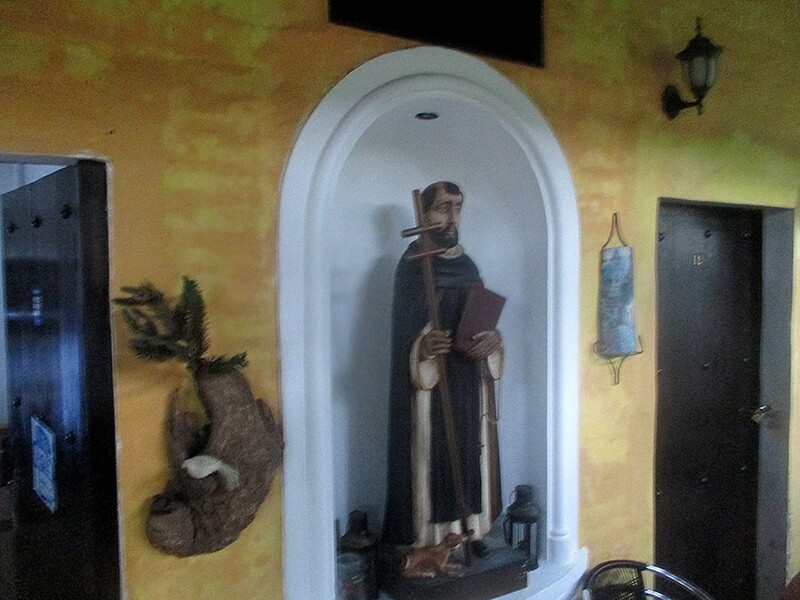 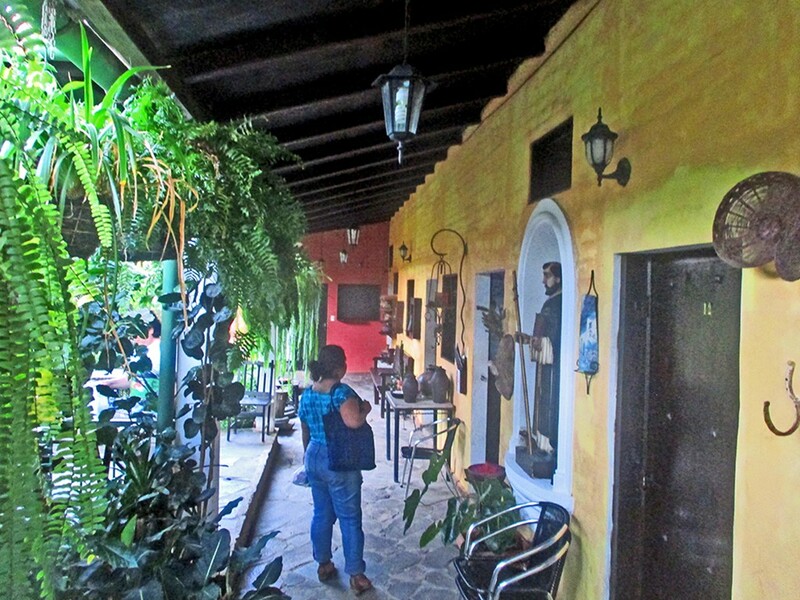 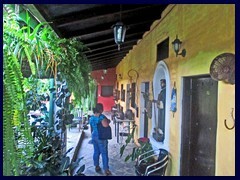 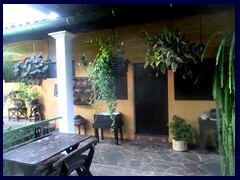 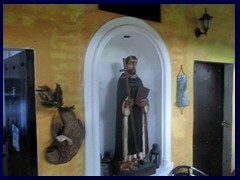 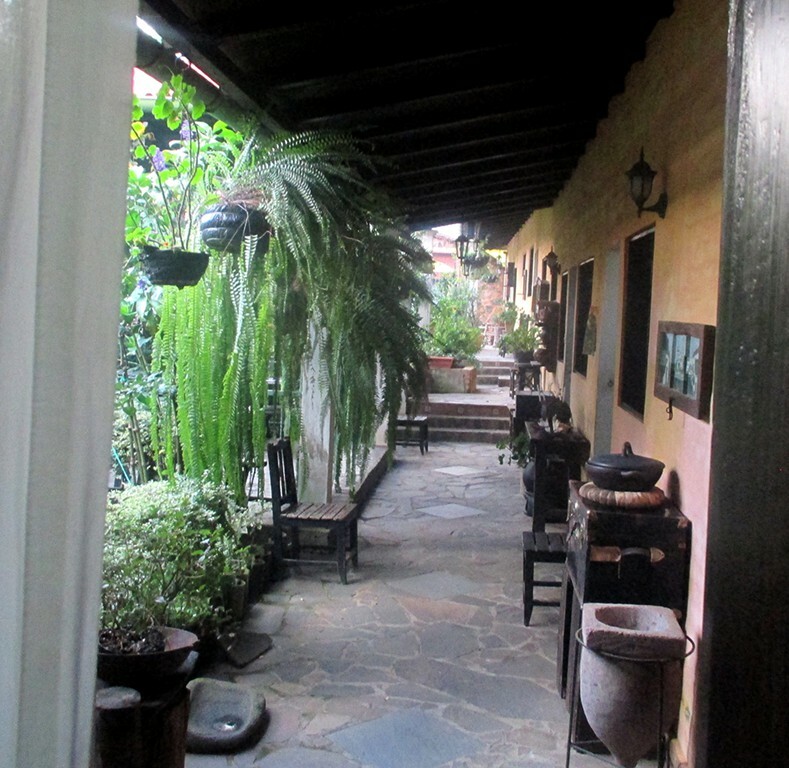 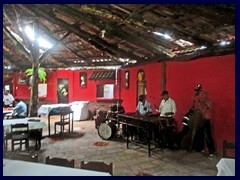 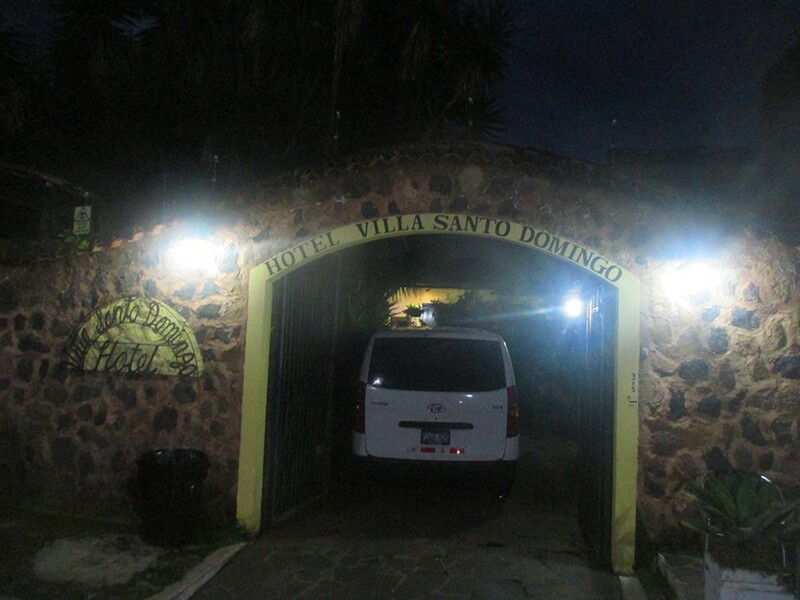 We stayed at the Hotel Santo Domingo in Ataco, a very picturesque, small hotel that is built around a beautiful courtyard. 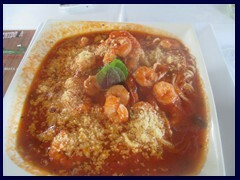 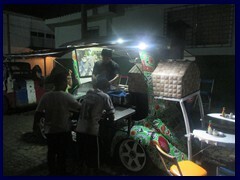 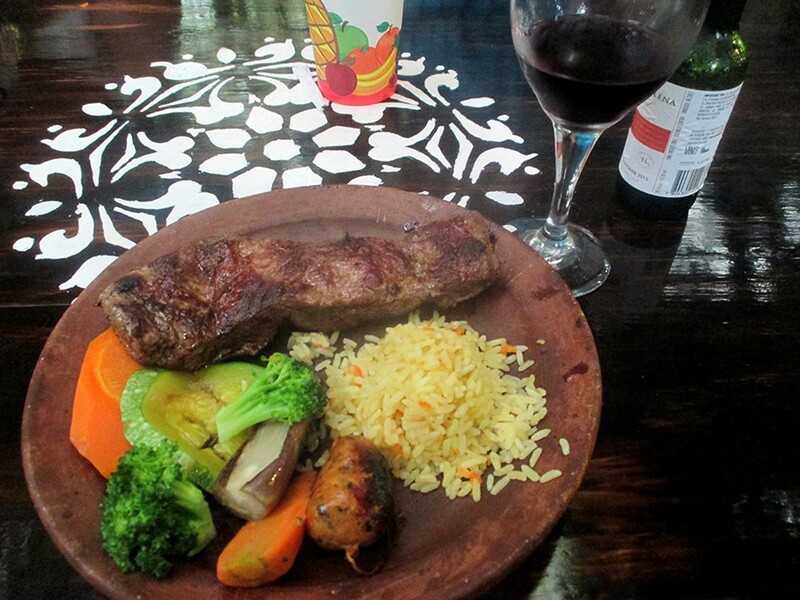 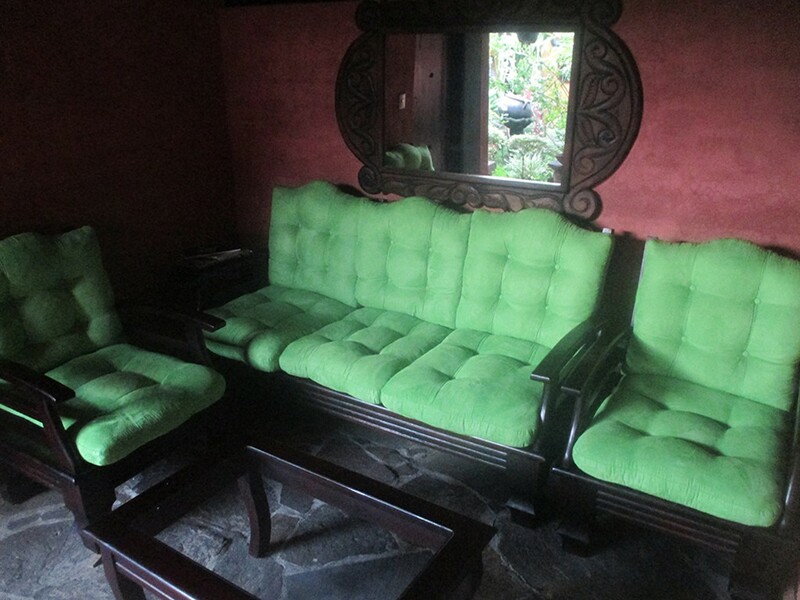 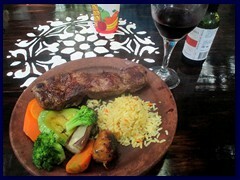 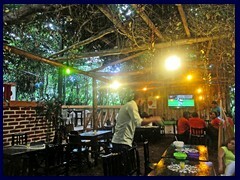 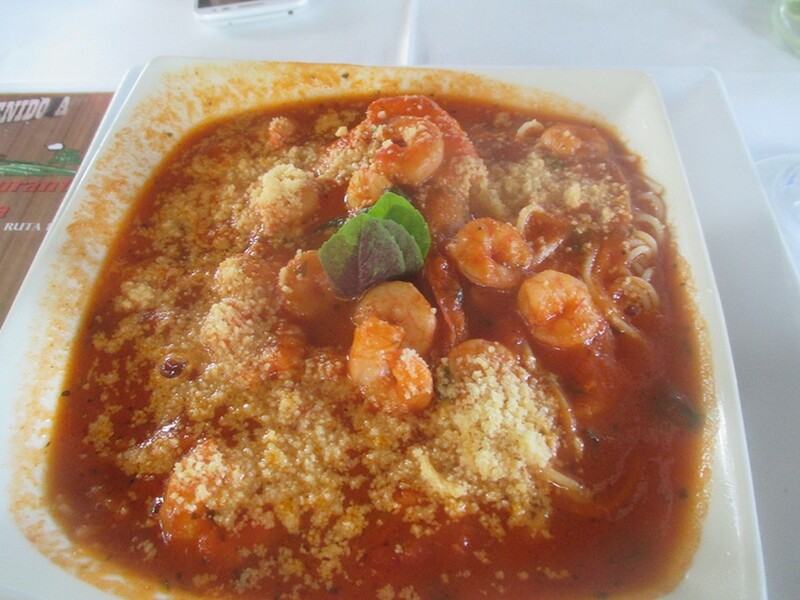 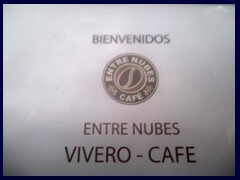 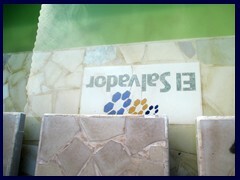 The staff doesn't know English and was a bit confused but the place is overall very friendly. 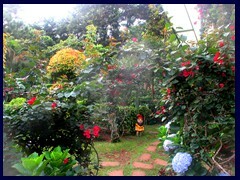 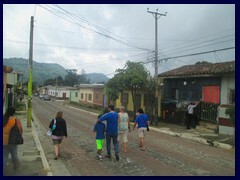 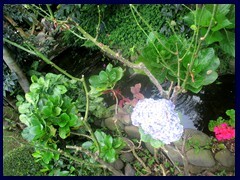 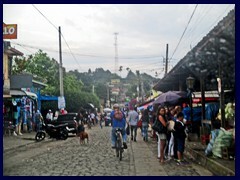 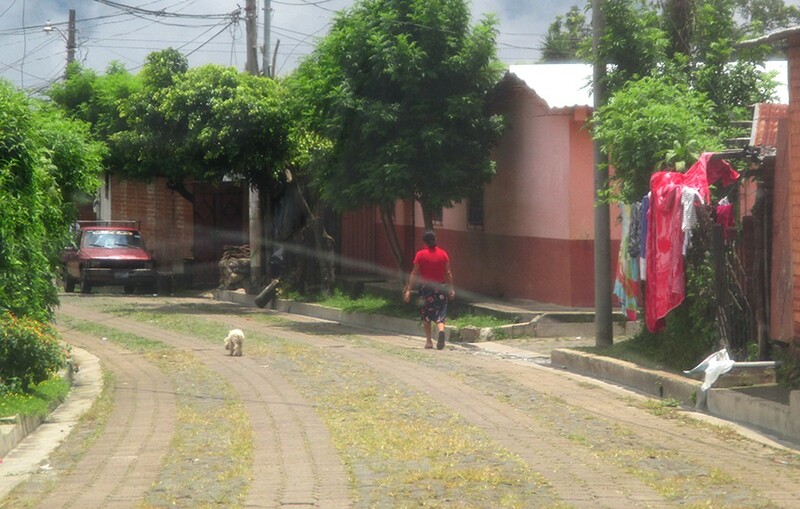 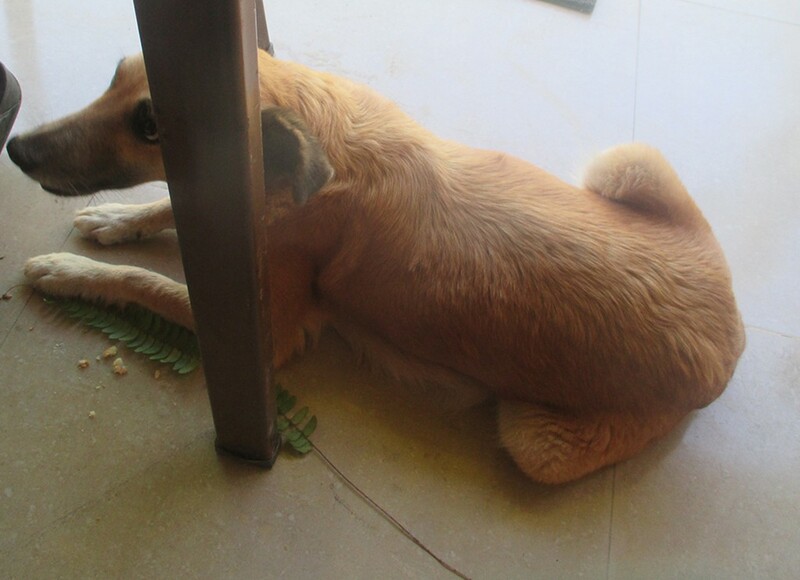 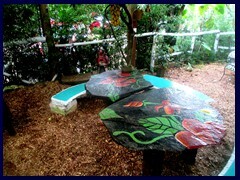 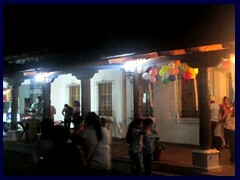 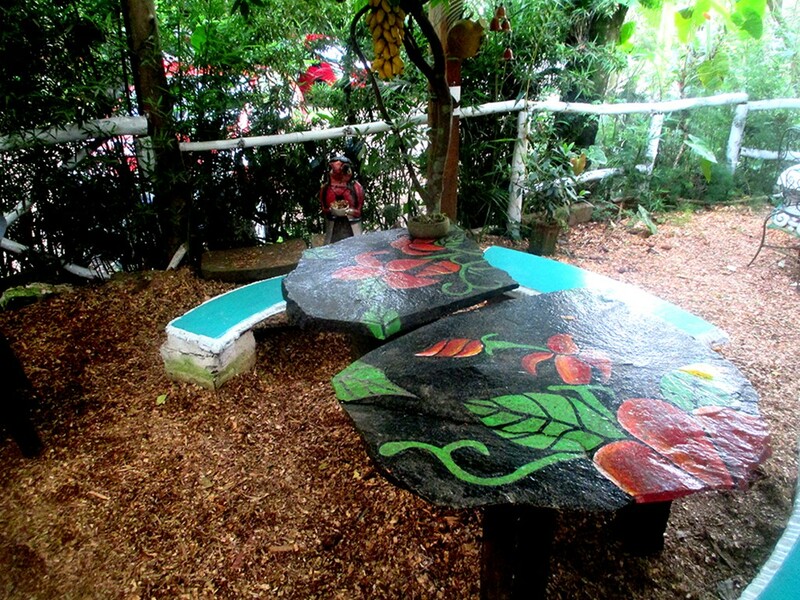 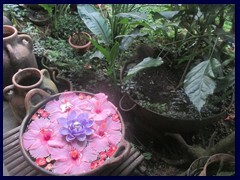 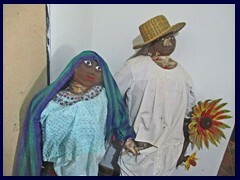 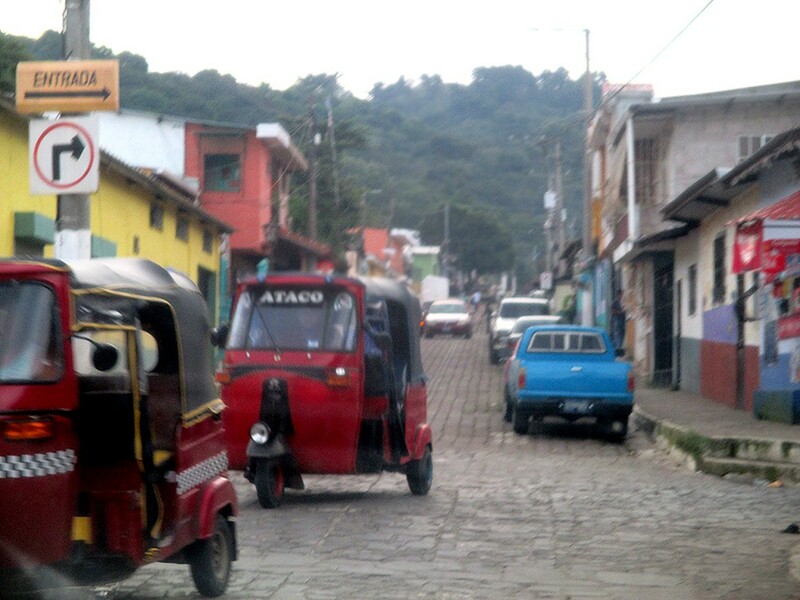 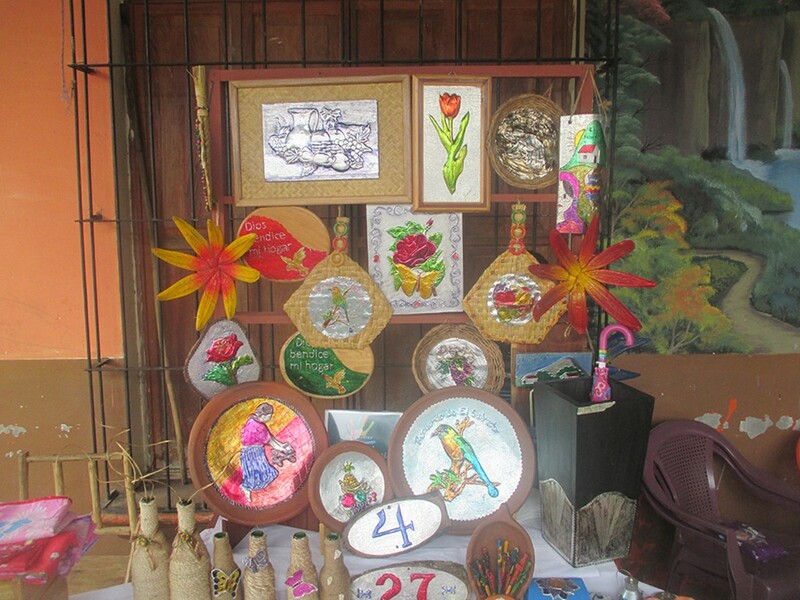 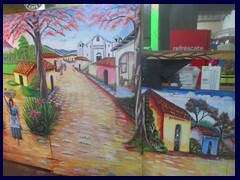 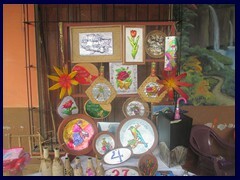 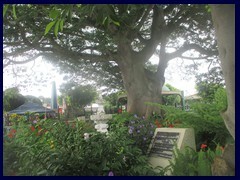 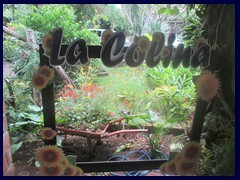 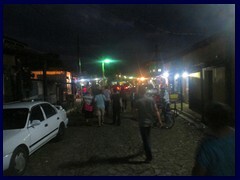 There are crafts and flowers everywhere and it is situated in the vibrant heart of Ataco (leading to noise of course). 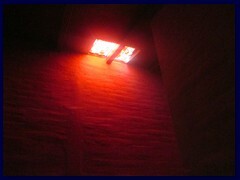 The room was cozy, even though it had no window, but it had a very high ceiling. 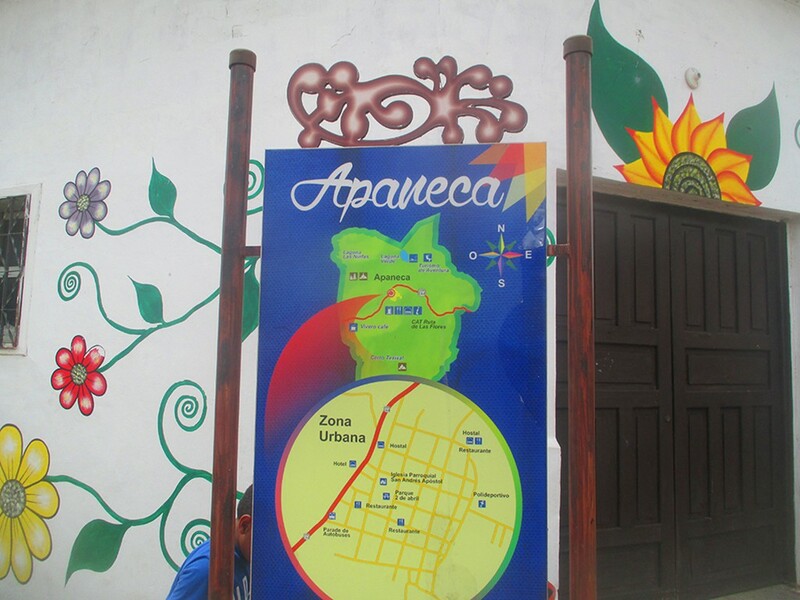 Apaneca: Population: 8 597. 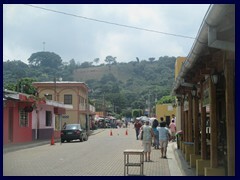 Department: Ahuachapán. 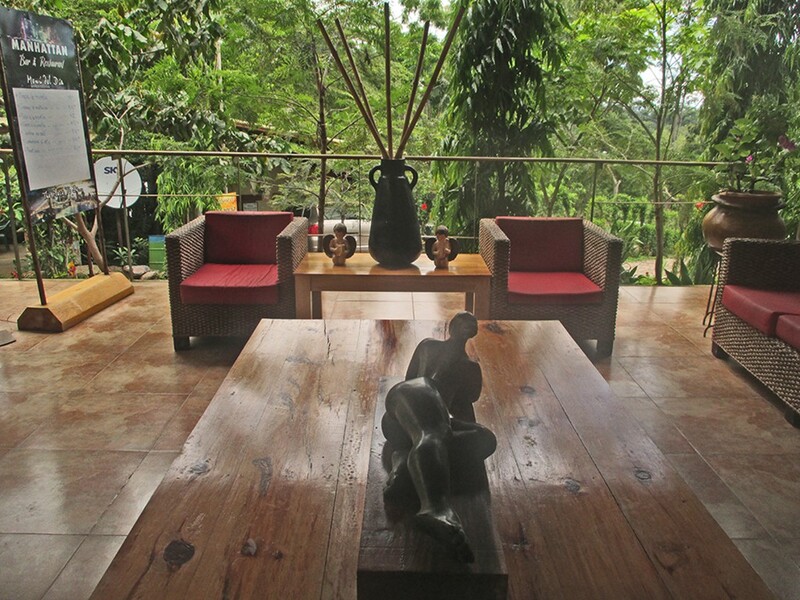 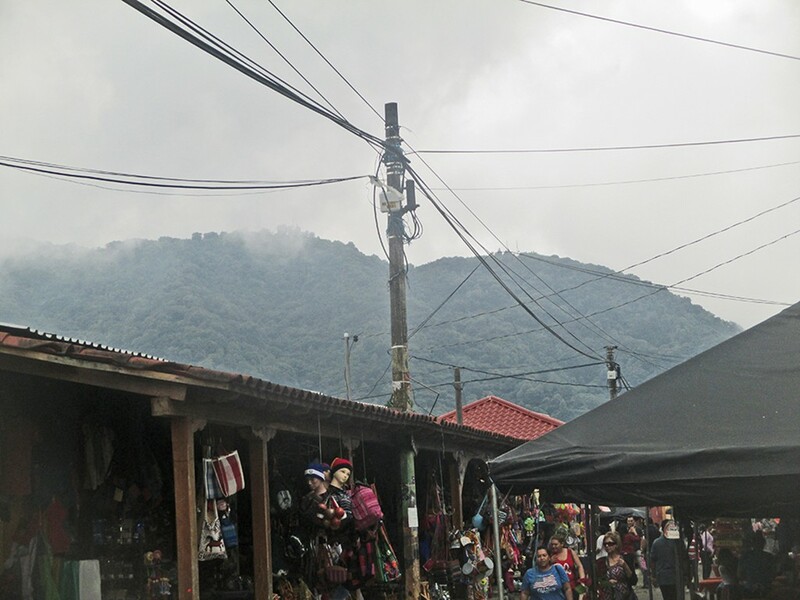 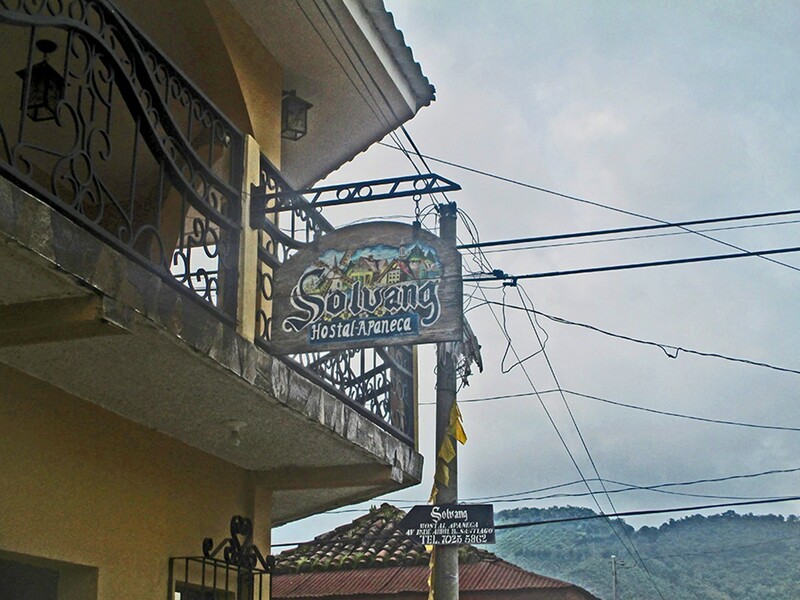 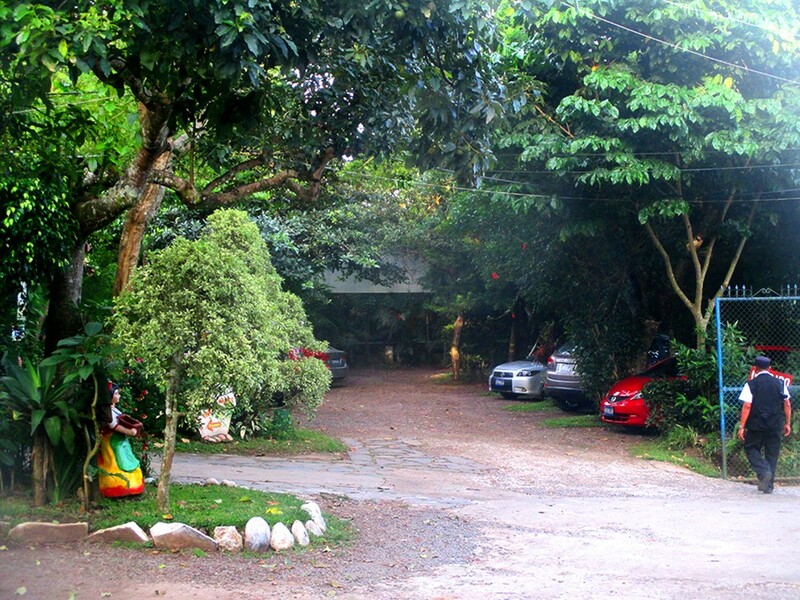 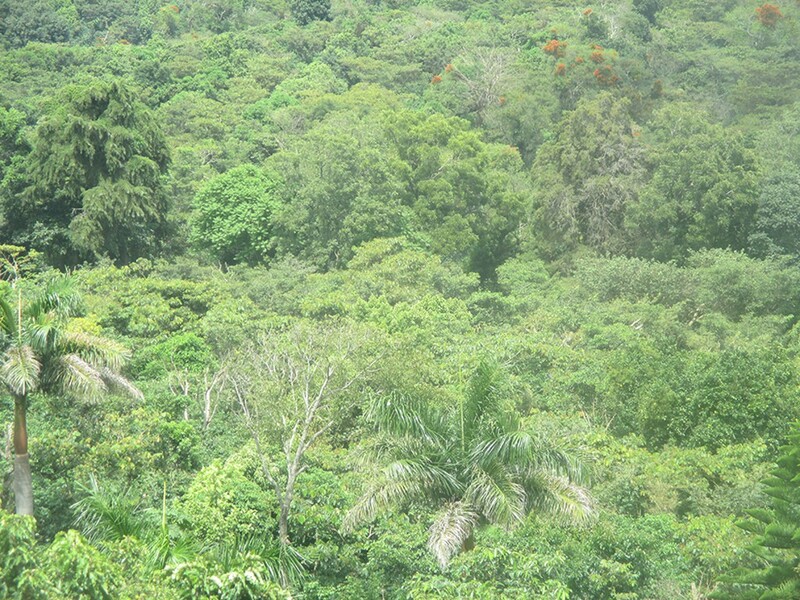 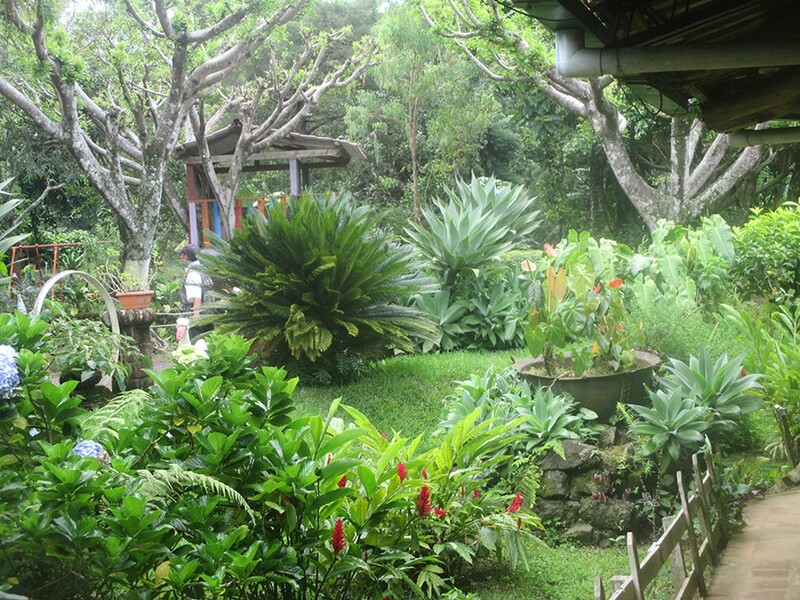 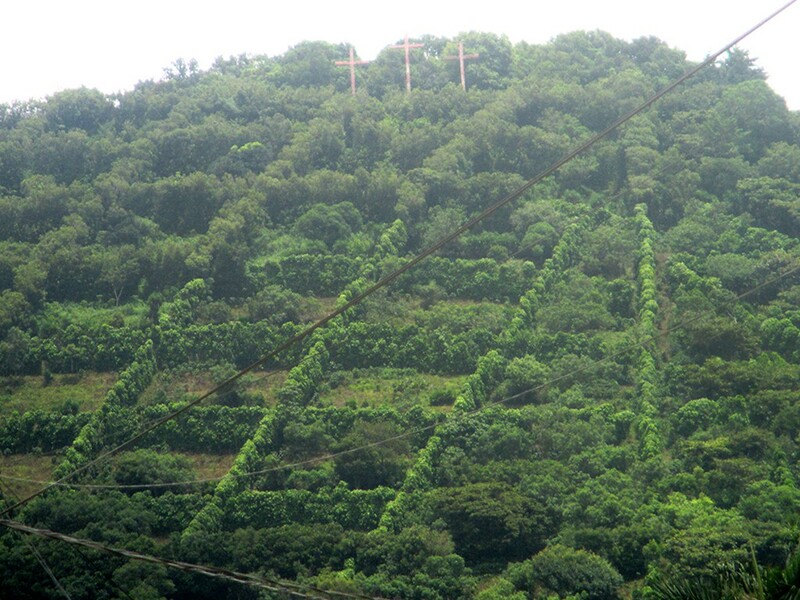 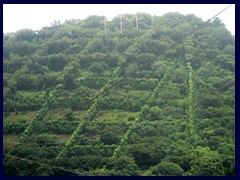 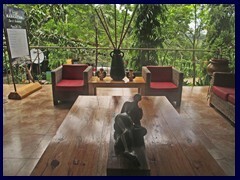 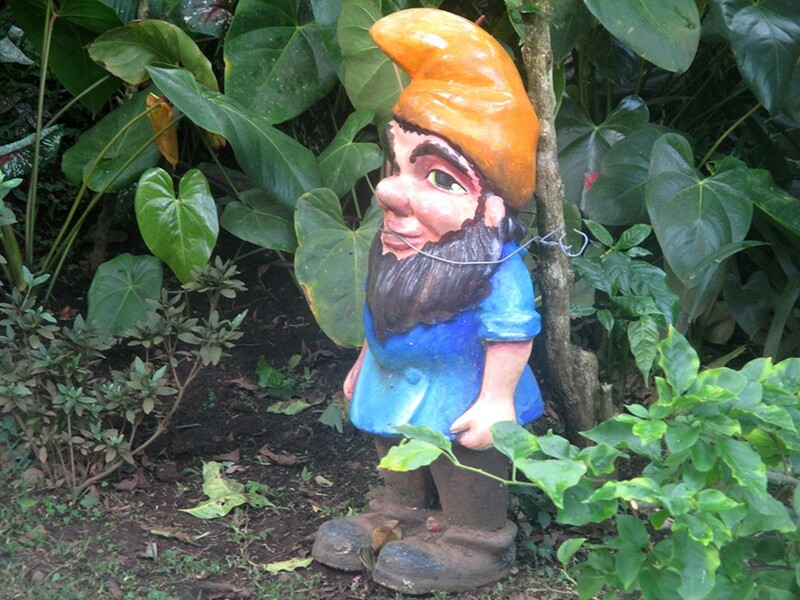 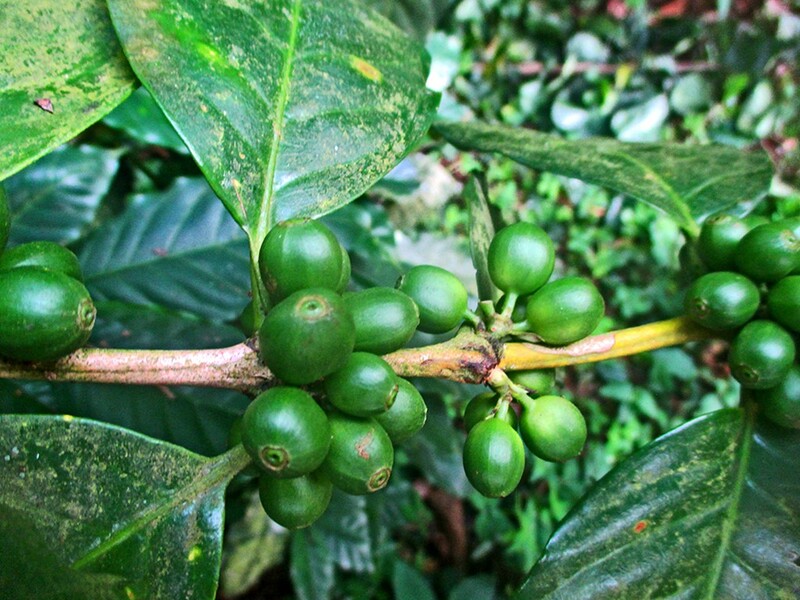 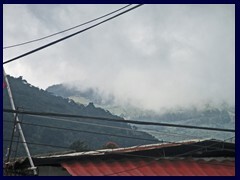 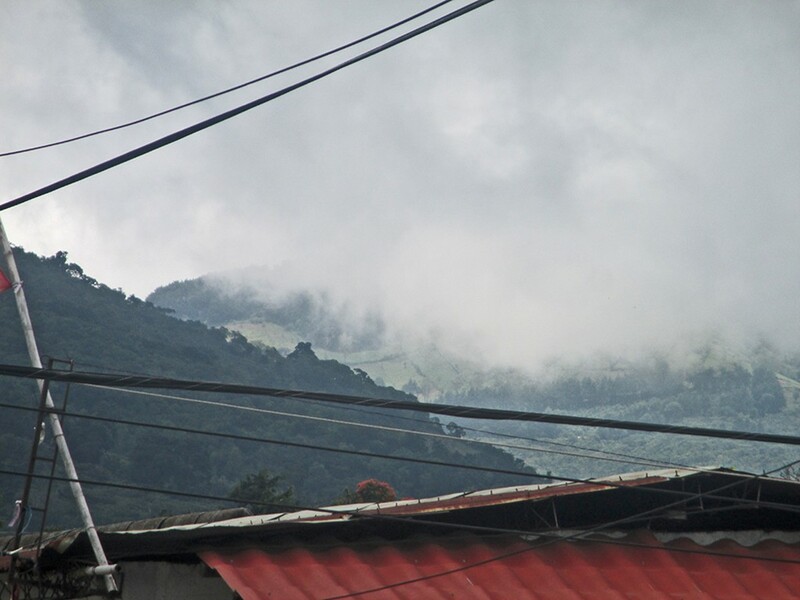 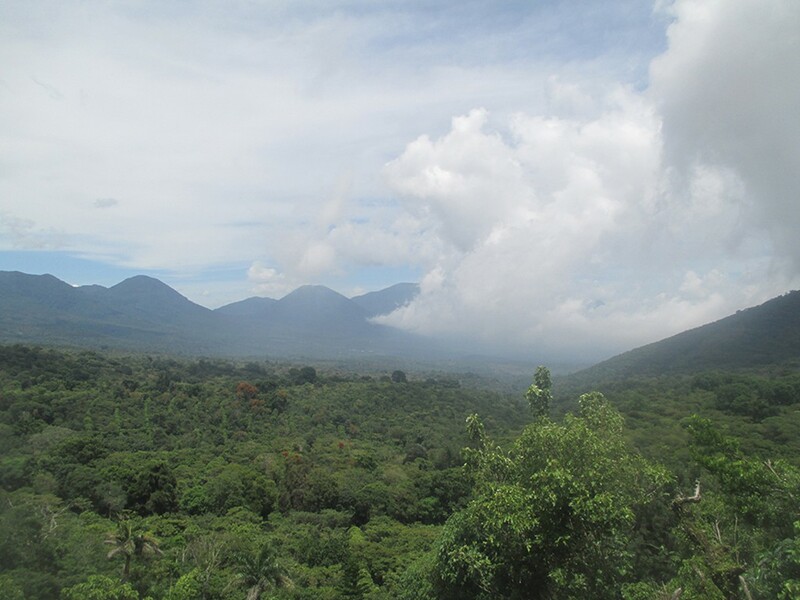 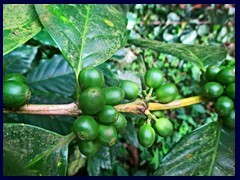 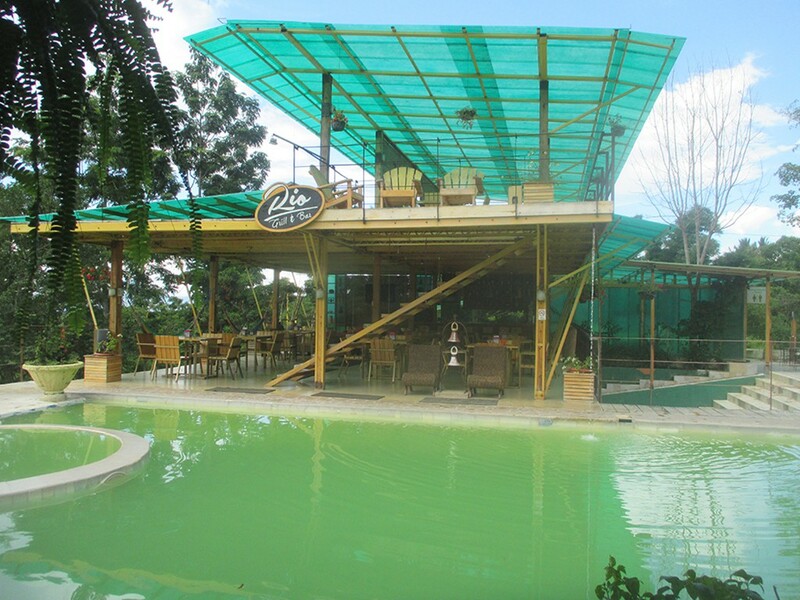 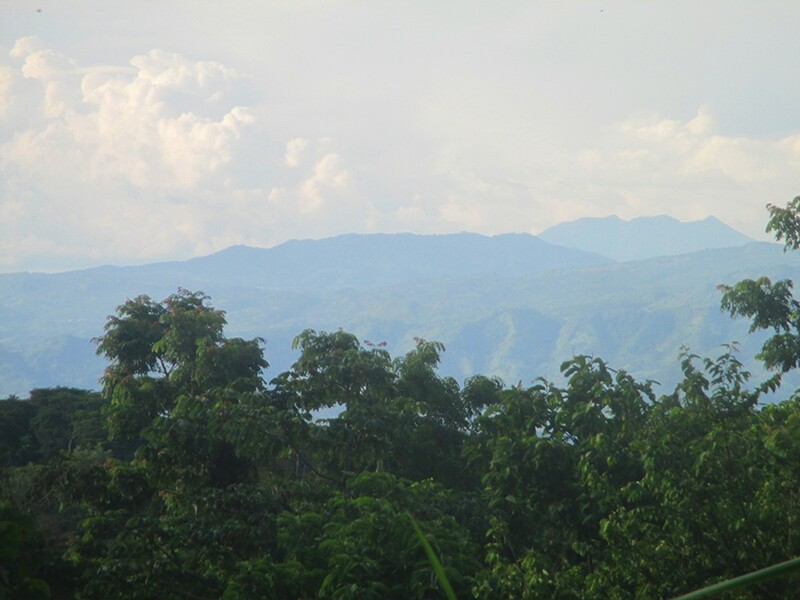 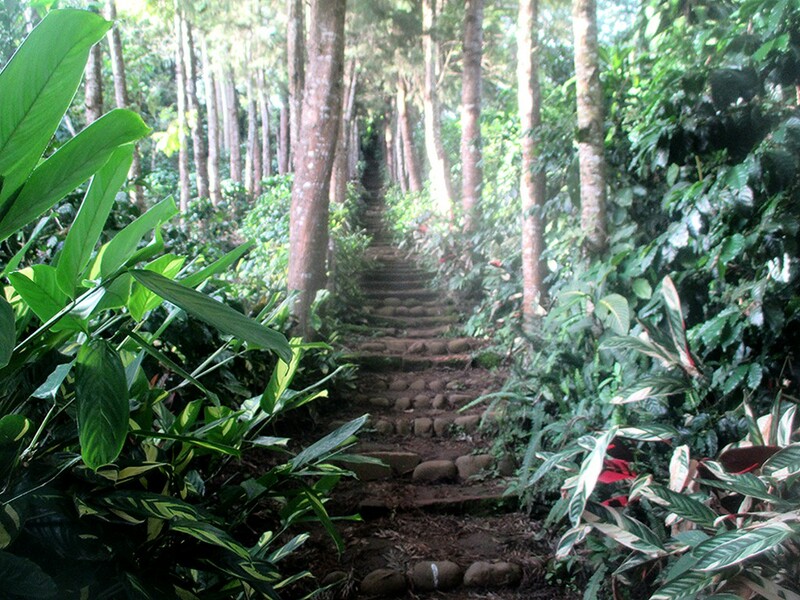 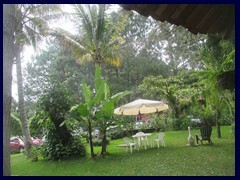 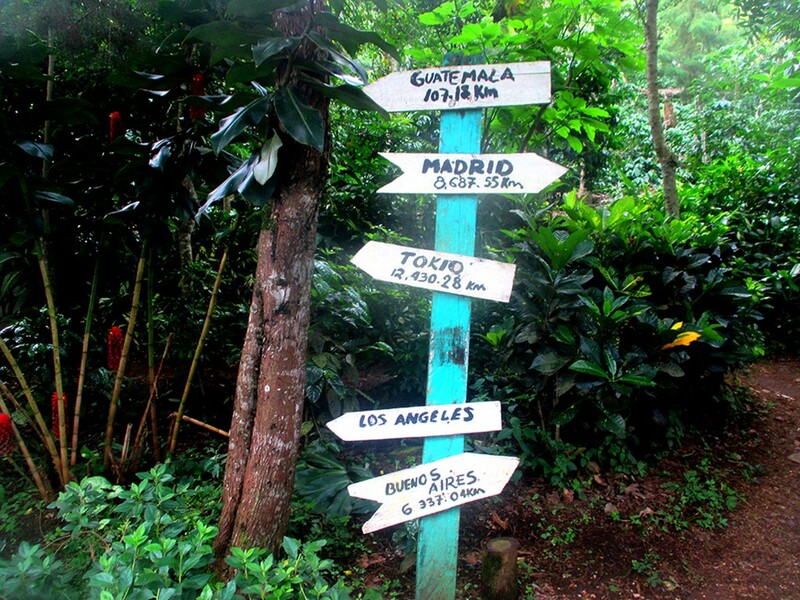 Known for surrounding hills of coffee plantations, and zipline. 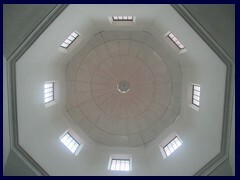 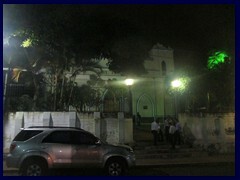 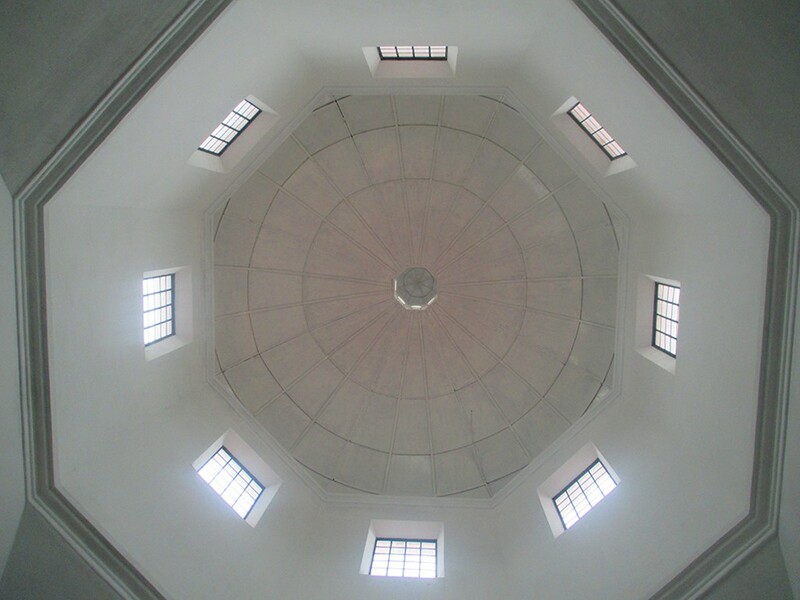 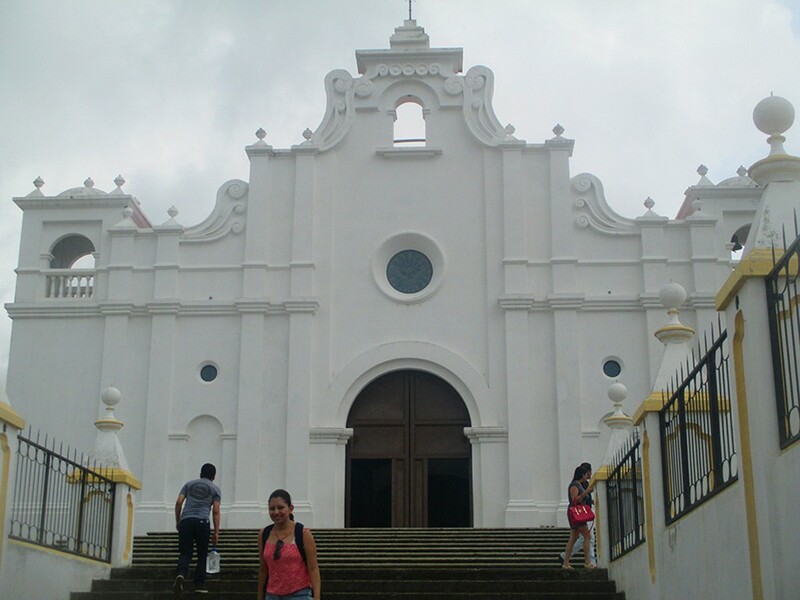 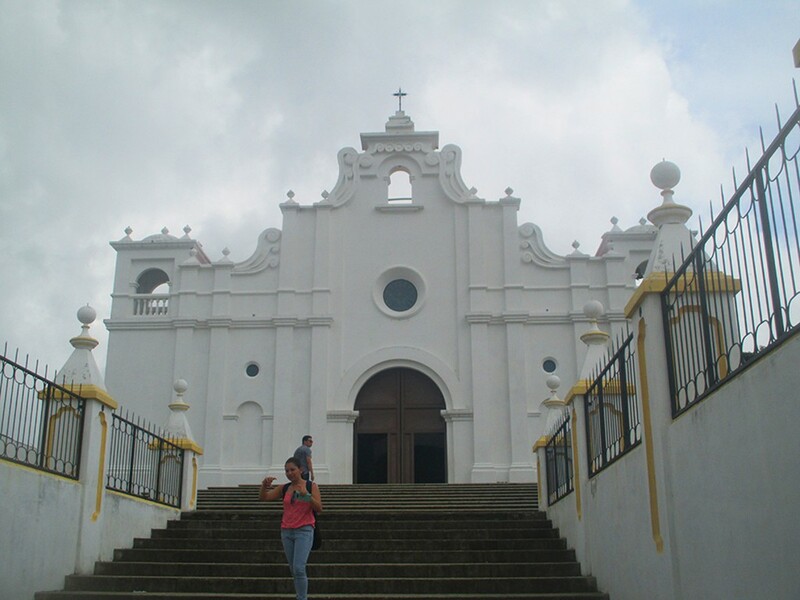 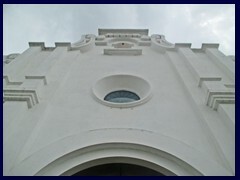 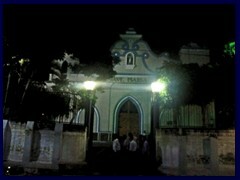 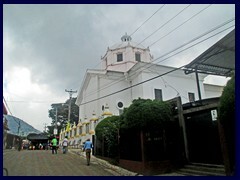 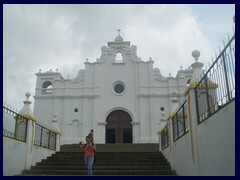 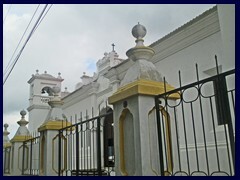 There is a nice white church that is under restoration after a bad earthquake. 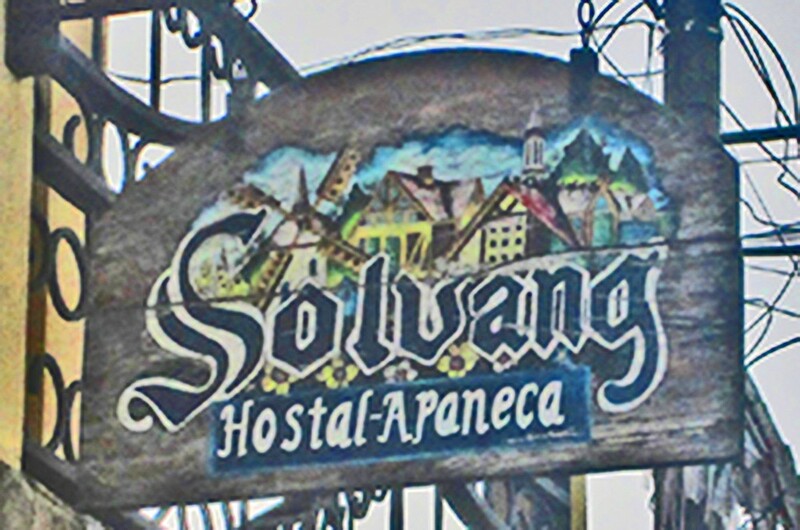 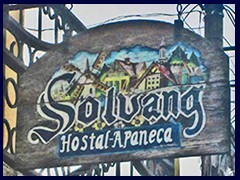 There is a hotel called Solvang, after the Danish town in California. 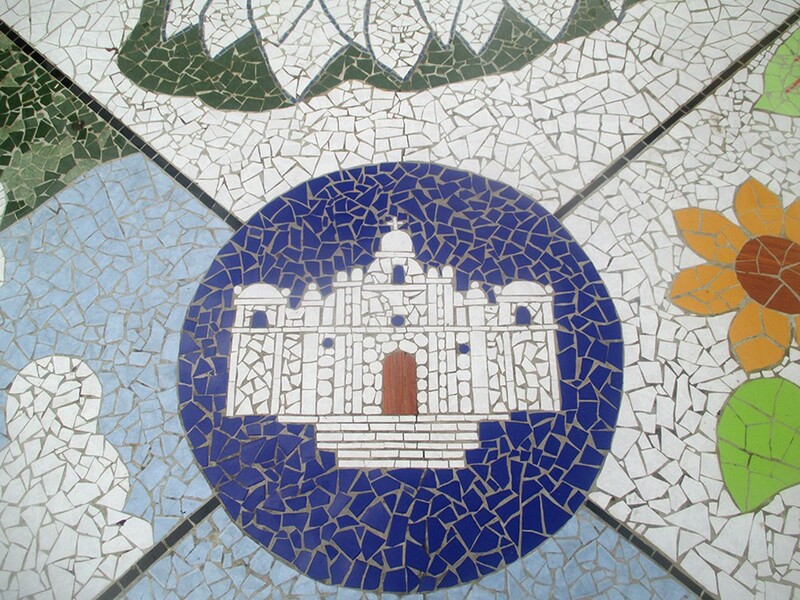 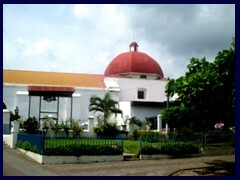 Casa de la Cultura and Palacio Municipal (the town hall) are other buildings worth mentioning. 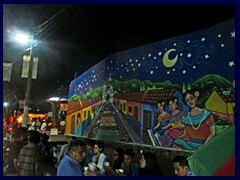 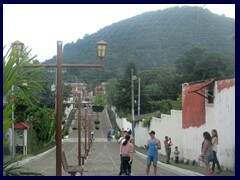 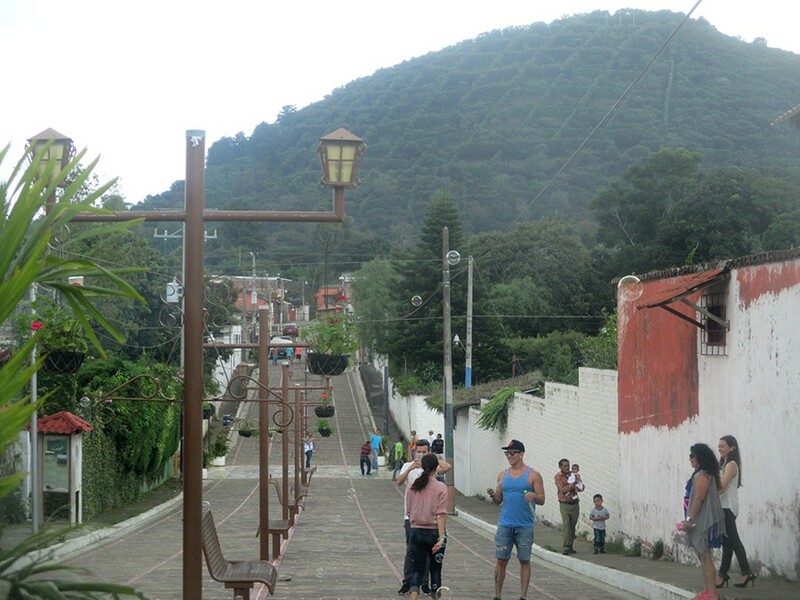 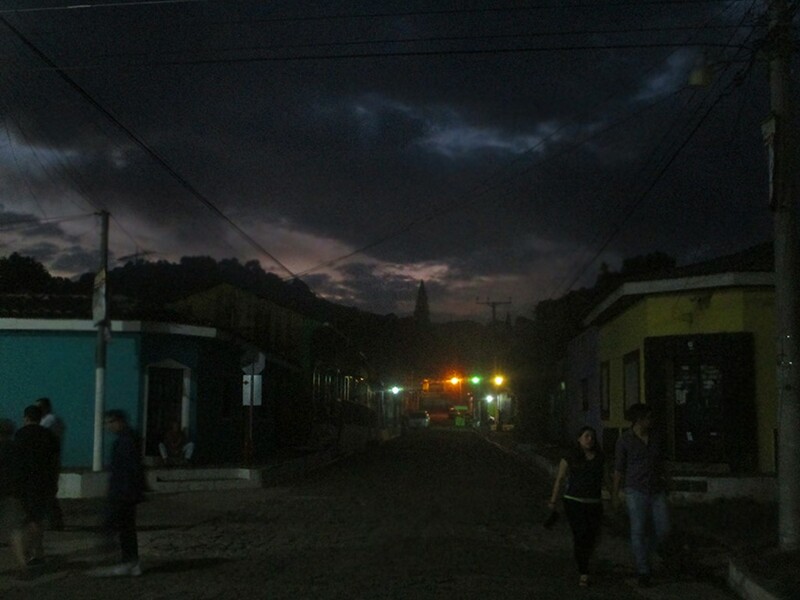 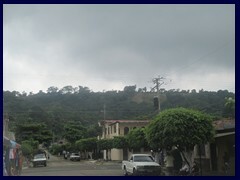 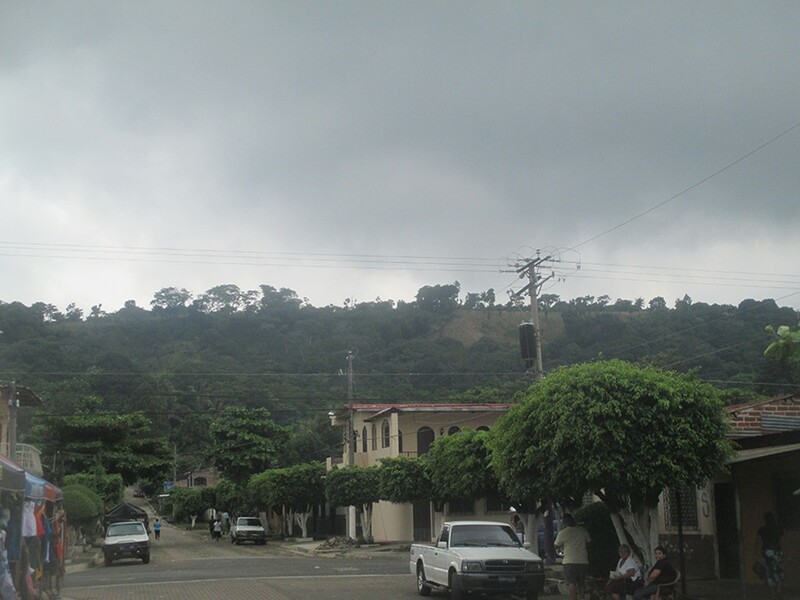 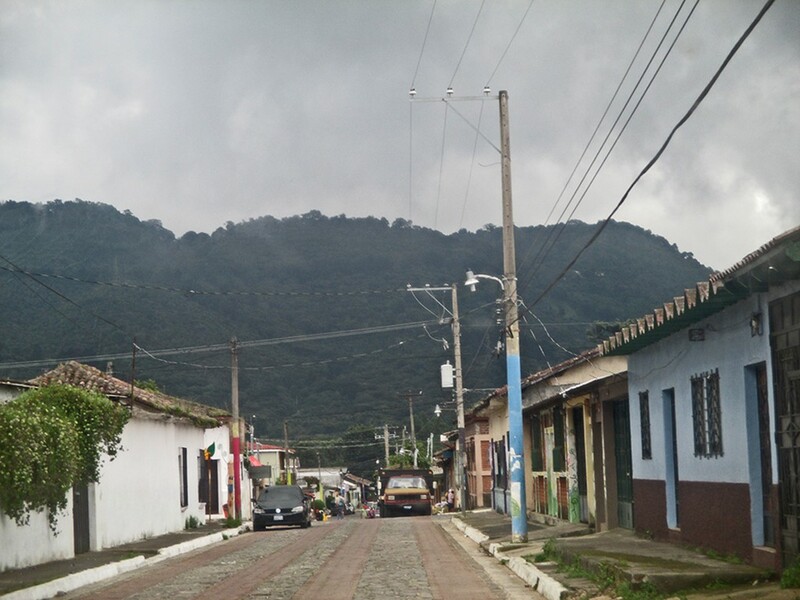 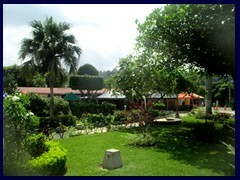 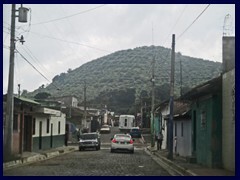 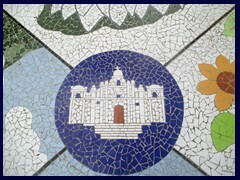 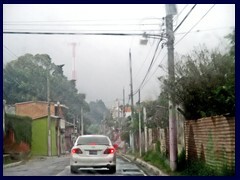 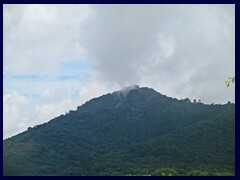 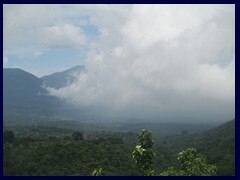 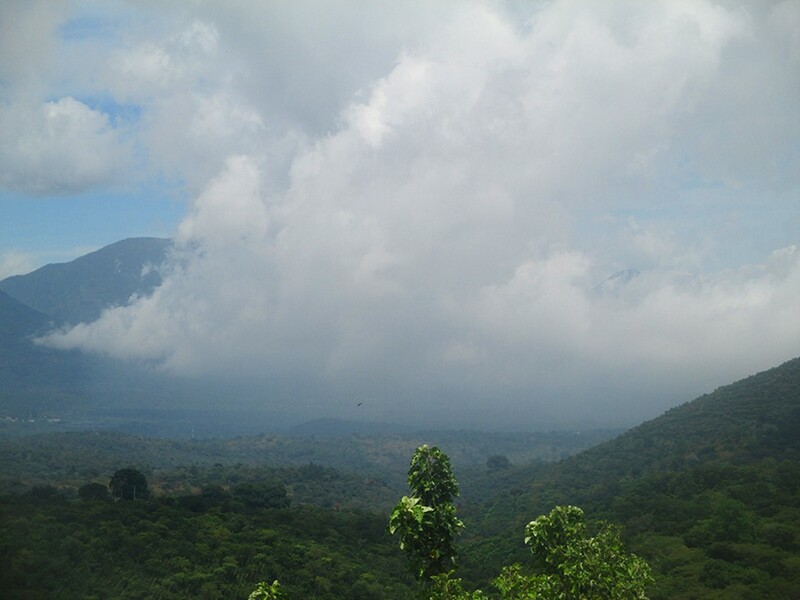 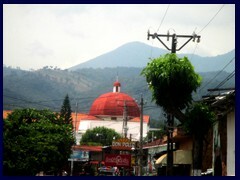 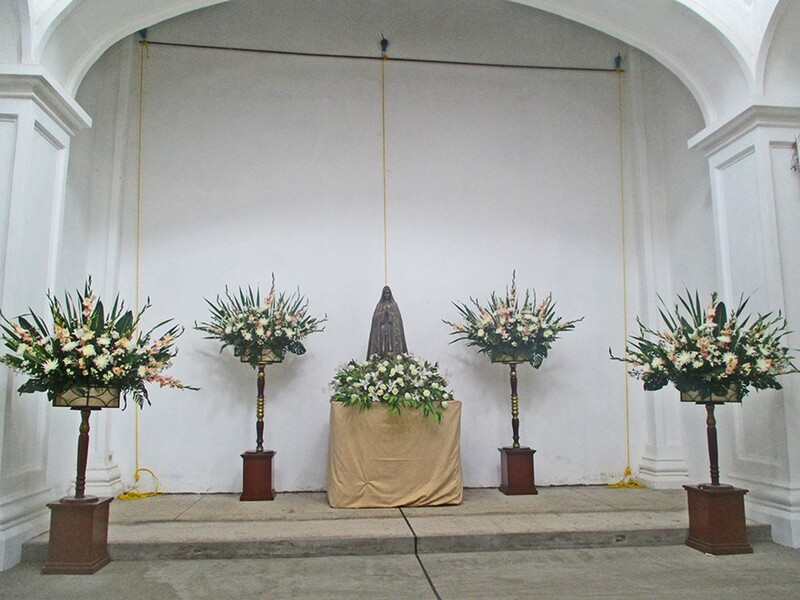 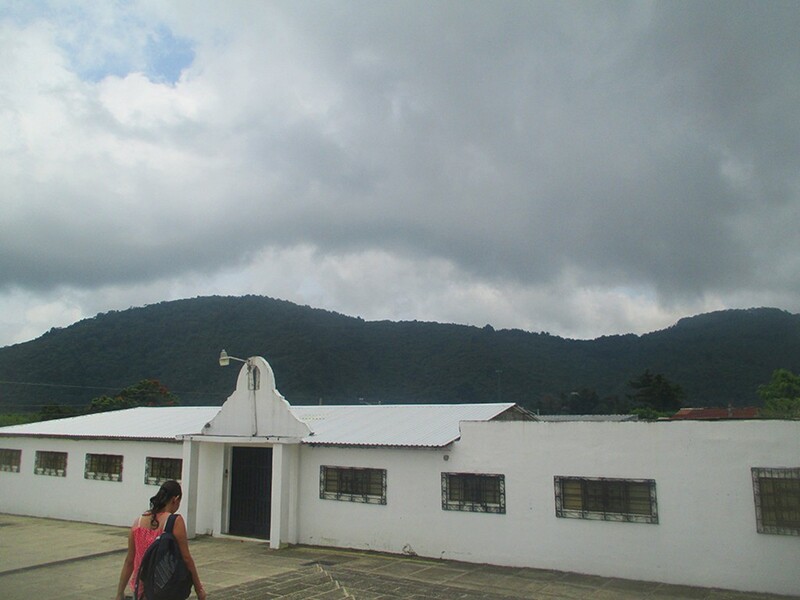 Nahuizalco. 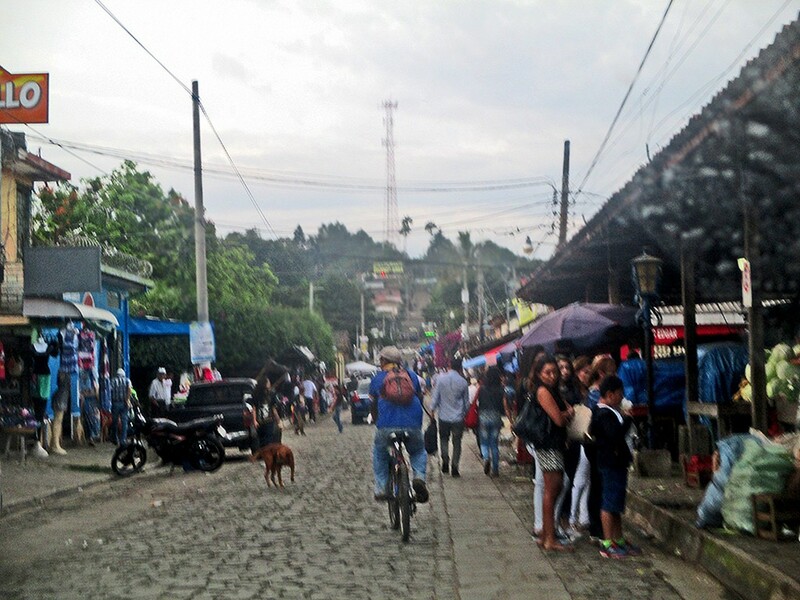 Population: 49 000. 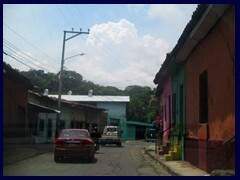 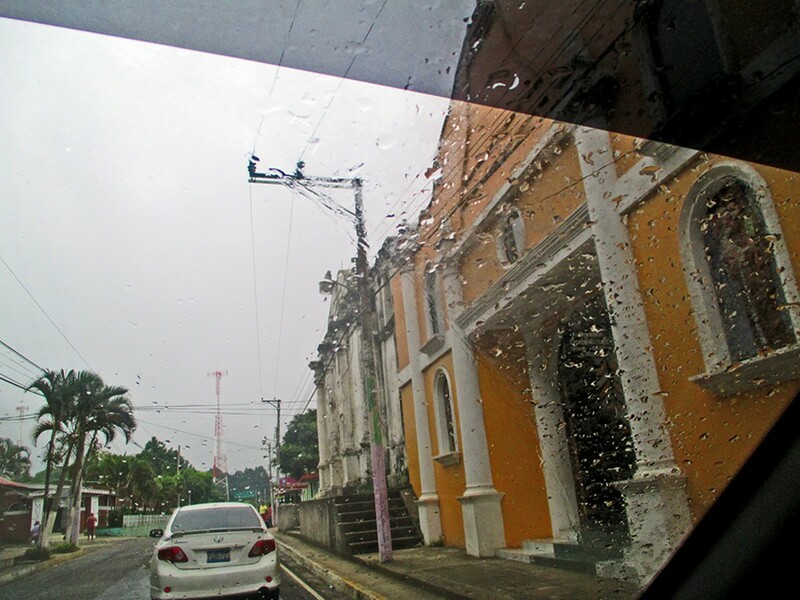 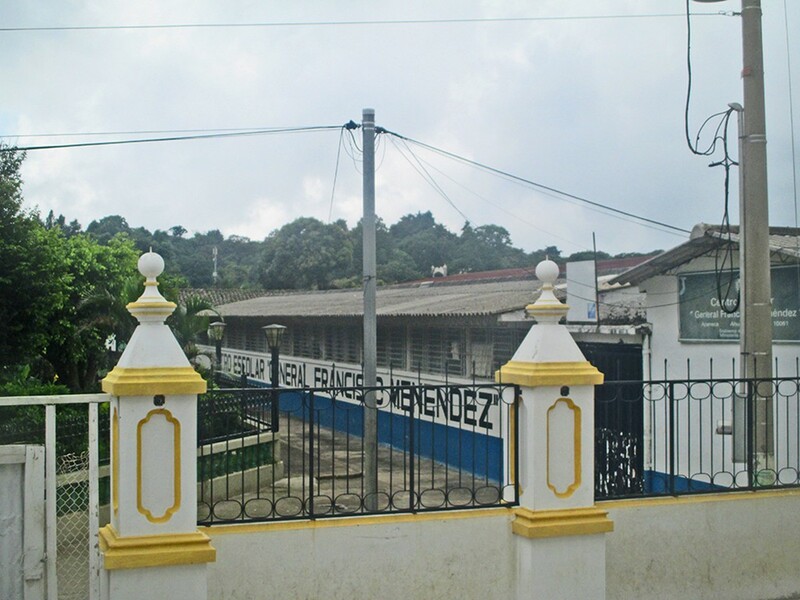 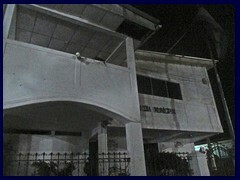 Department: Sonsonate. 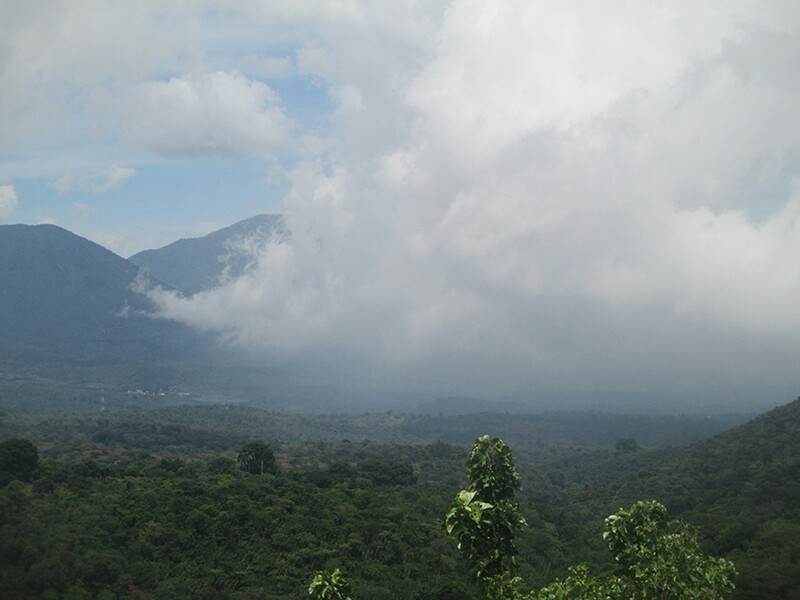 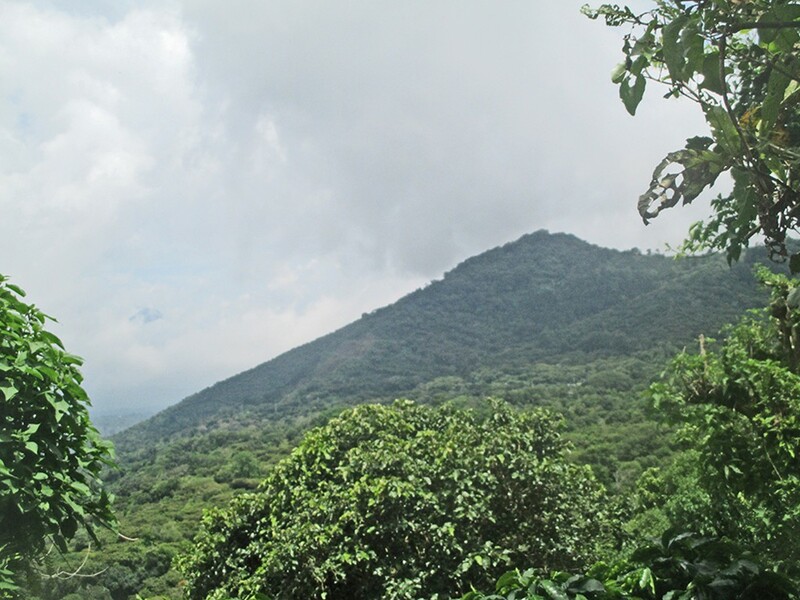 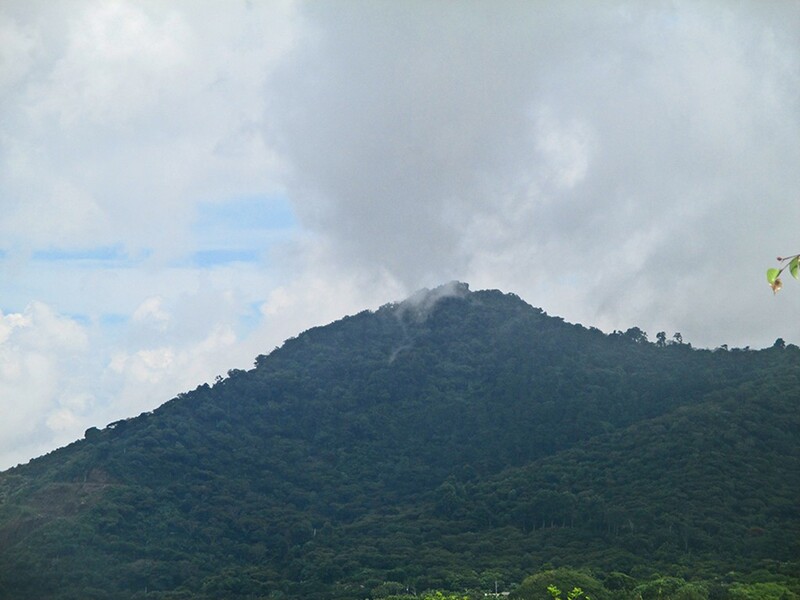 Nahuizalco means i"place of four Izalcos" in the Nahuatl language. 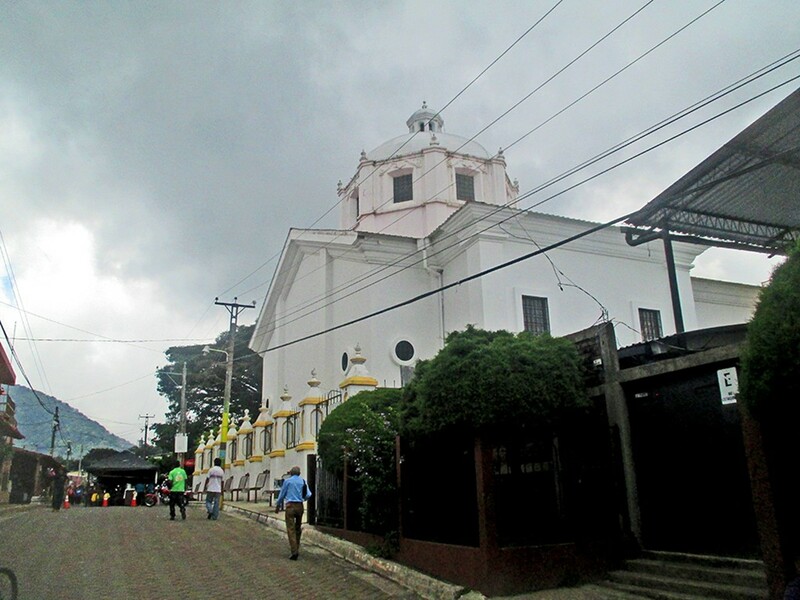 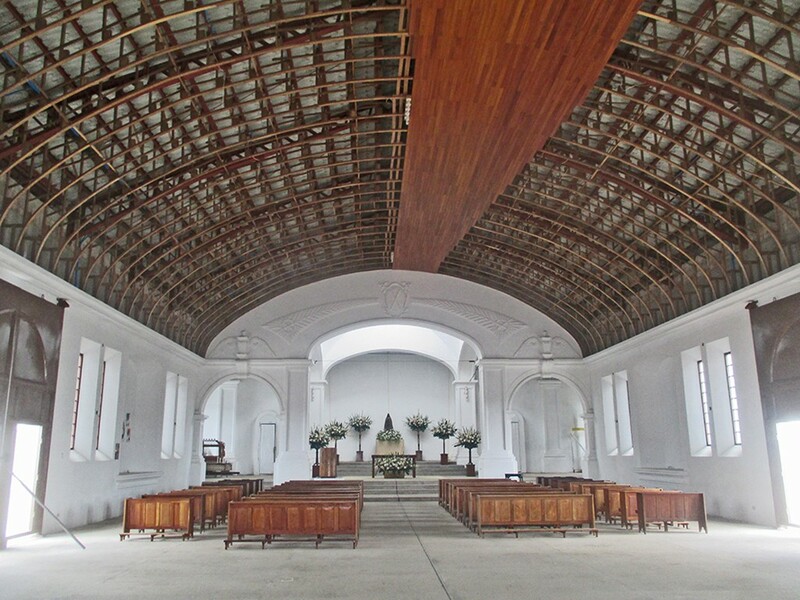 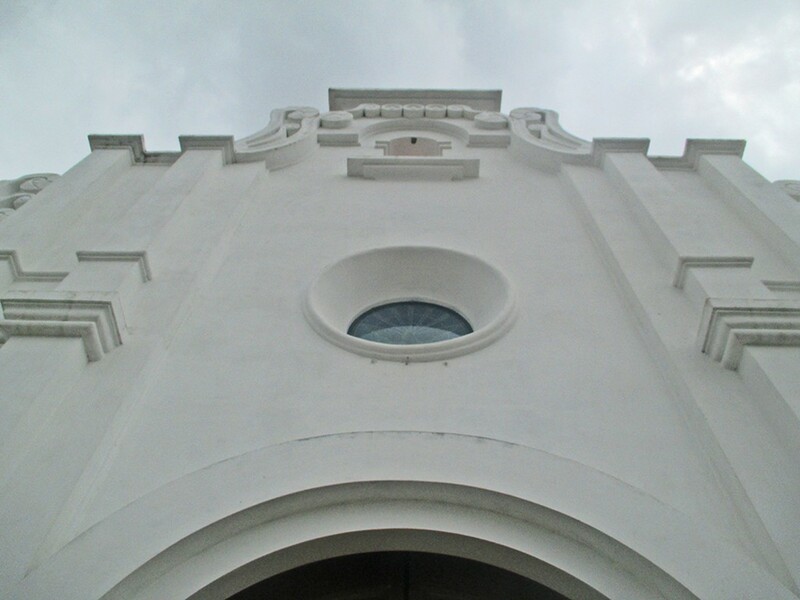 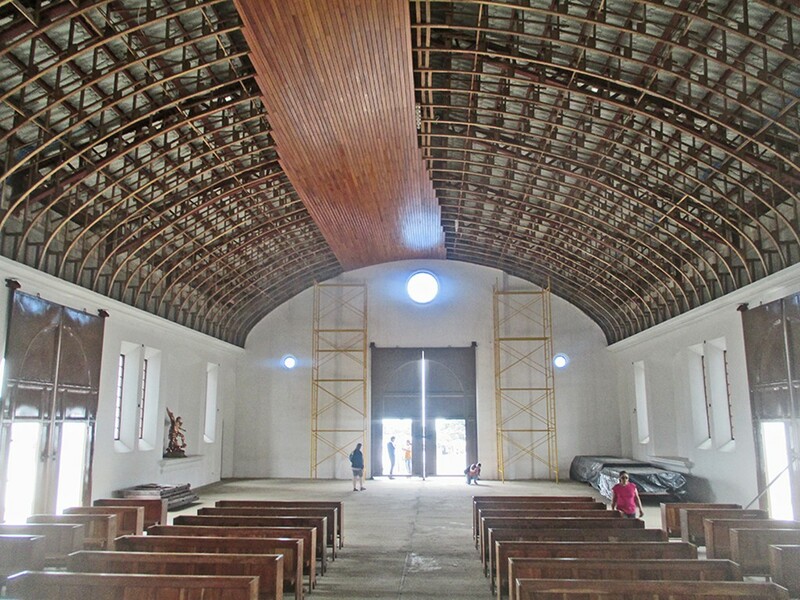 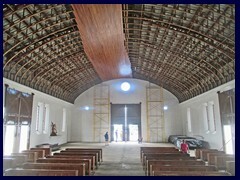 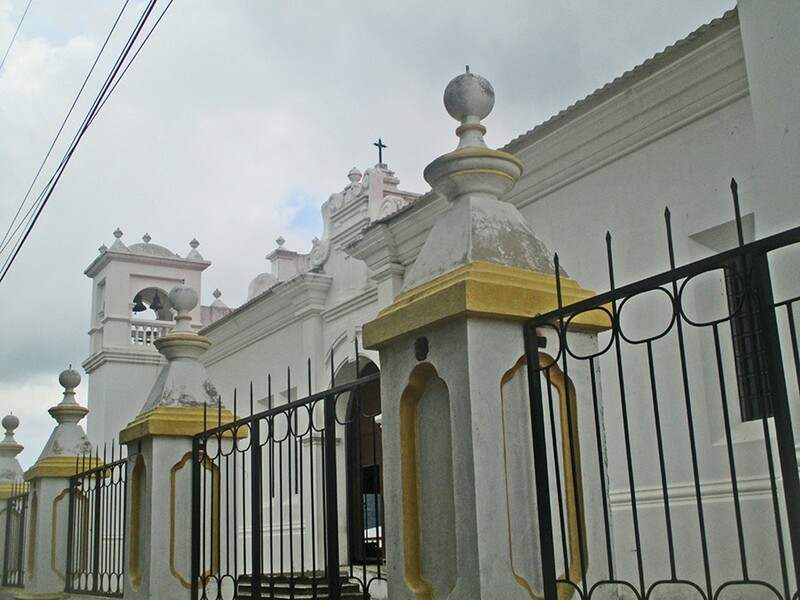 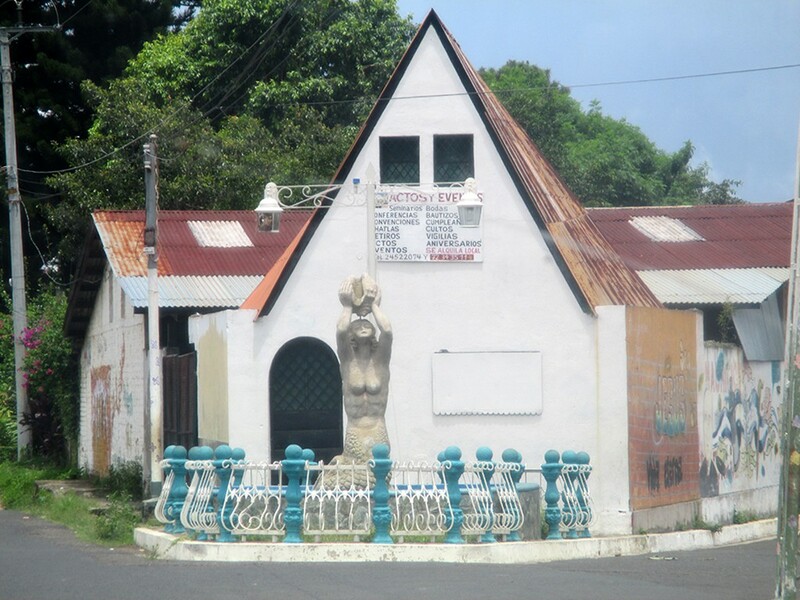 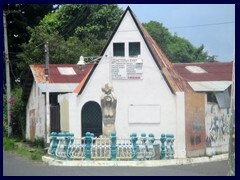 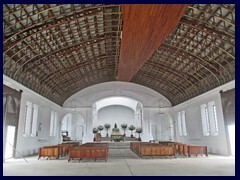 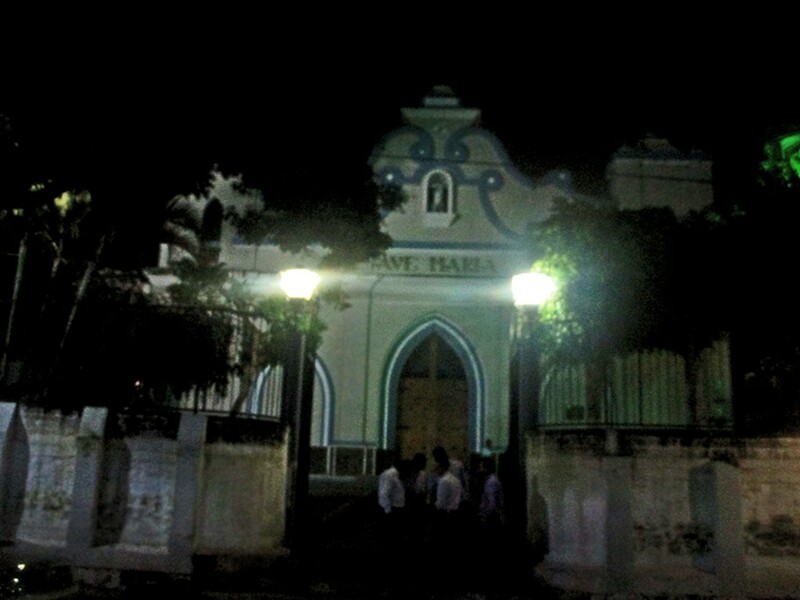 The colonial white church, that is the town's most significant building, was seriously damaged during the earthquake in 2001, and is being restored. 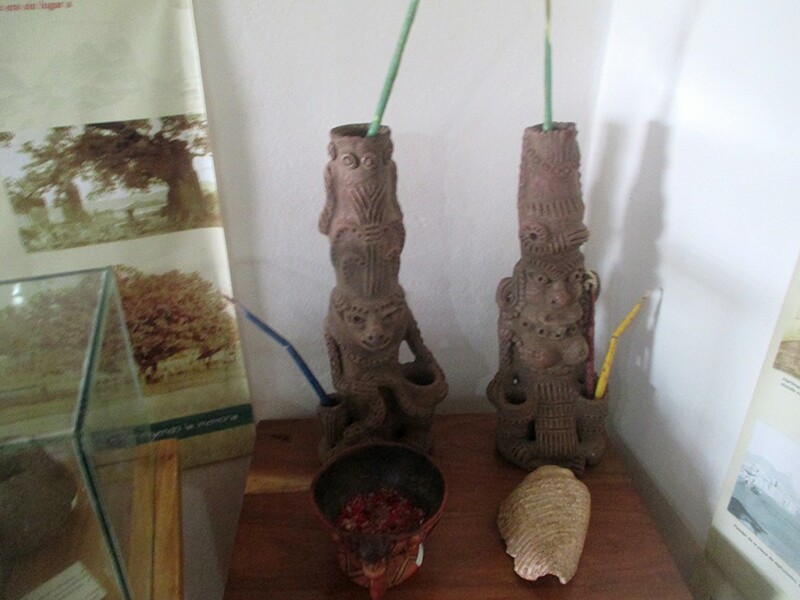 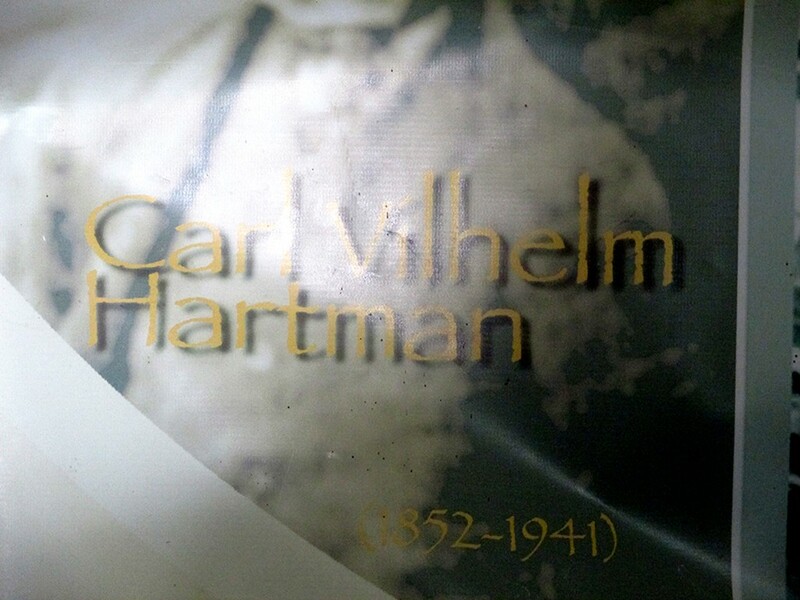 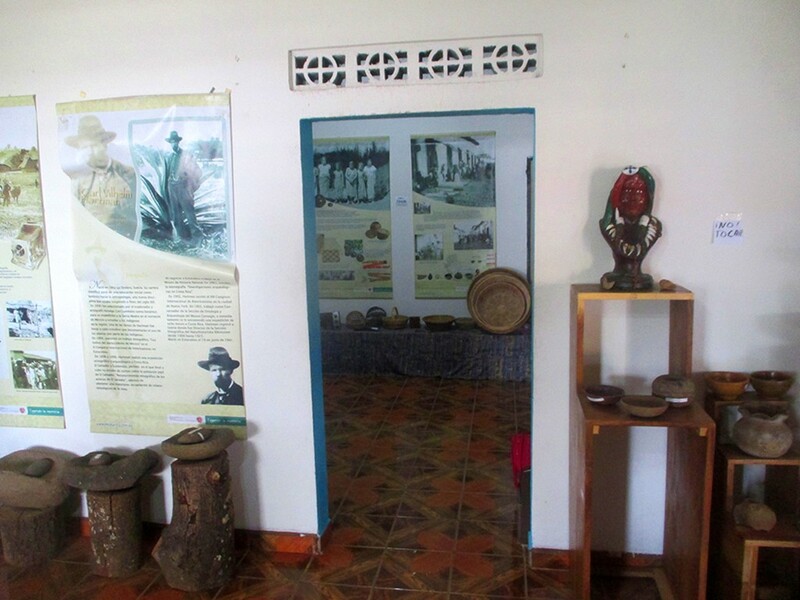 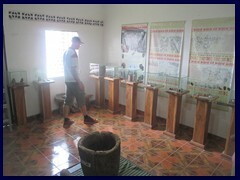 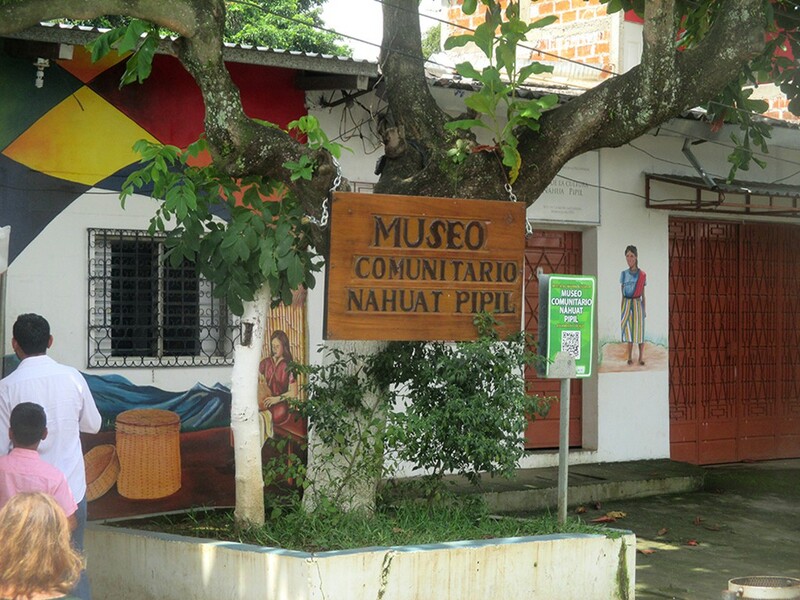 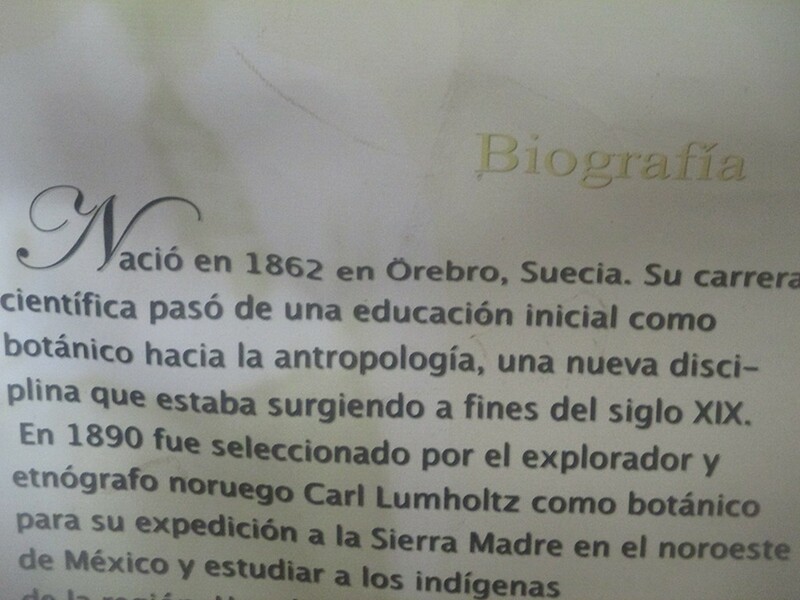 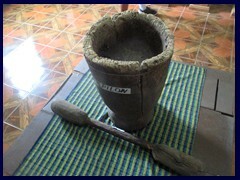 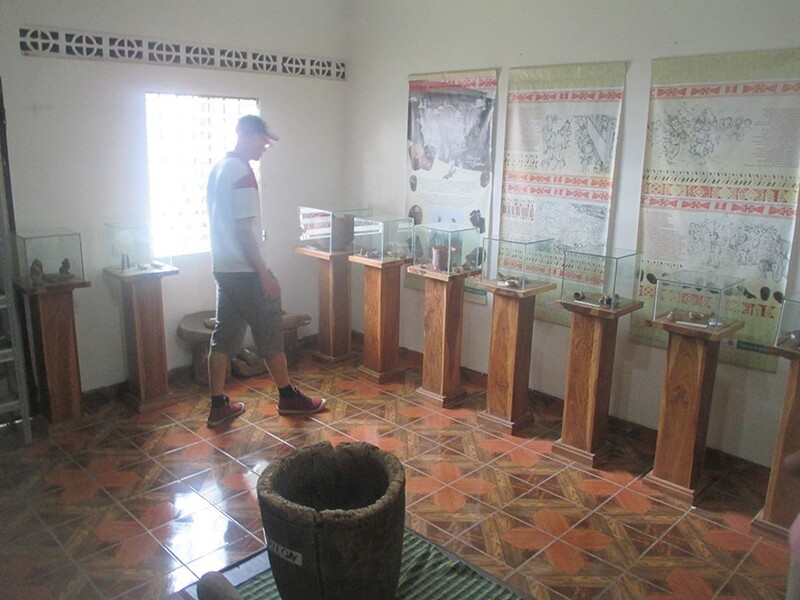 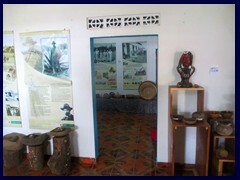 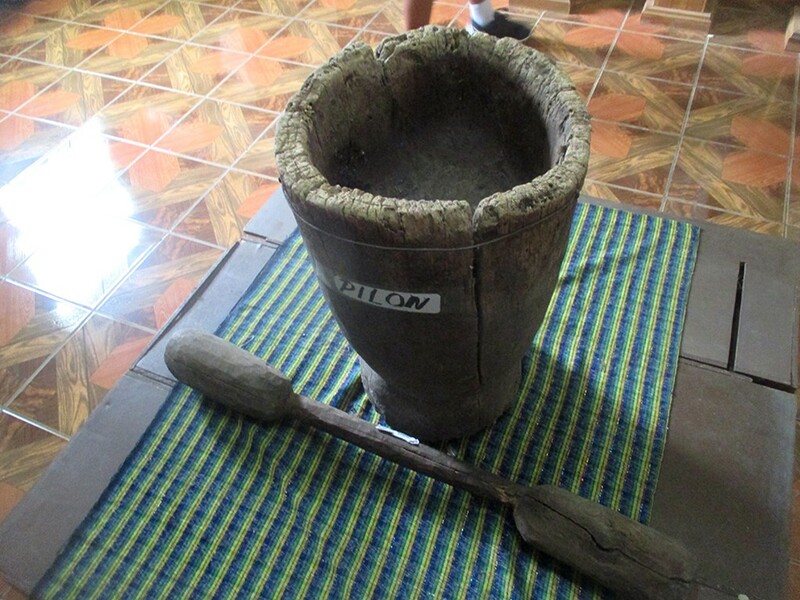 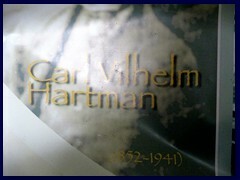 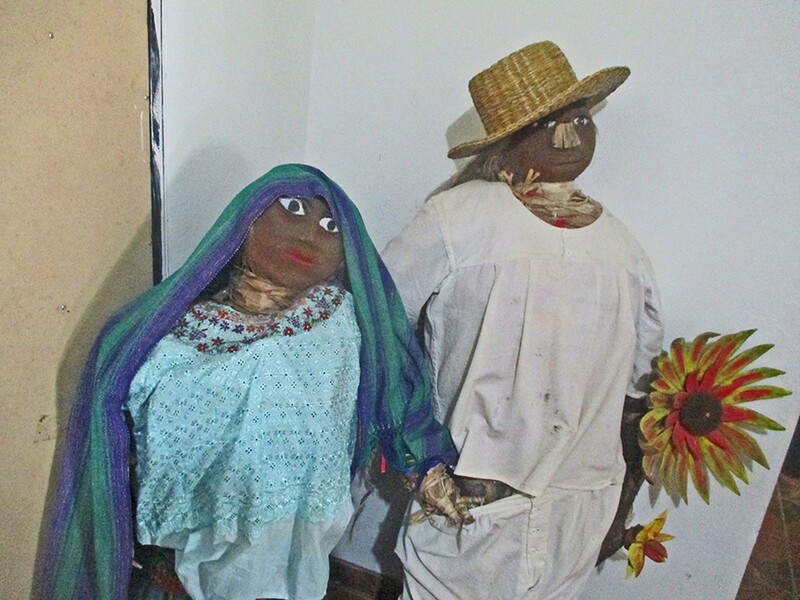 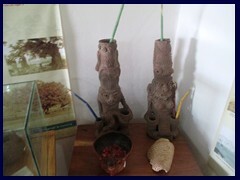 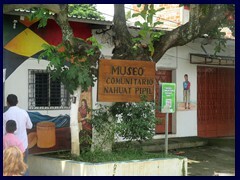 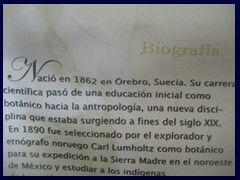 The city has a small museum, with displays of native objects, and some info on Carl Vilhelm Hartman, the Swedish botanist and anthropologist from Örebro, that made exhibtions to El Salvador, Mexico and other Central Amerian countries. 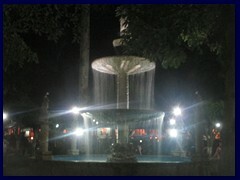 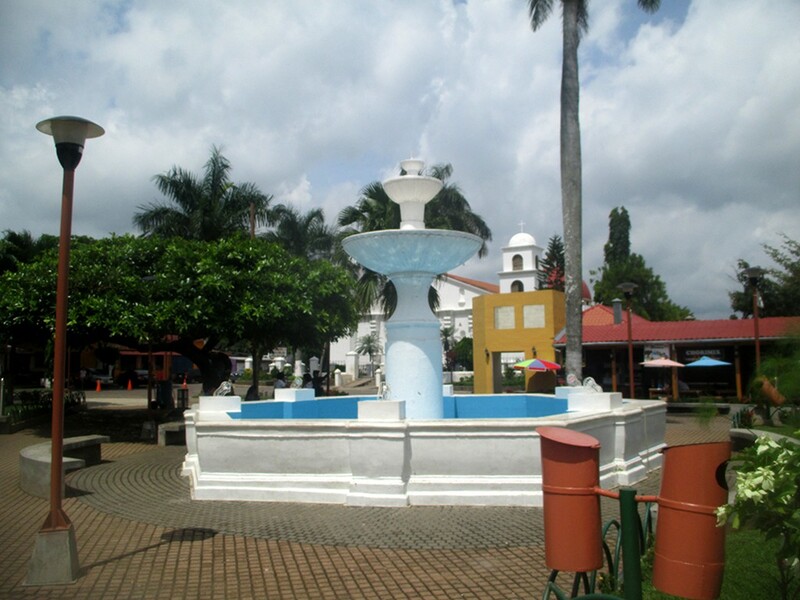 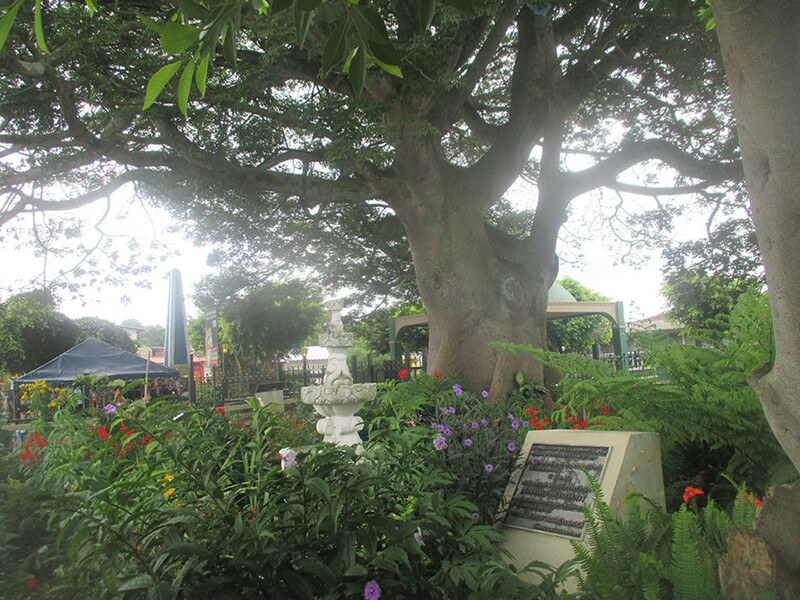 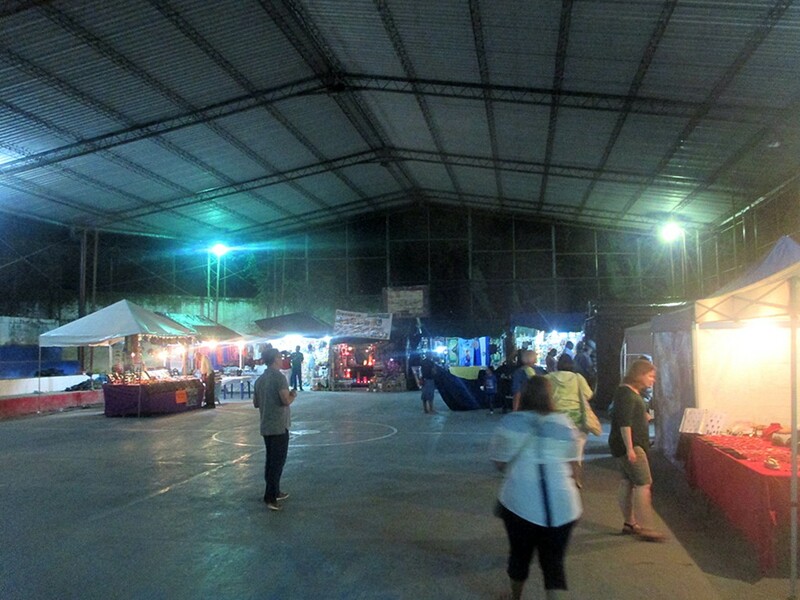 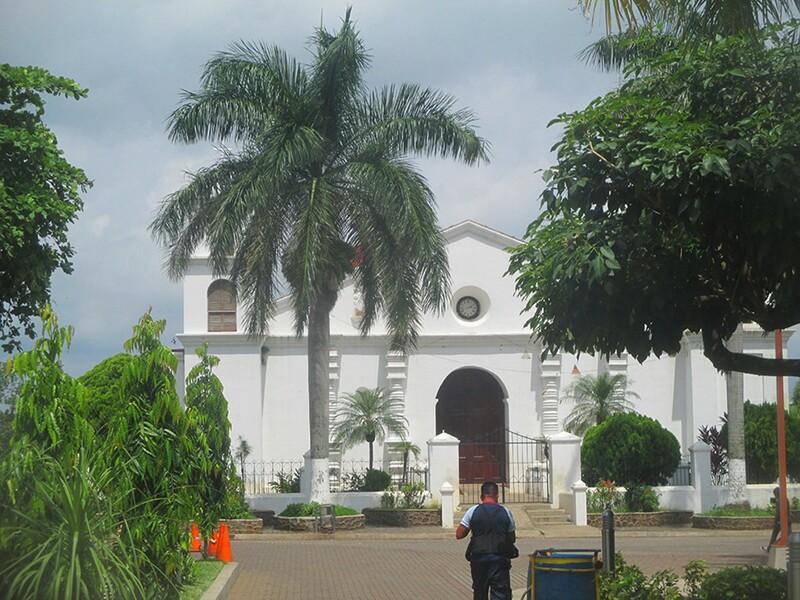 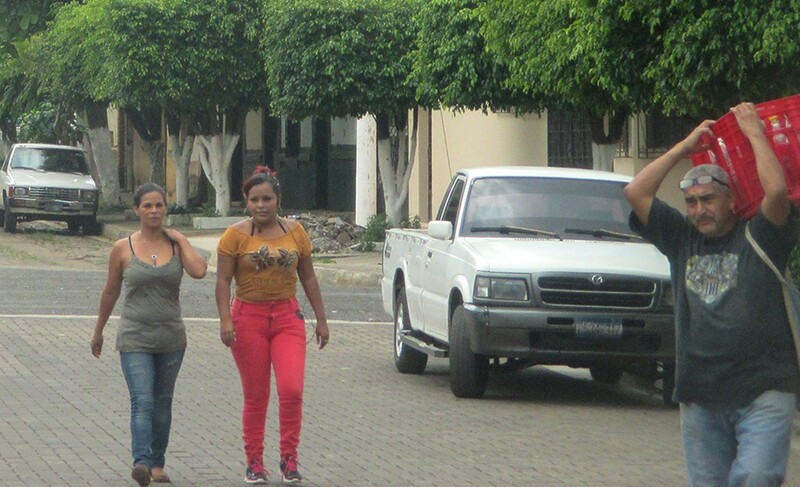 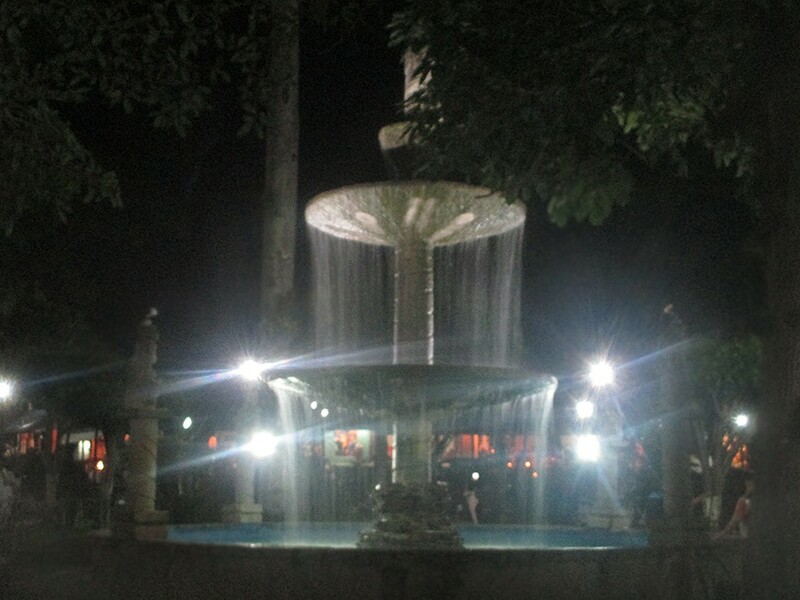 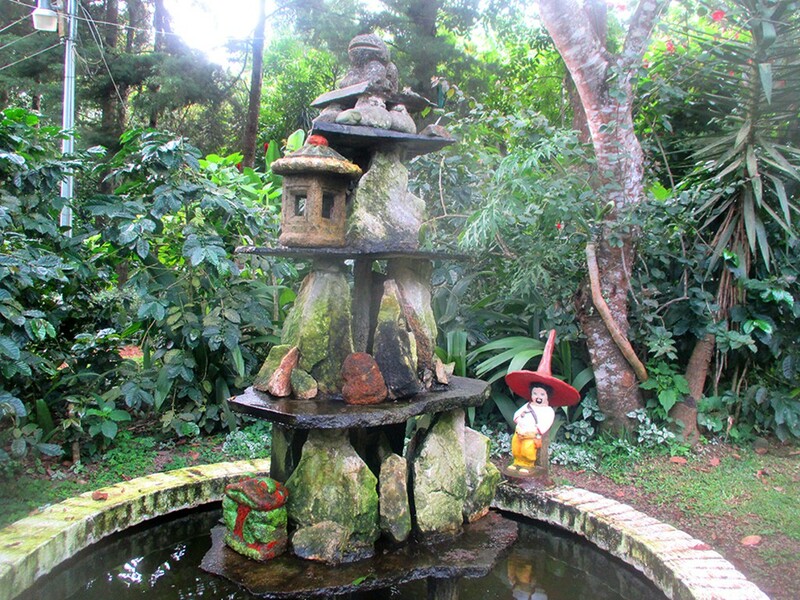 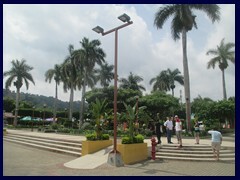 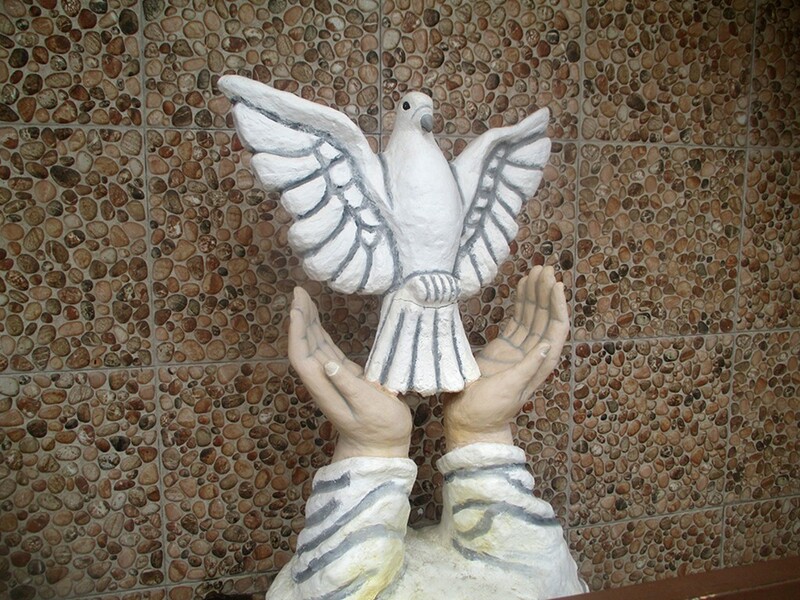 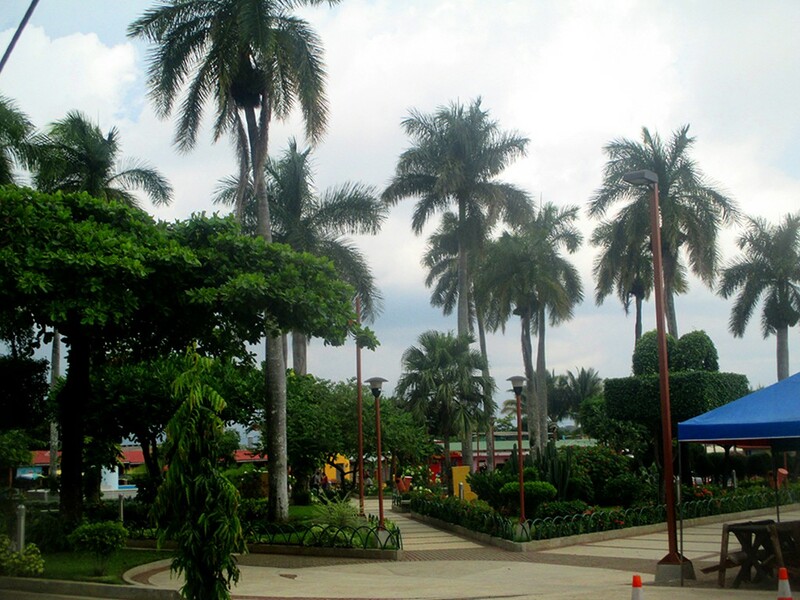 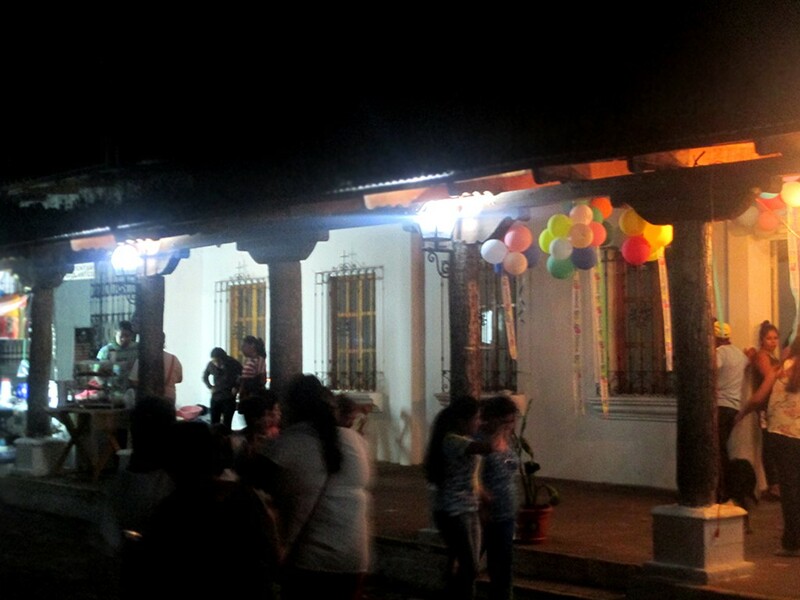 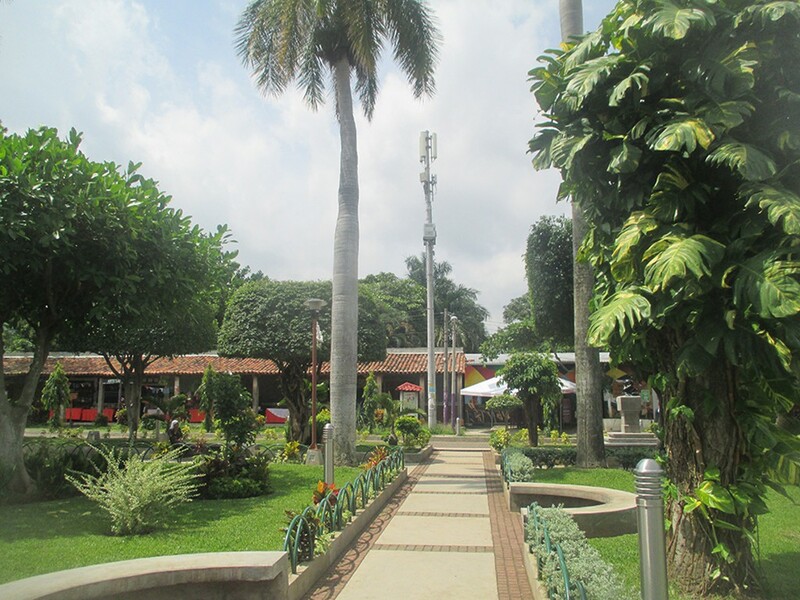 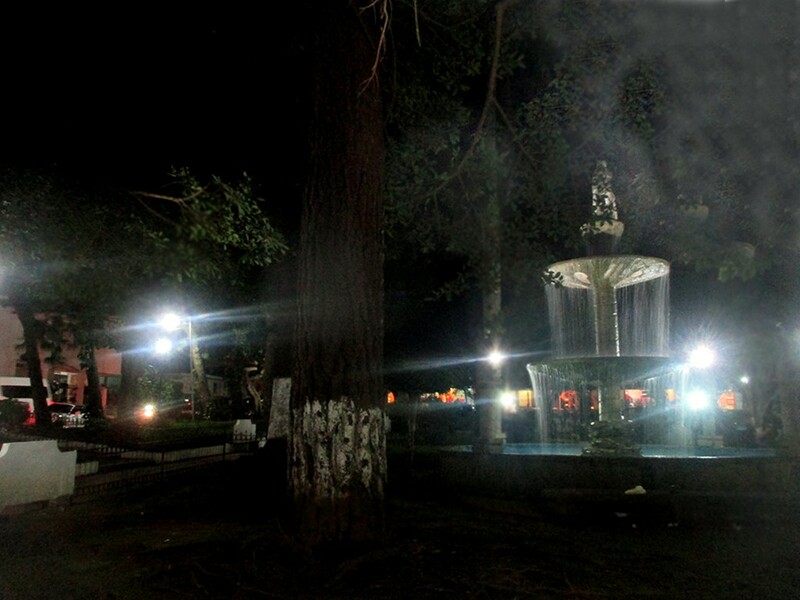 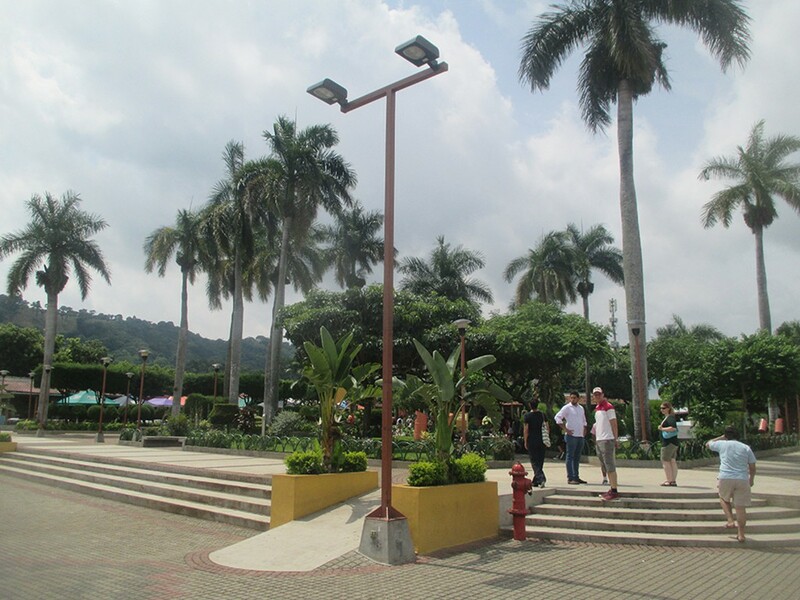 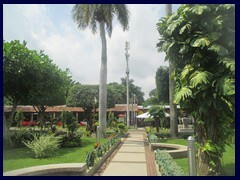 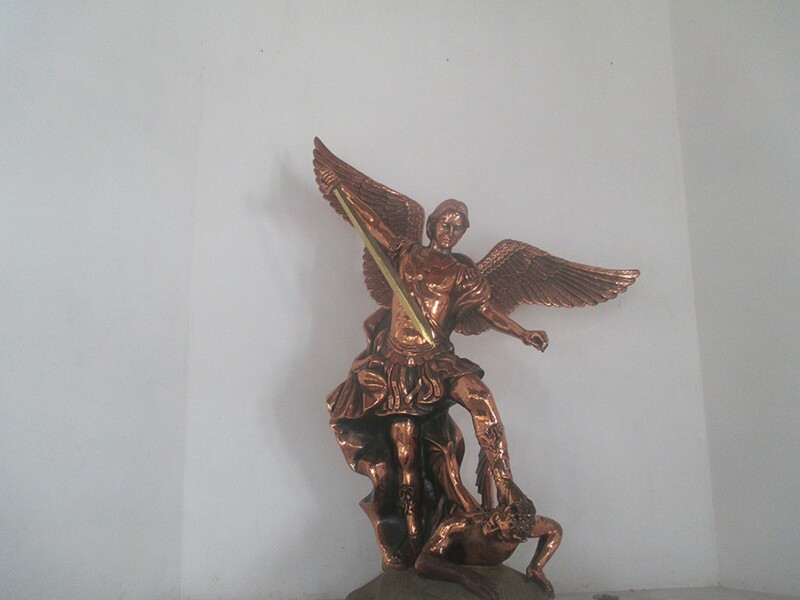 There are also nice, native markets and a beautful, and Parque Municipal, a very green park/plaza with fountains and sculptures, that you can find in most El Salvadorian towns and cities. 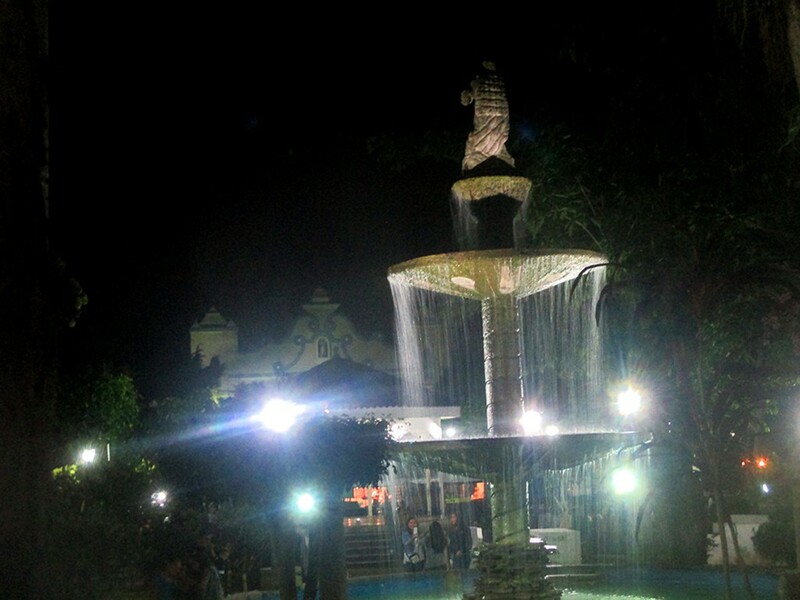 Lourdes. 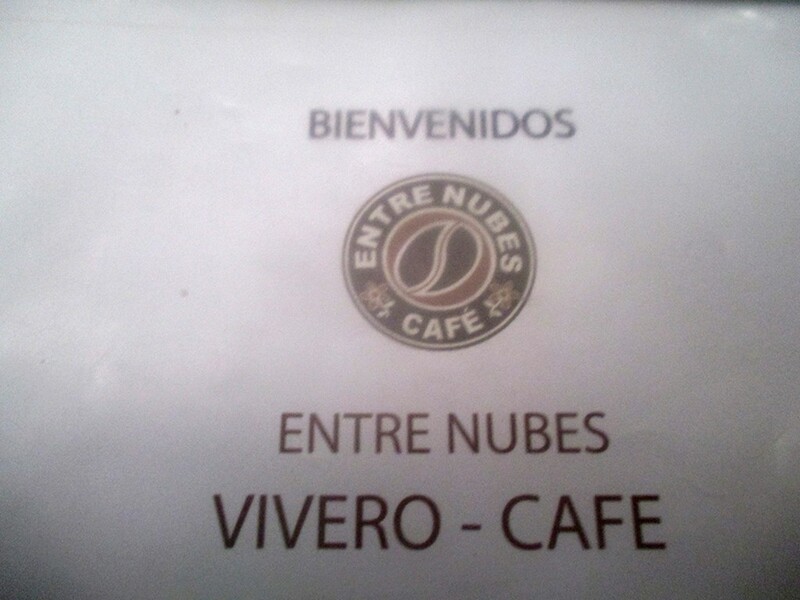 Population: unknown. 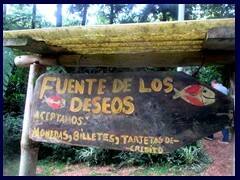 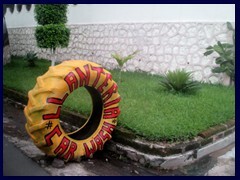 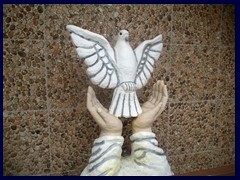 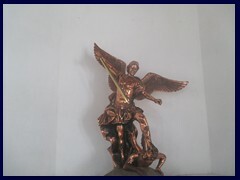 Department: La Libertad. 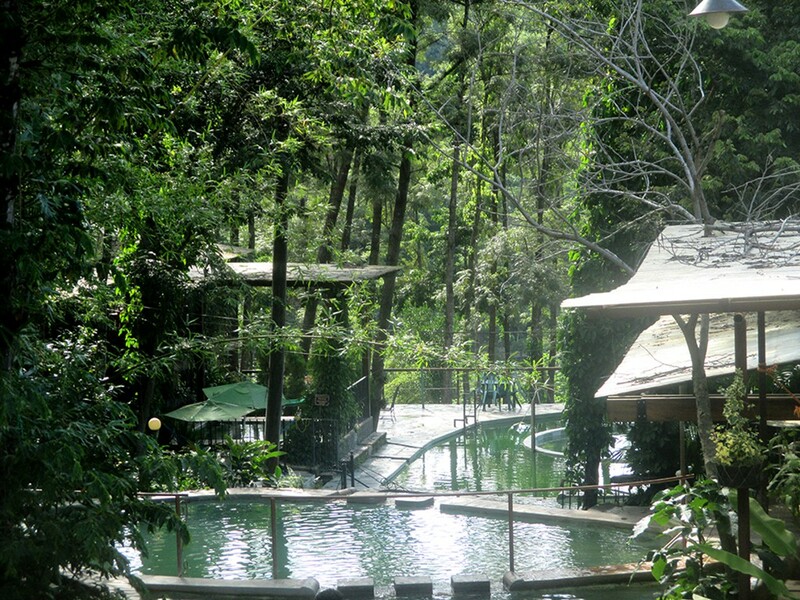 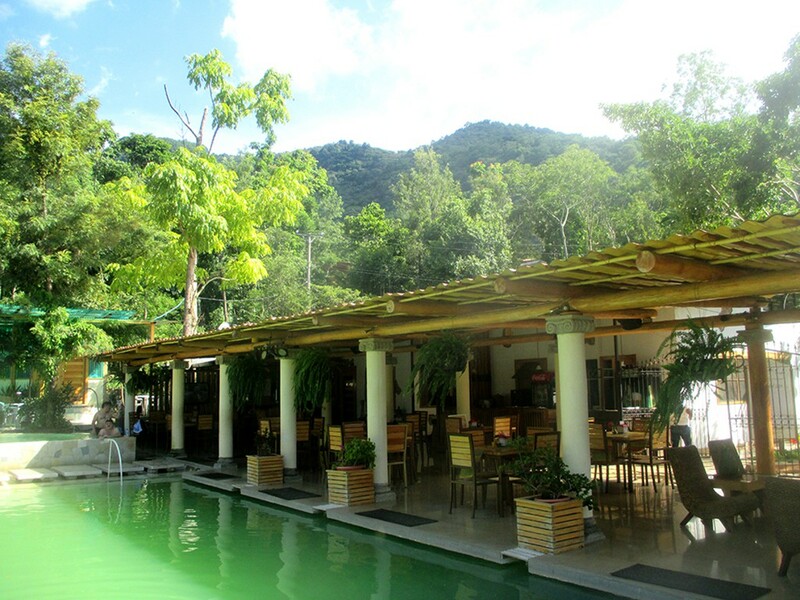 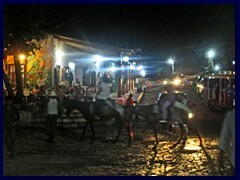 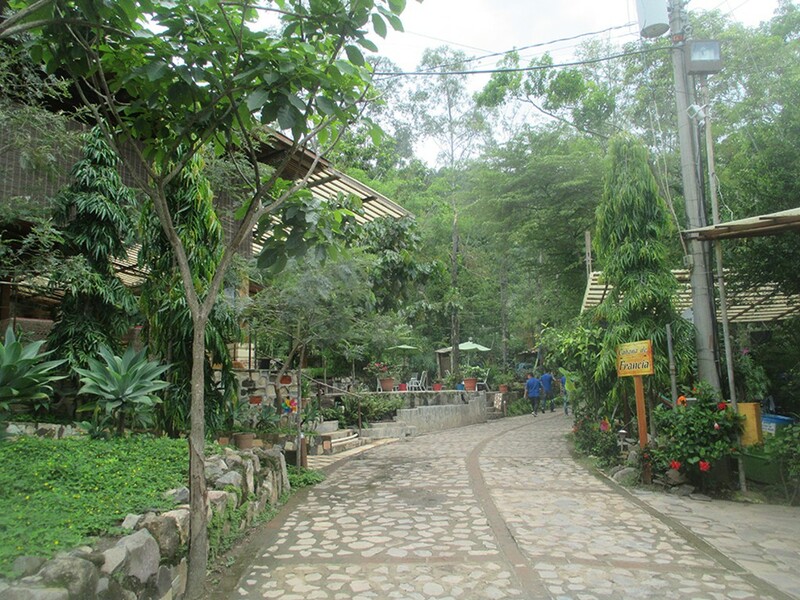 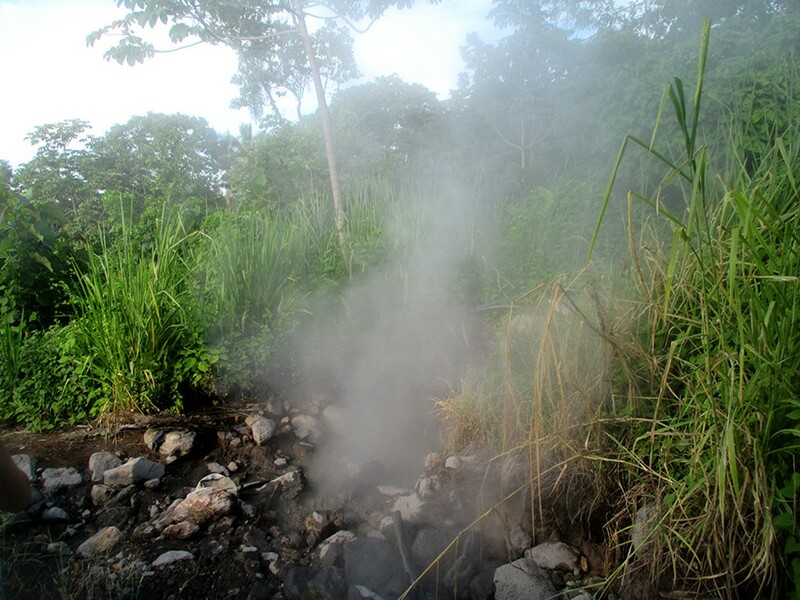 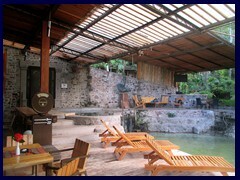 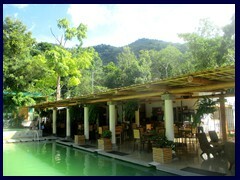 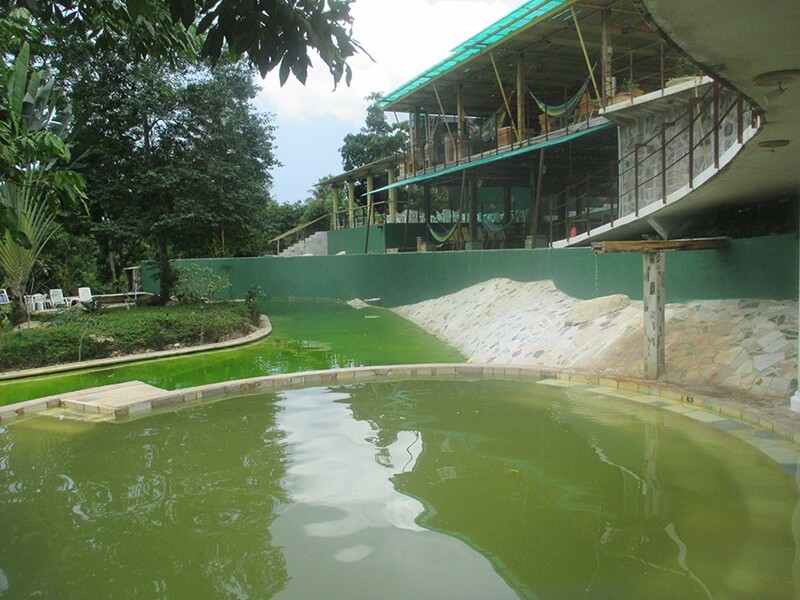 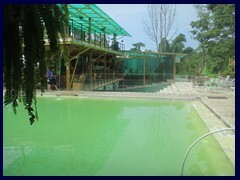 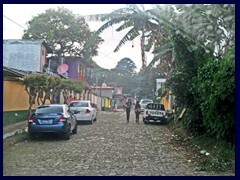 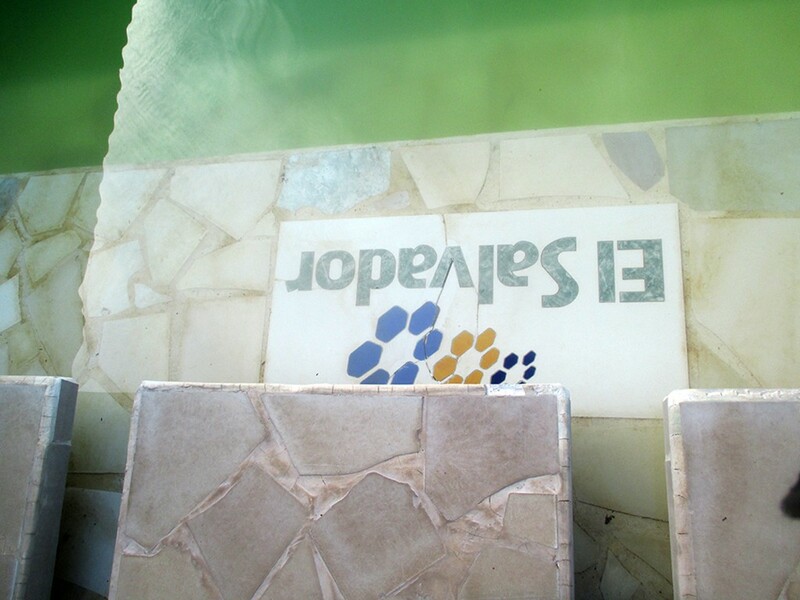 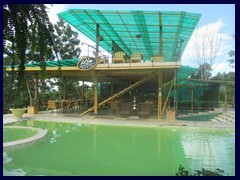 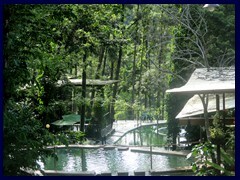 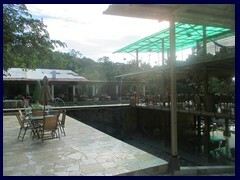 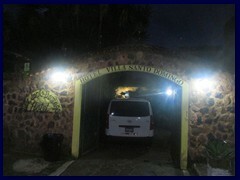 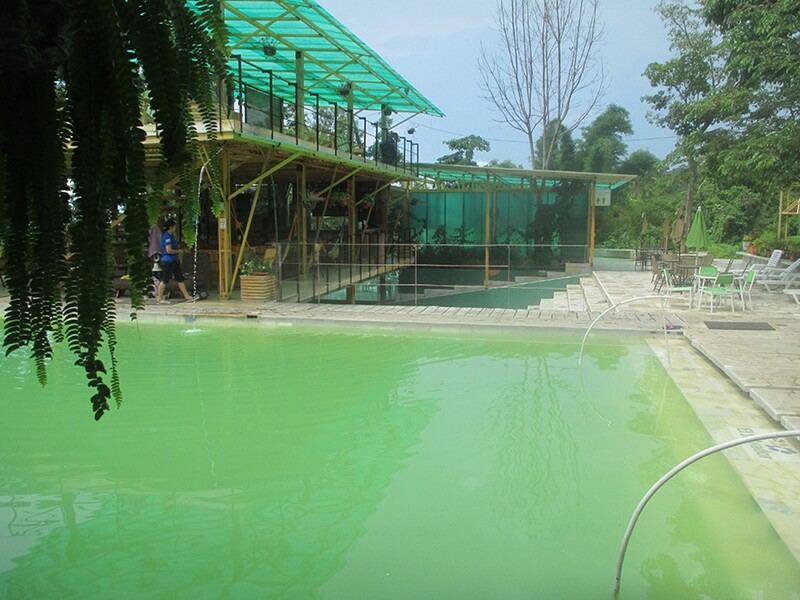 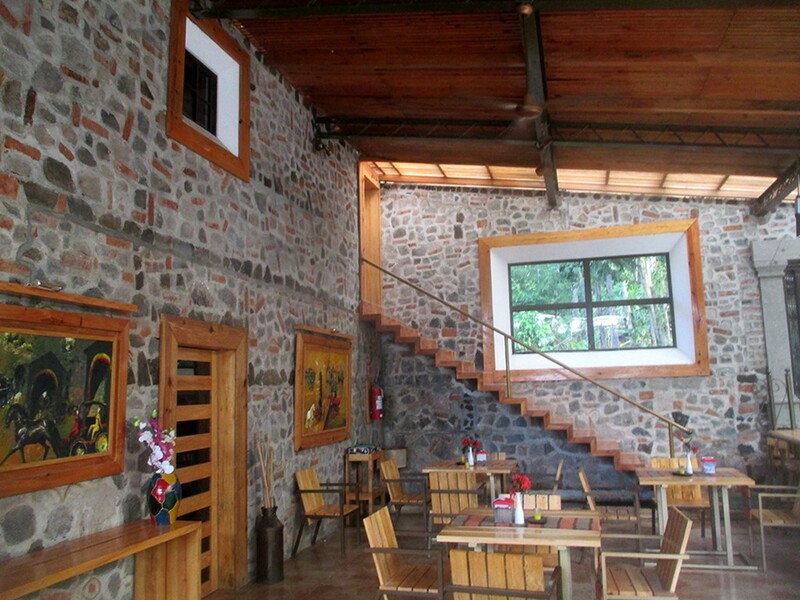 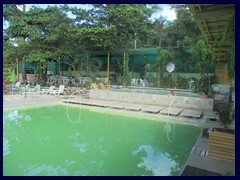 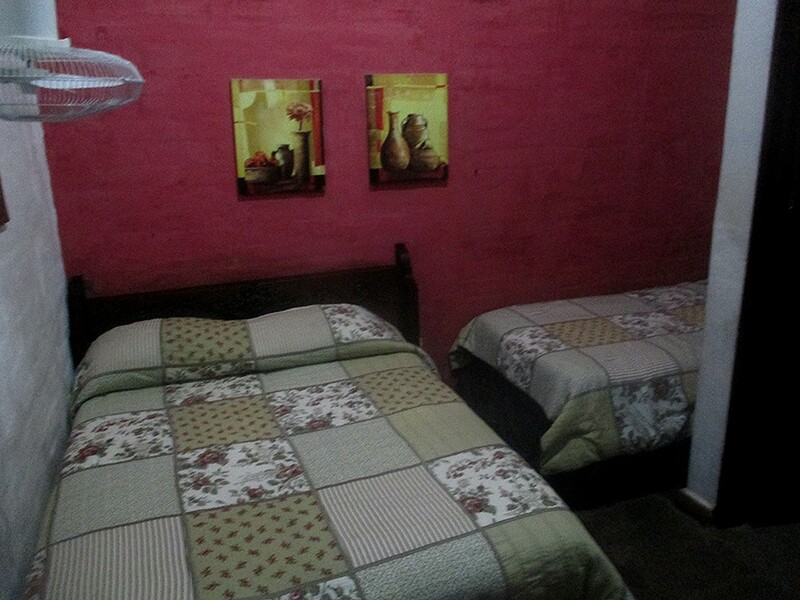 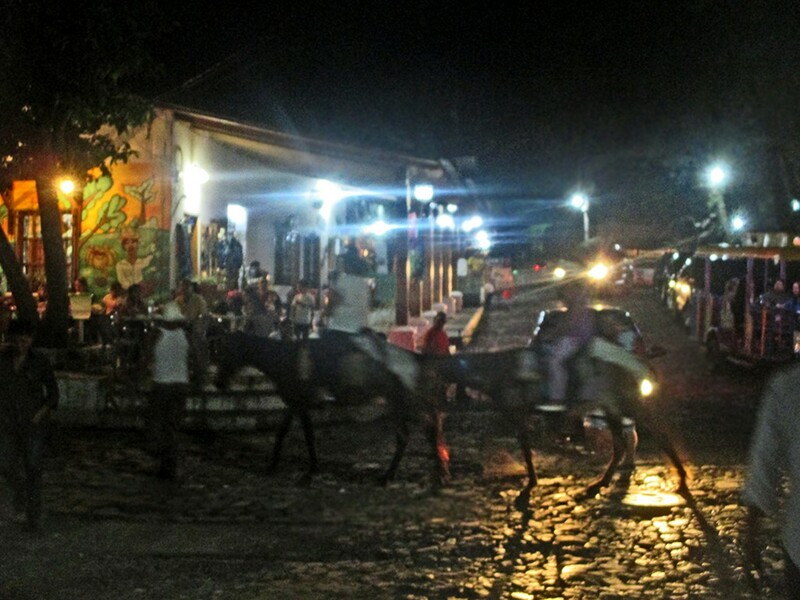 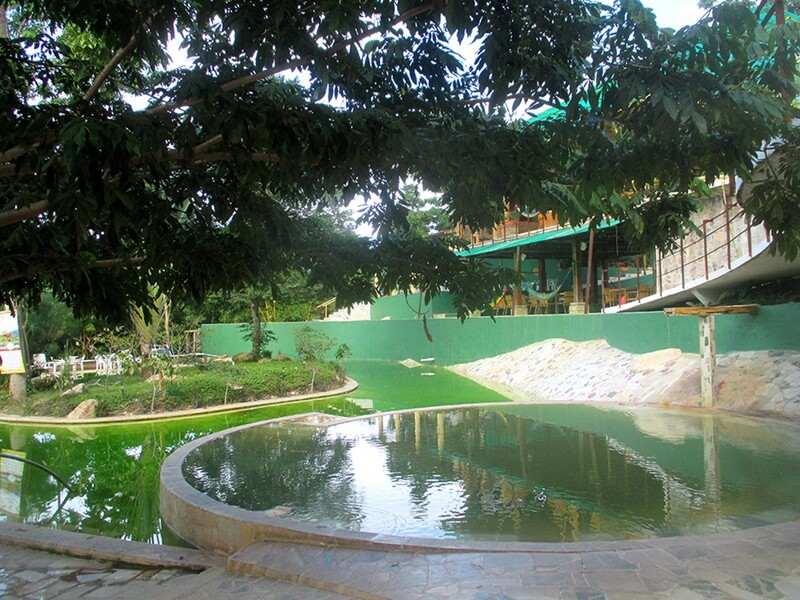 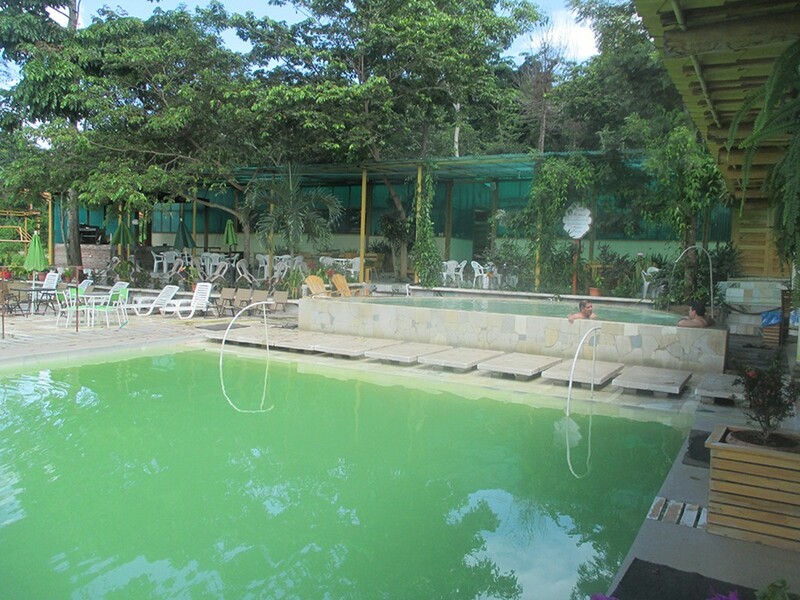 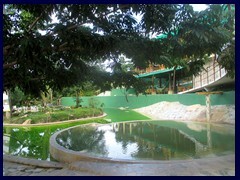 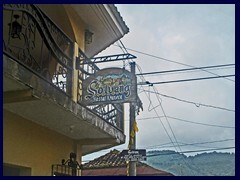 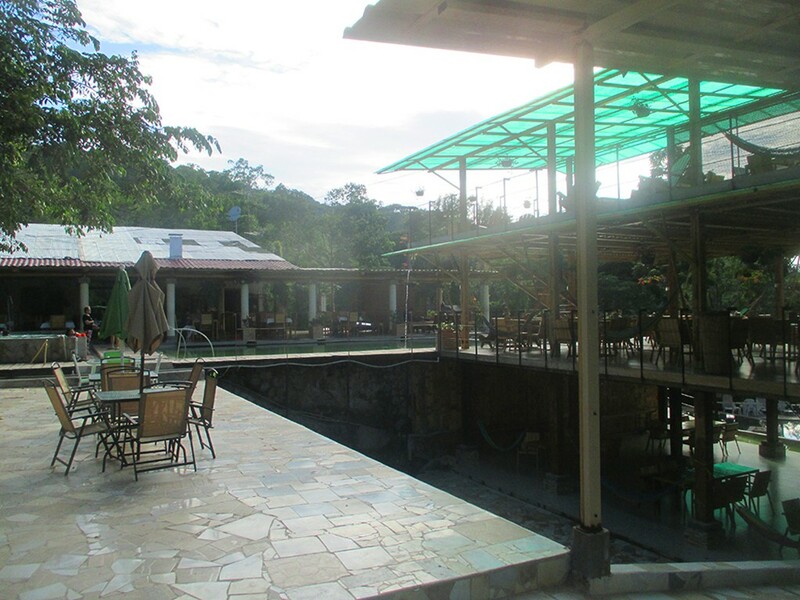 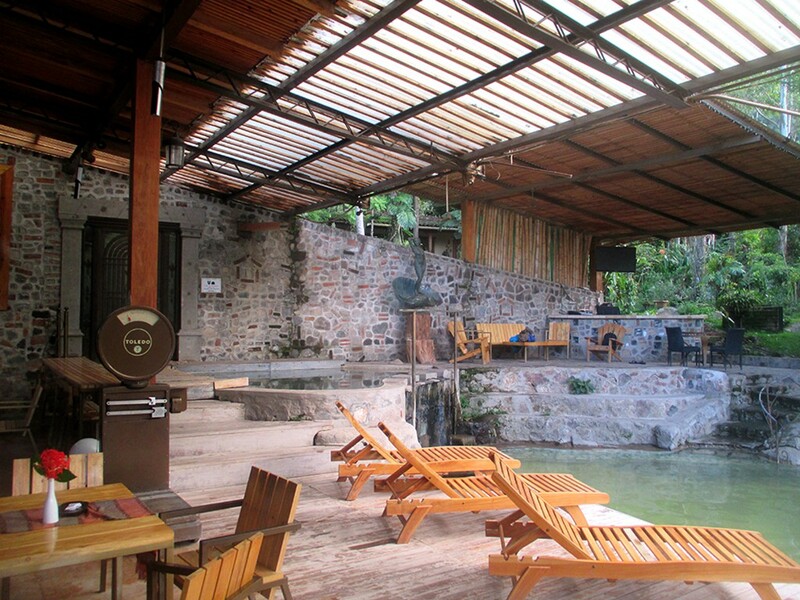 Termales de Santa Teresa is a nice hot springs complex with both warm and cold natural thermal bathes, good restaurants, bars, a hotel and fancy buildings. 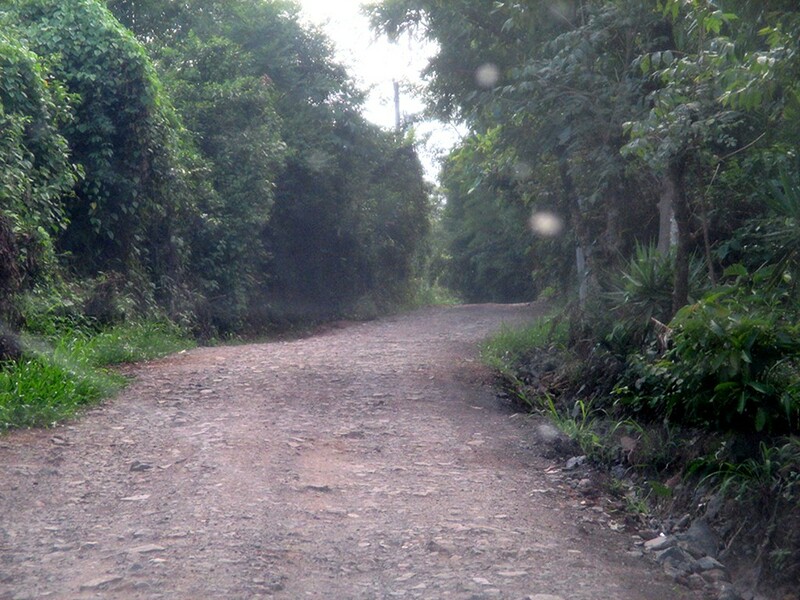 But it is very hard to find, and despite its luxorious appearance, it is in the middle of nowhere in a very poor area, so the roads are in extremely bad condition. 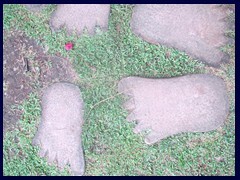 Even the parking lot leaves much left to wish for. 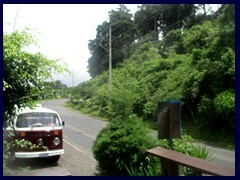 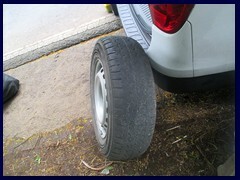 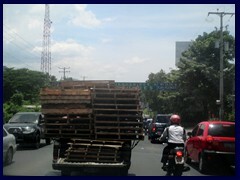 It is when we were driving to this place that we got a flat tire. 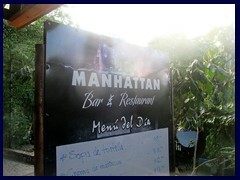 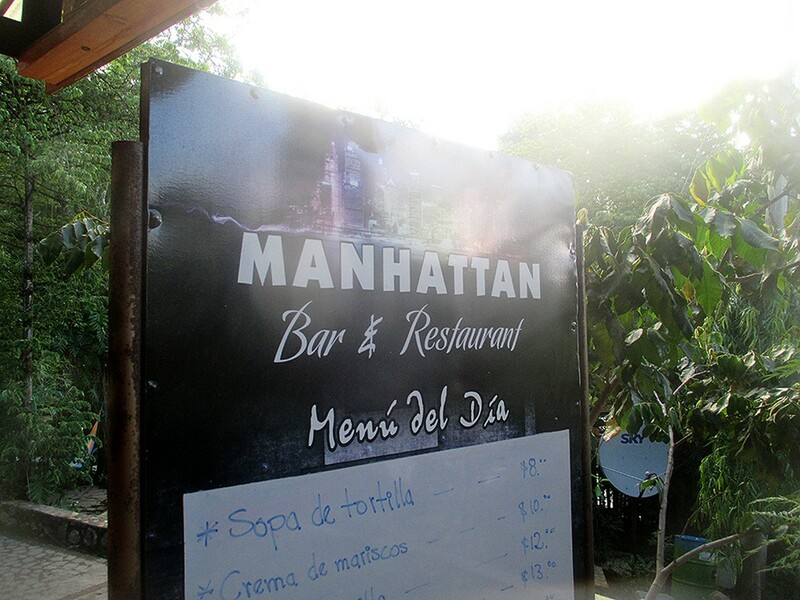 It is really a contrast to see something called "Manhattan Bar", that even looks fancy in the middle of this poor, rundown area! 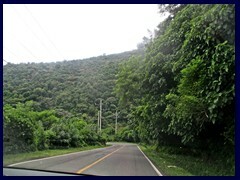 Once you get there, it is highly recommended to use the highway and not small roads, this place is really beautiful and relaxing.